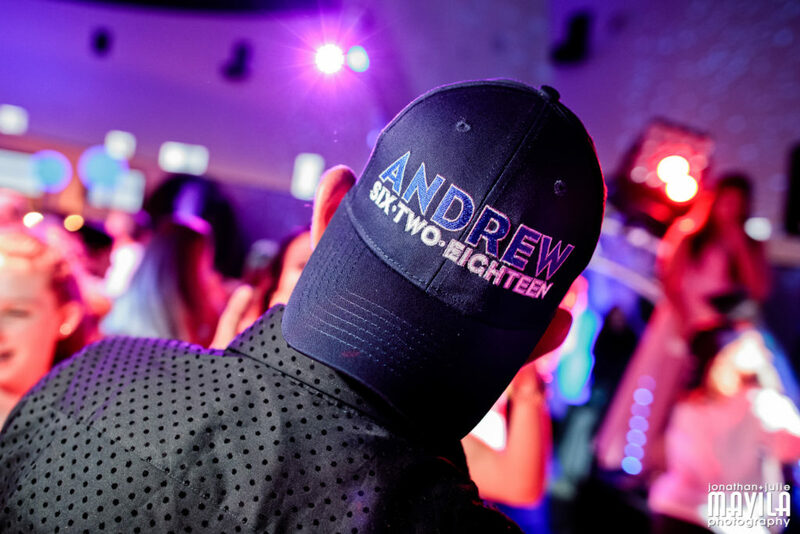 Two brothers, two personalities, and one kick a@# party was had! 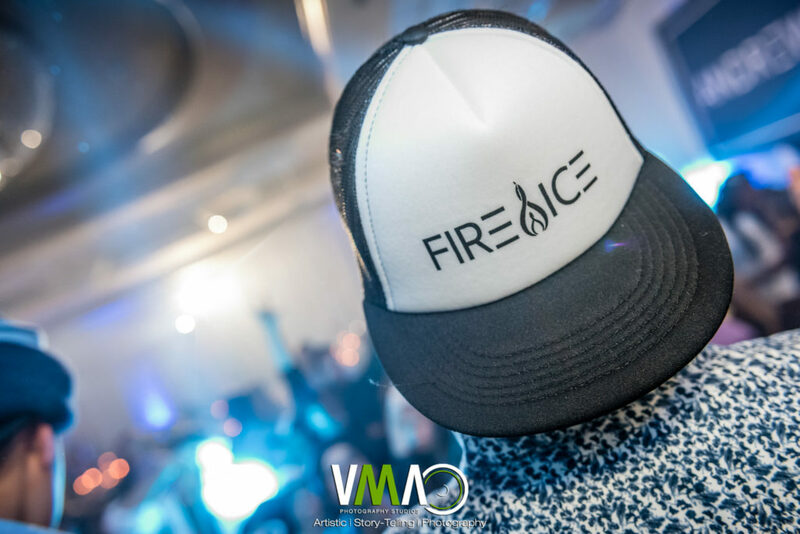 From the start, we couldn’t agree more that “Fire & Ice” was a great theme for this dynamic duo. 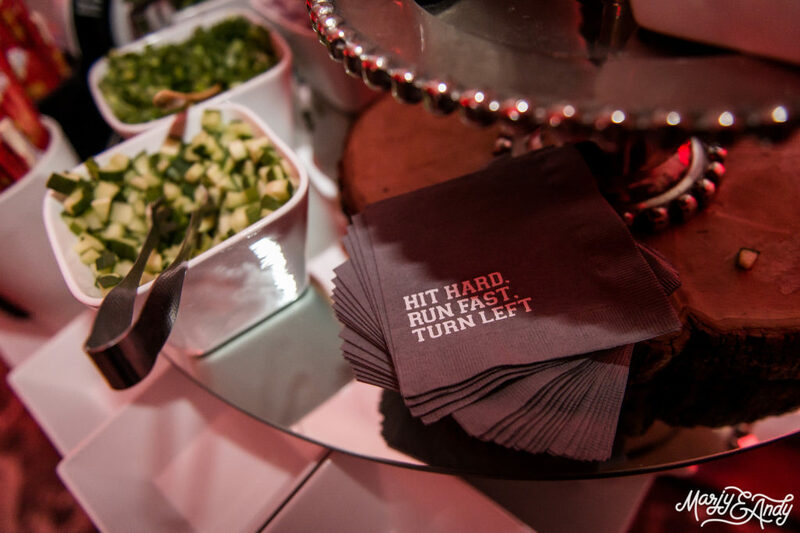 We also knew that we had to have those two key elements throughout the party. 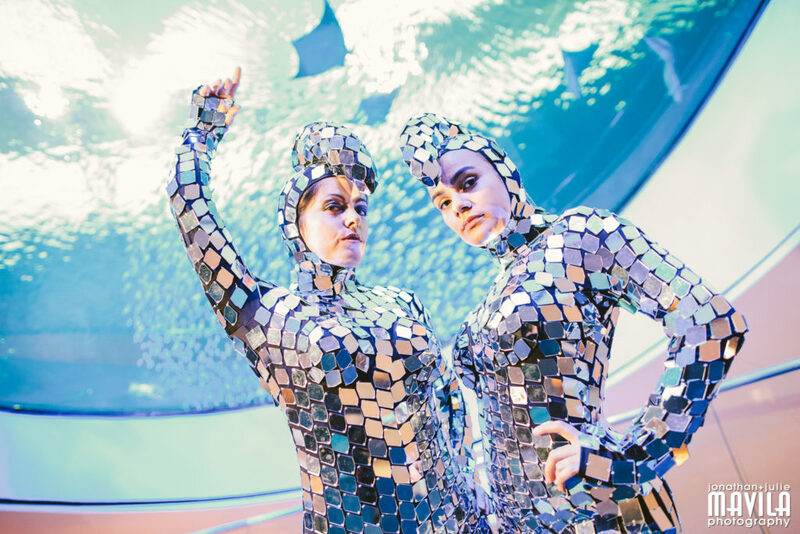 We went straight to Galaxy Productions with these HOT ideas and got the ball rolling. 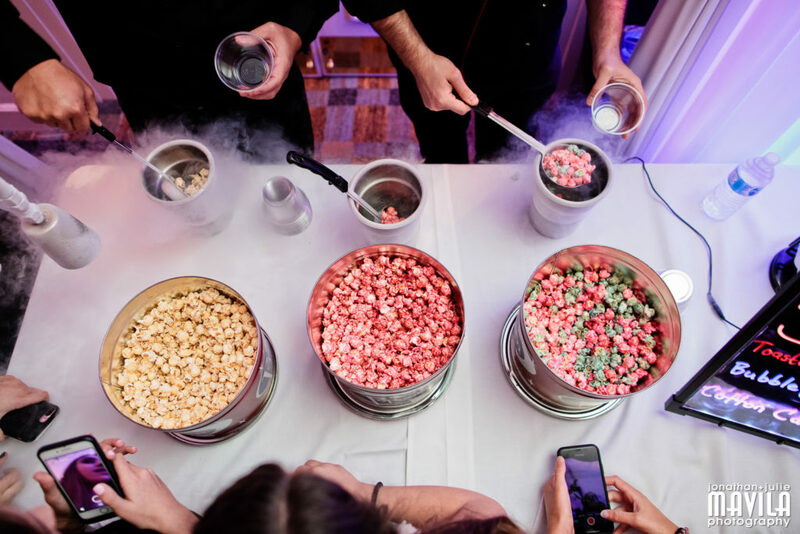 Just like lyrics from a popular song, “We were hot then cold and then yes and then no” until we figured out every detail. 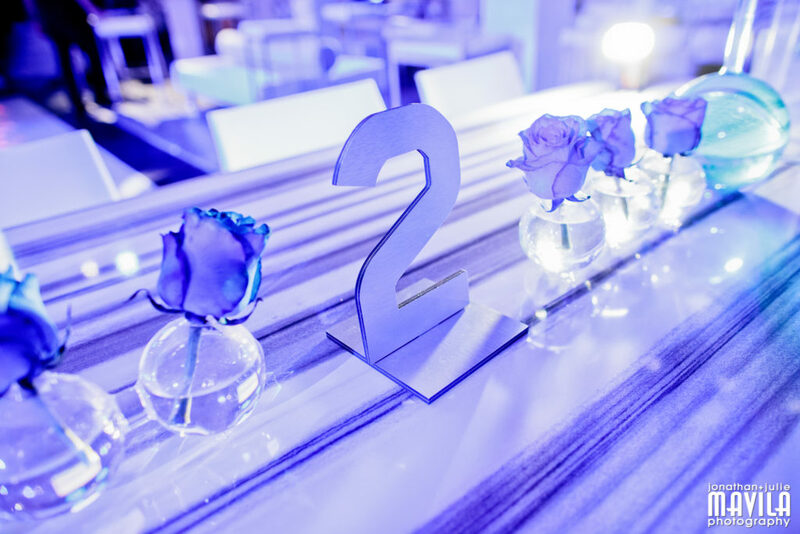 Décor had to incorporate both components from beginning to end. 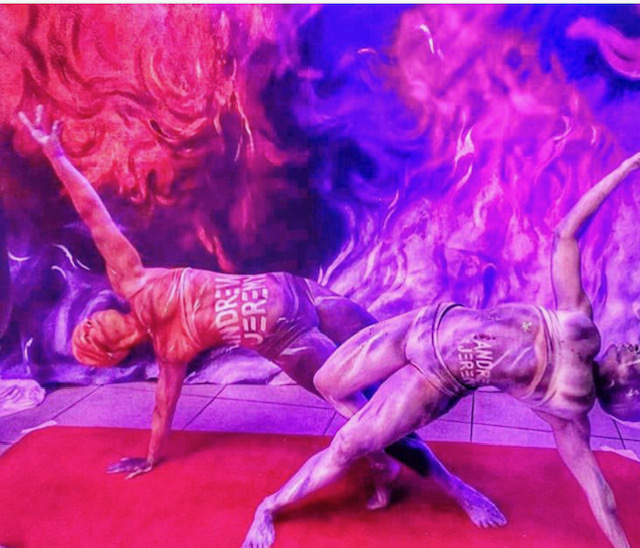 Upon entrance, guests were greeted by a live wall with fiery painted artists before indulging in VIP Catering’s HOT and COLD cocktail hour cuisine. 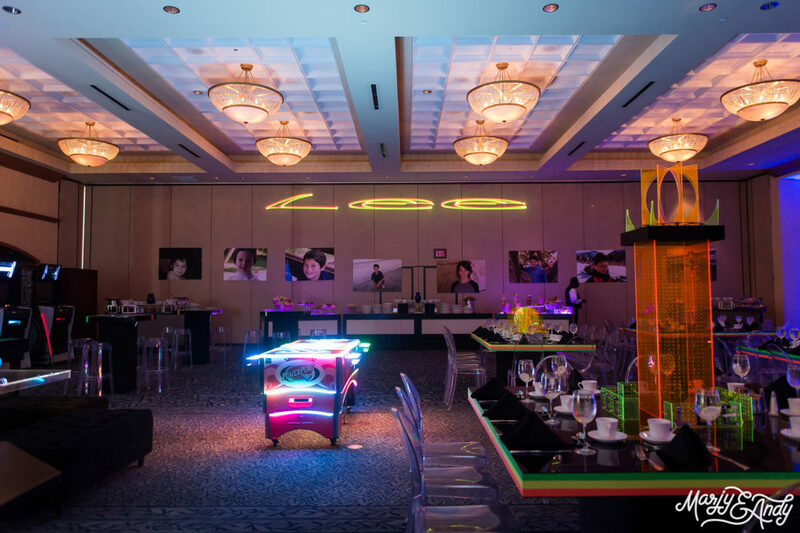 The young ones enjoyed plenty of activities from Cocktail Hour Entertainment and 84 West Events. 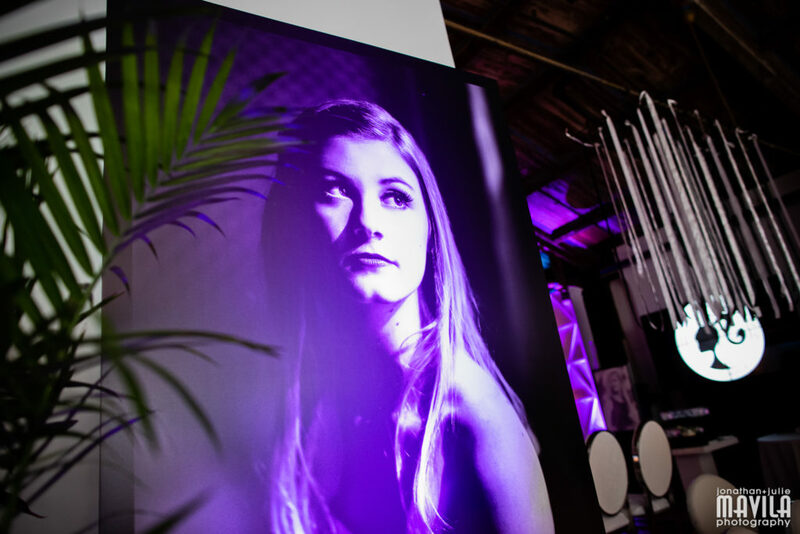 The 360-degree photobooths from Motivat8 were so cool, they were HOT! 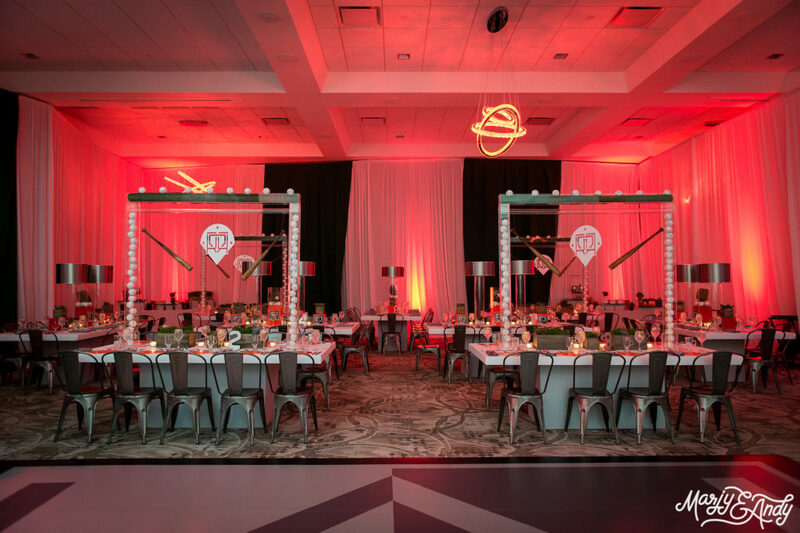 The Kol Tikvah ballroom was transformed by repositioning the stage and using white as the main color palette with pops of red. 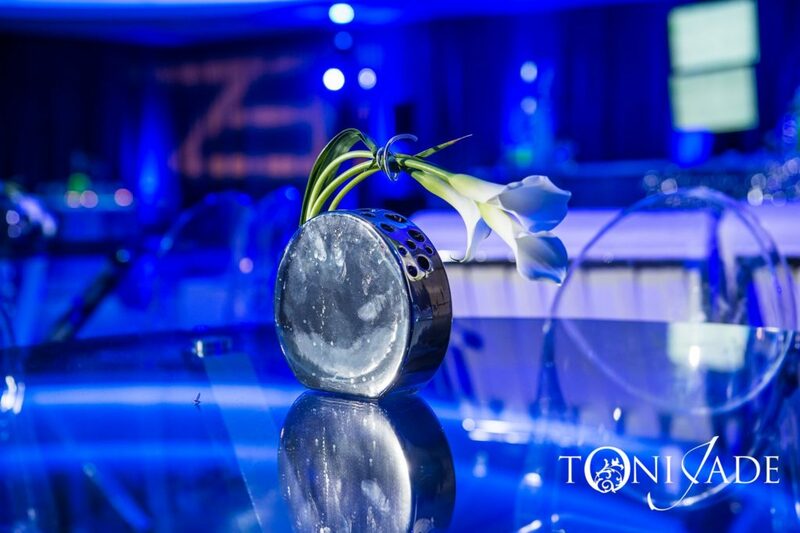 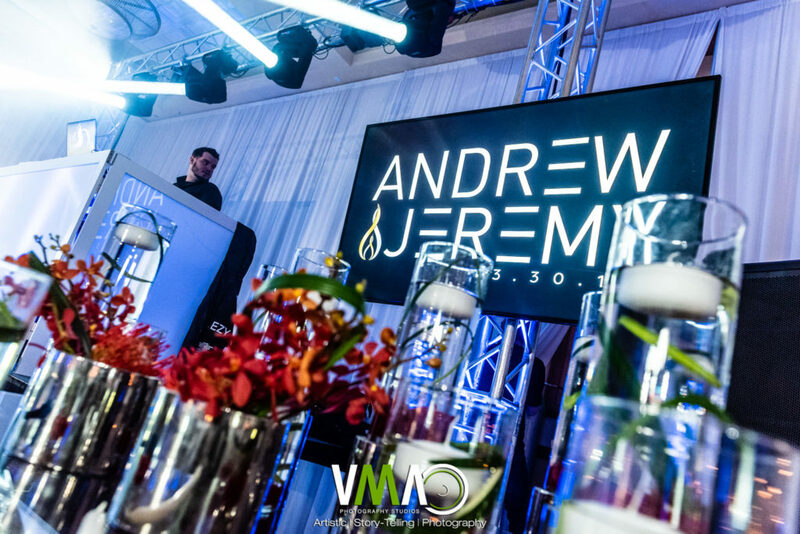 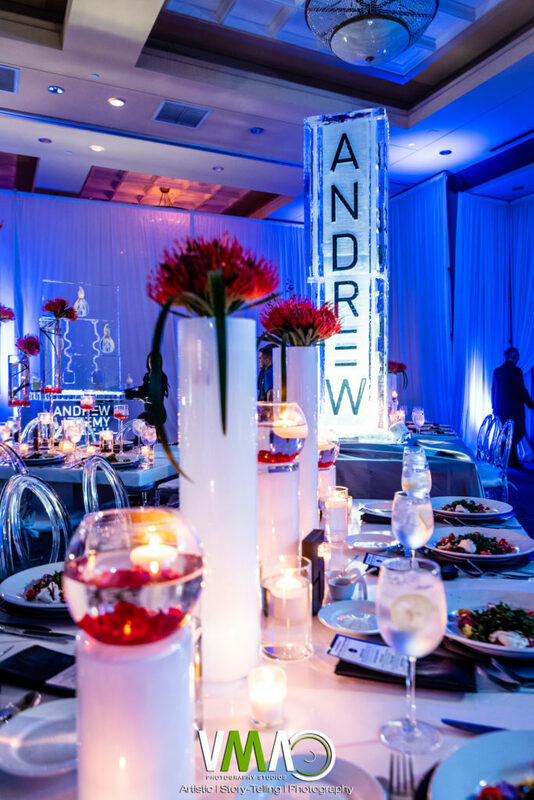 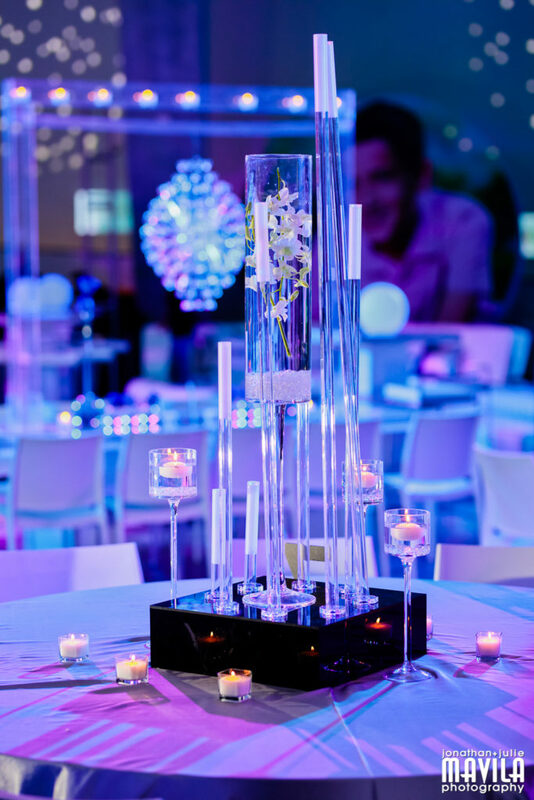 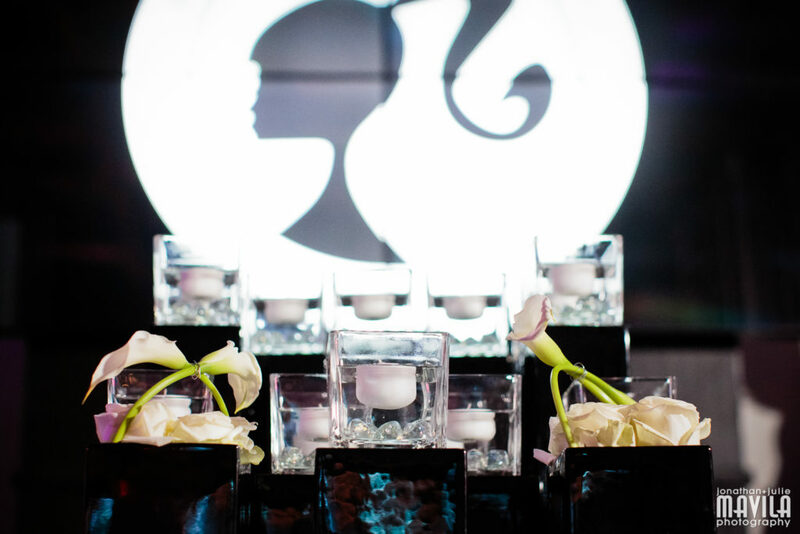 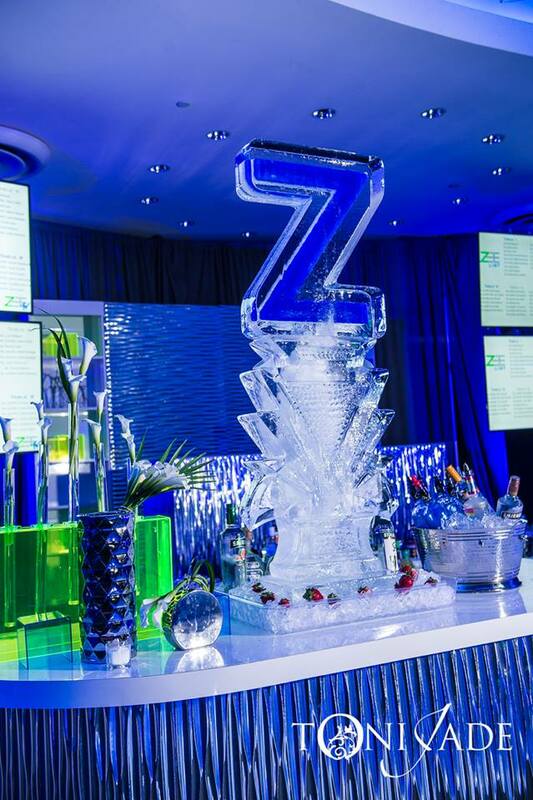 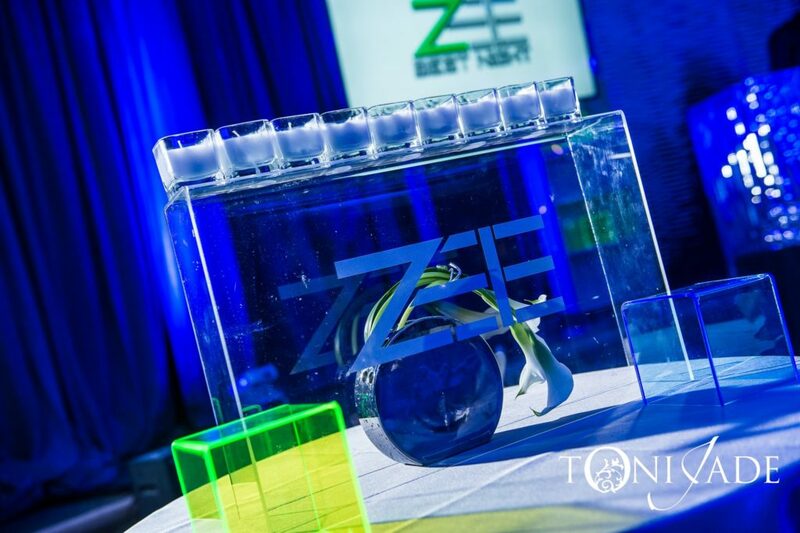 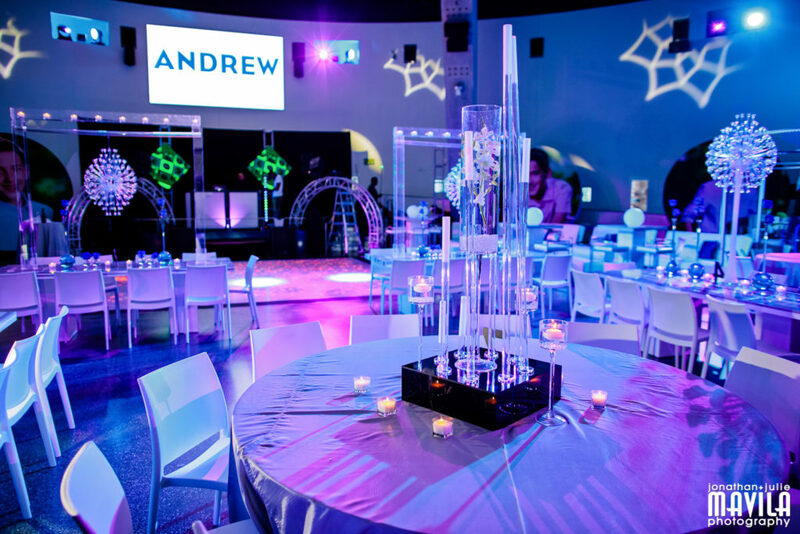 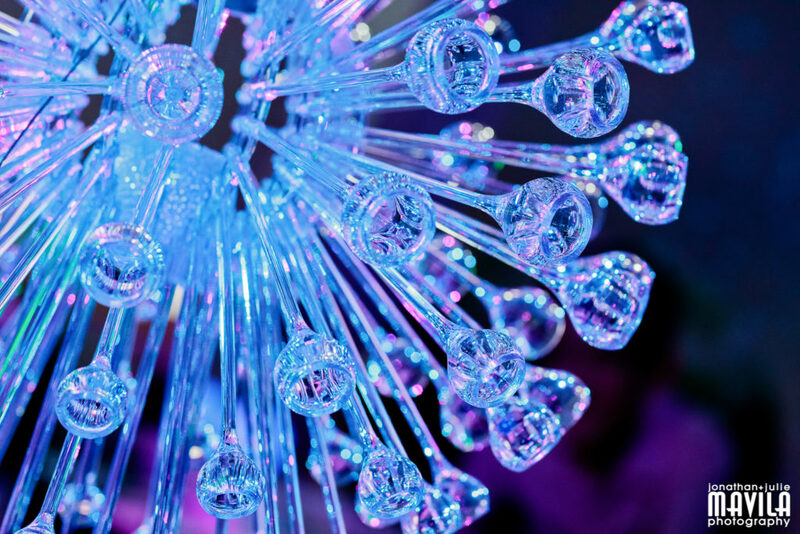 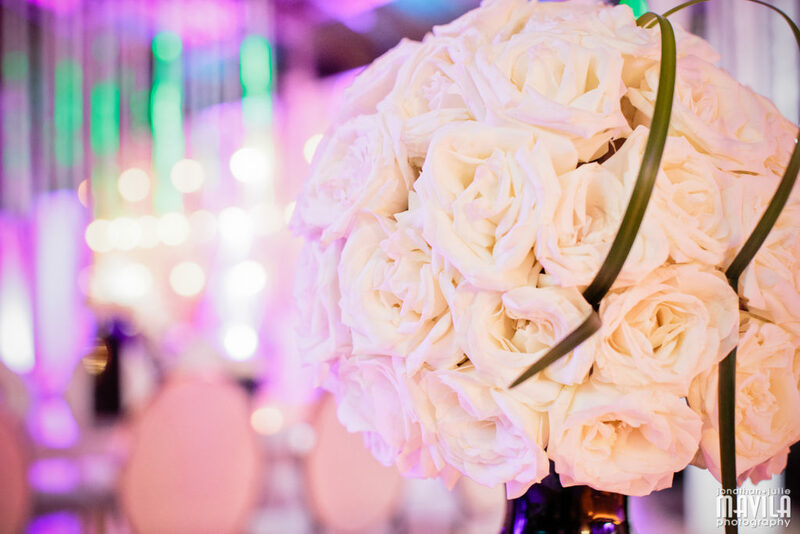 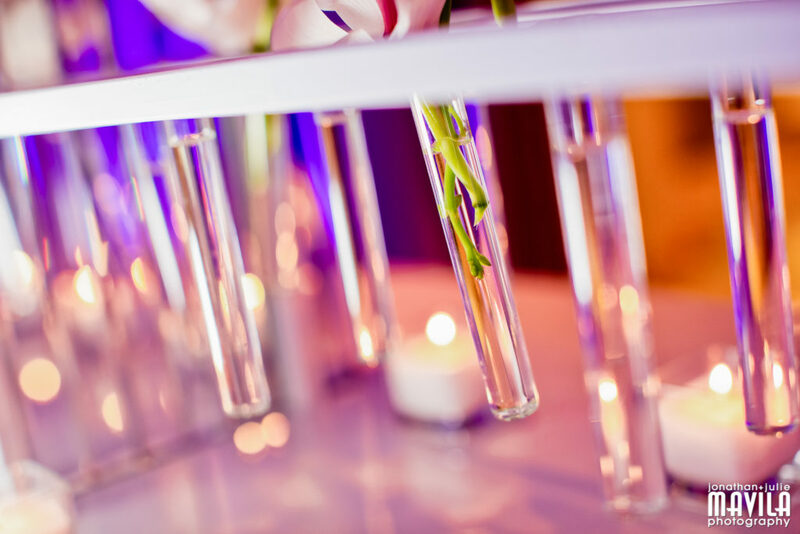 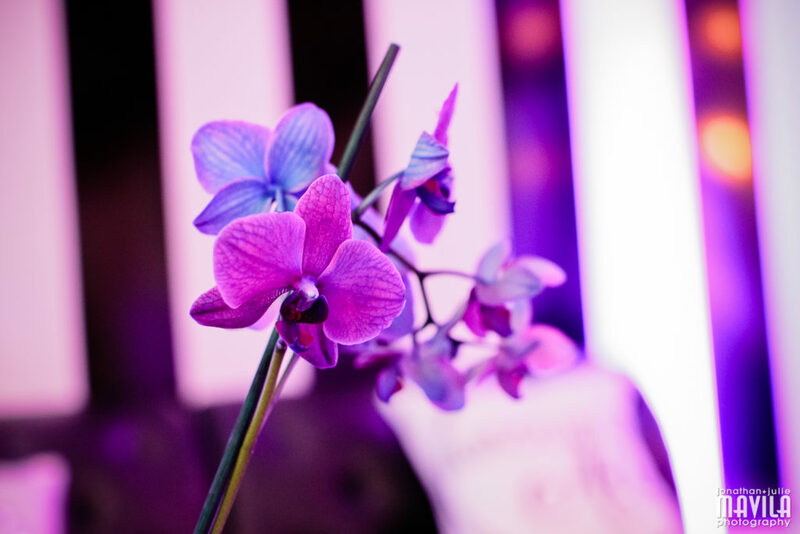 Mokara Orchids and Pin Cushions accented the white opaque and clear glass vases while custom logo ice sculptures made grand visuals on opposite tables. 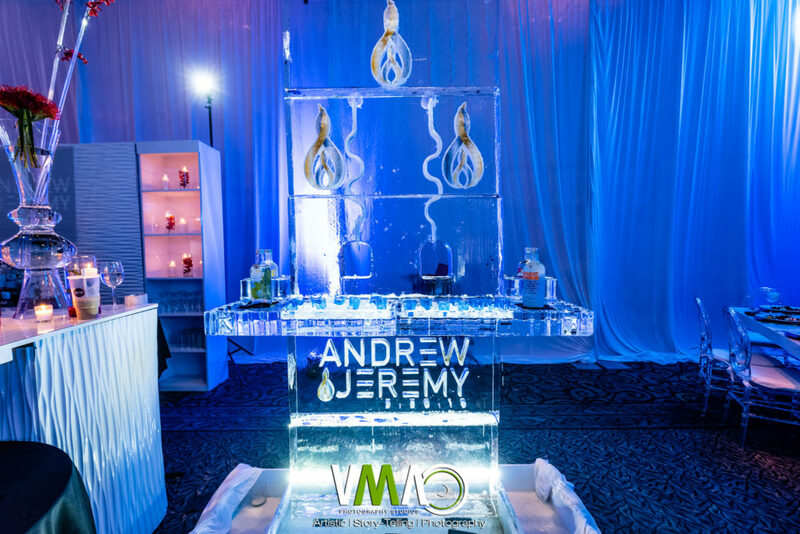 Although the enormous ice luge kept adult guests entertained, the fire breathing bartenders amused all big and small. 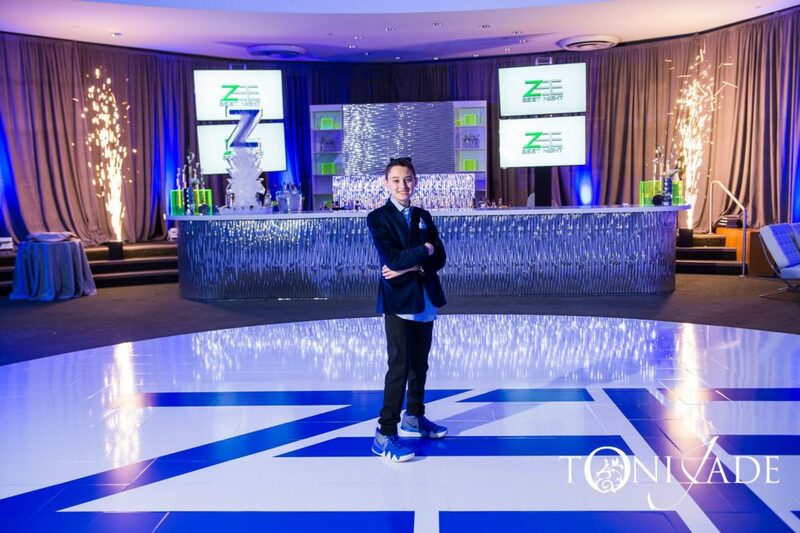 Premier Power Productions kept things HOT on the dance floor with JuICE as the emcee. 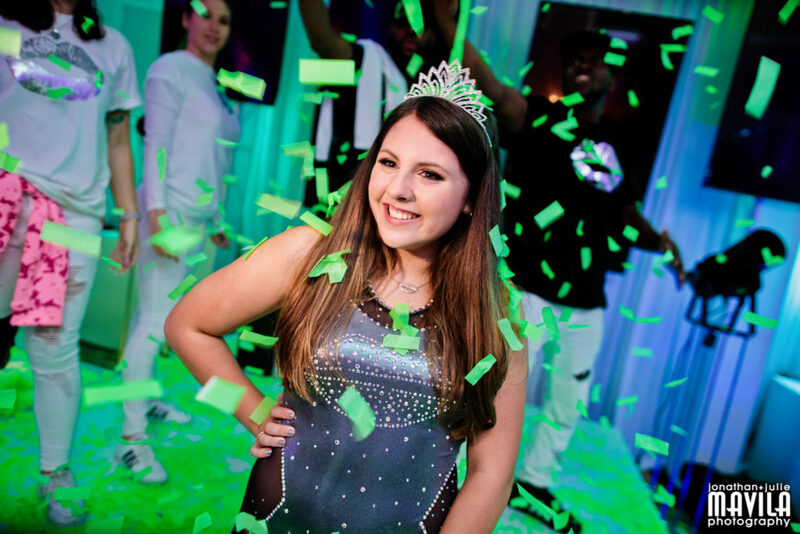 It was a non-stop dance party and continued with DJ Zog to finish the night which included an insane confetti explosion. 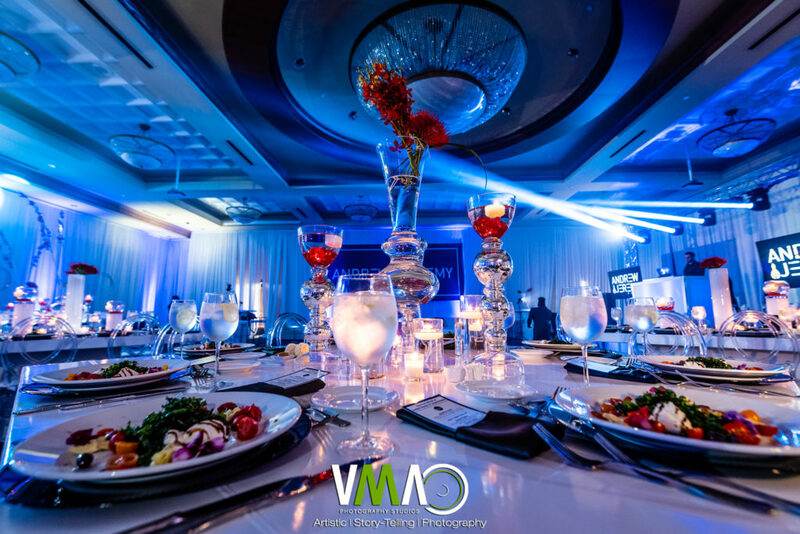 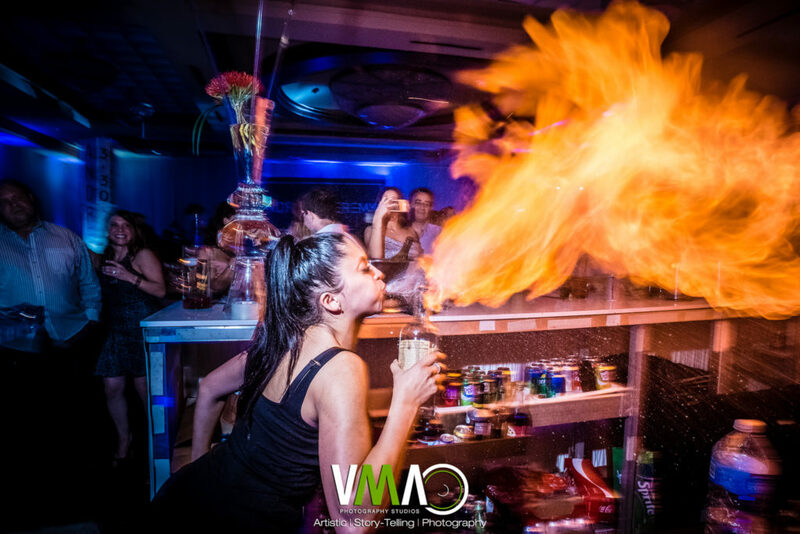 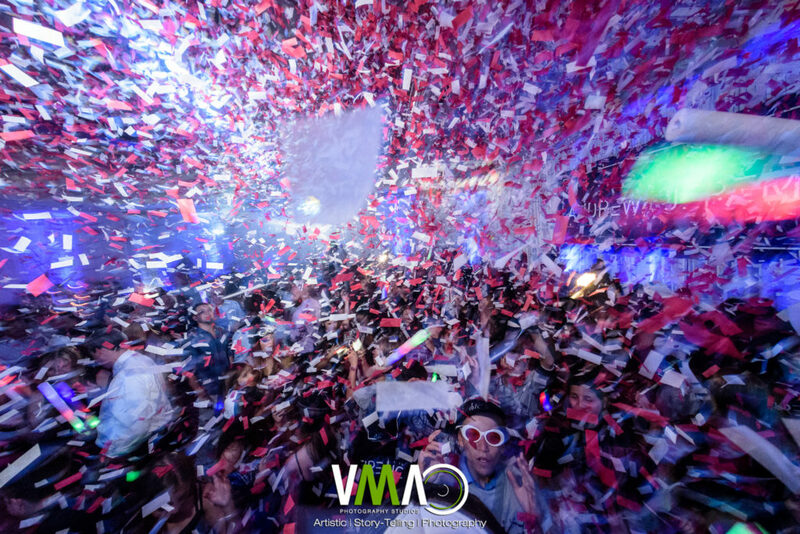 Fortunately, Aaron Lurie from VMA Photography Studios was a ball of fire as he captured every moment. 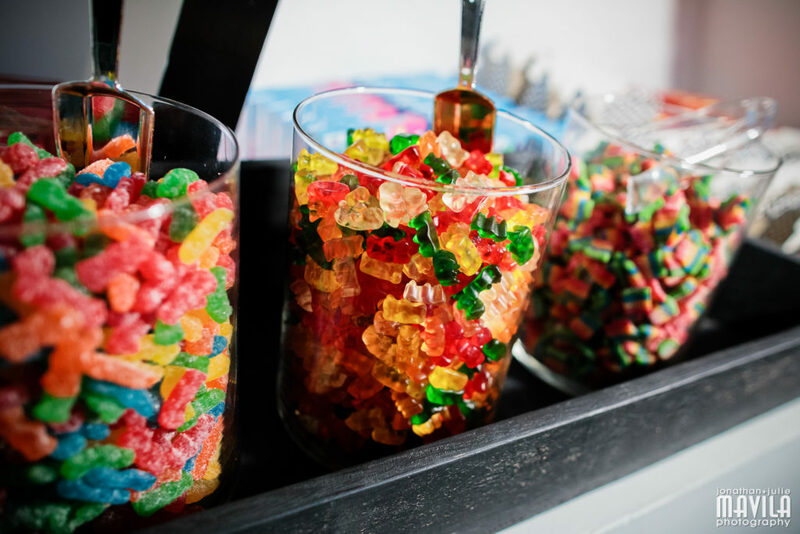 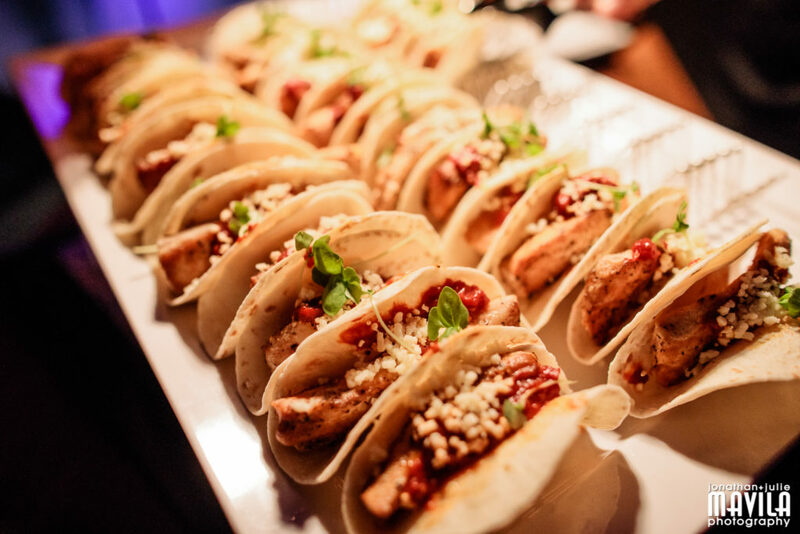 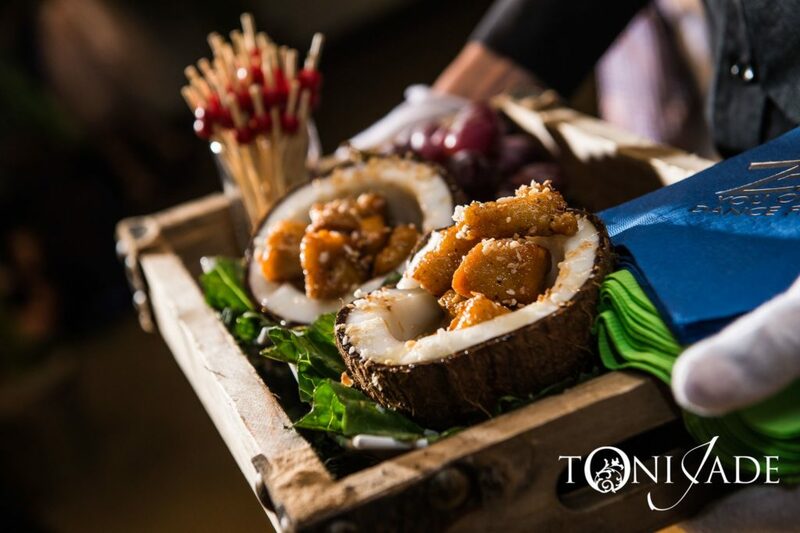 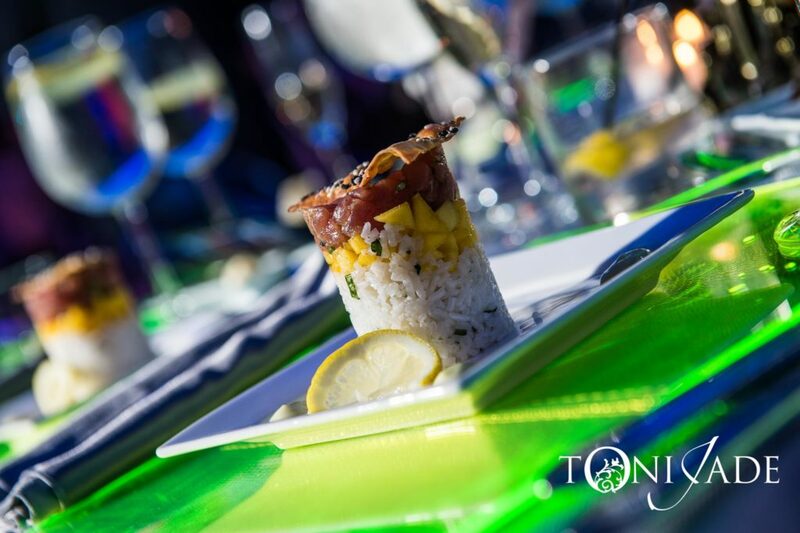 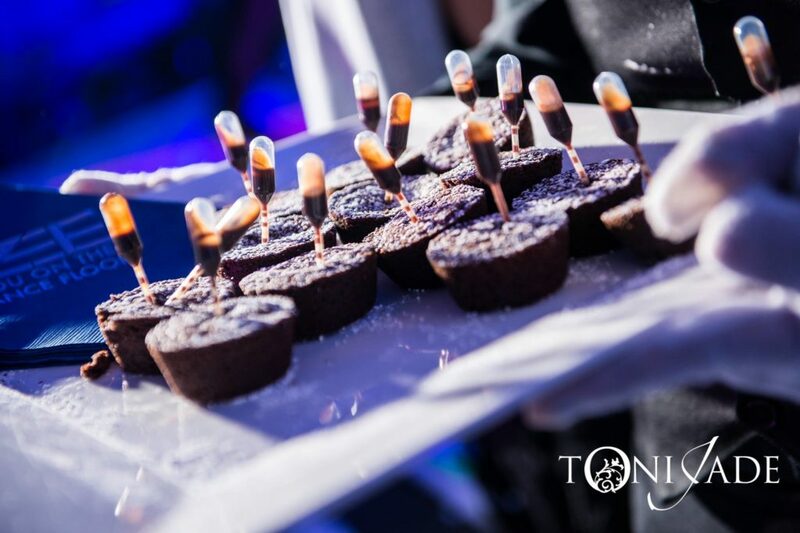 VIP Catering provided four delectable entrée choices and of course their signature dessert parade. 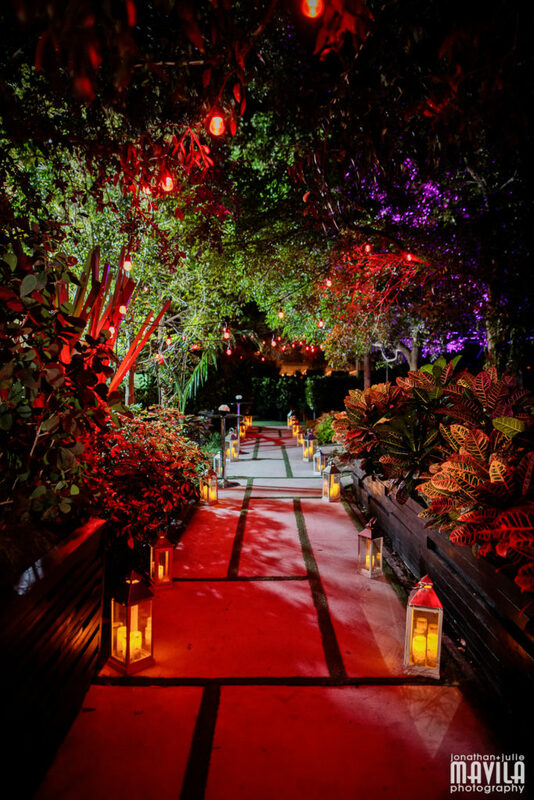 And if that wasn’t enough, Chik-fil-A was served as guests departed giving them the infamous sandwich on an early Sunday morning. 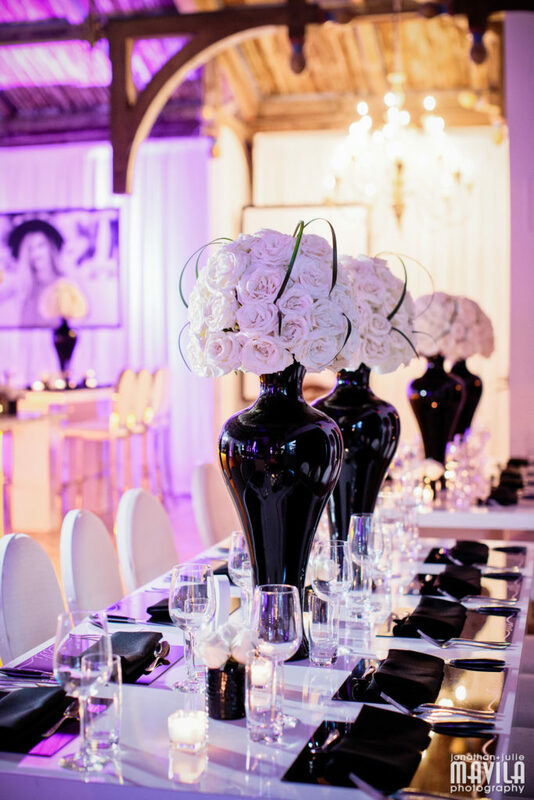 Blending magnifICEnt opposites always make a STYLED event! 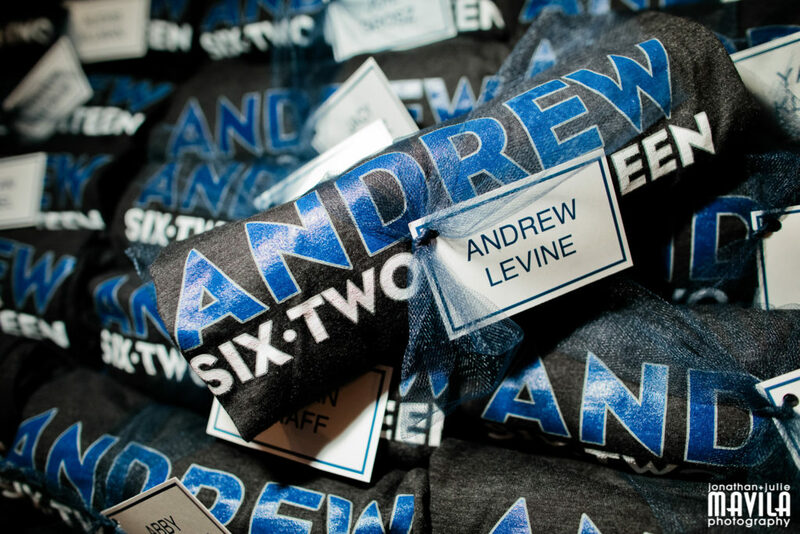 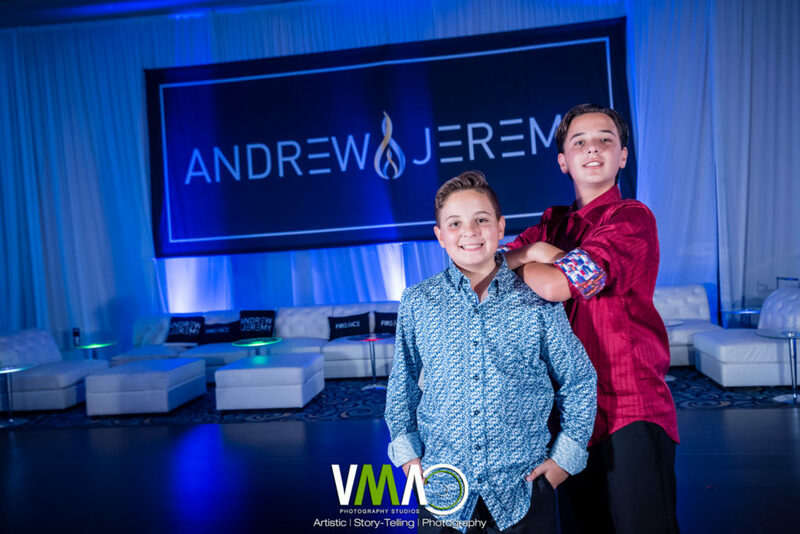 Mazel Tov again to Andrew, Jeremy, and their family! 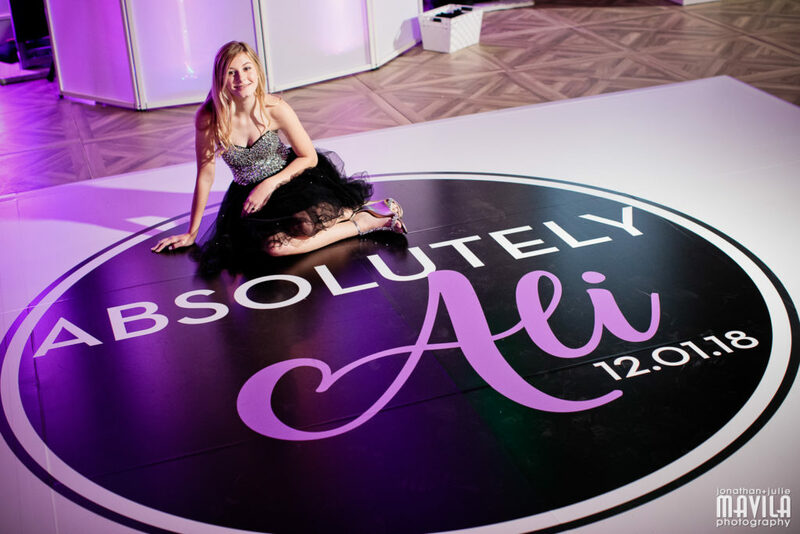 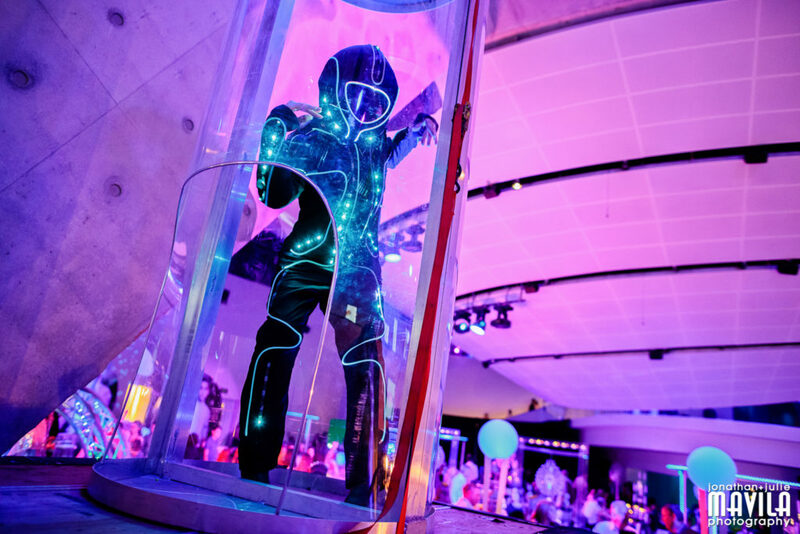 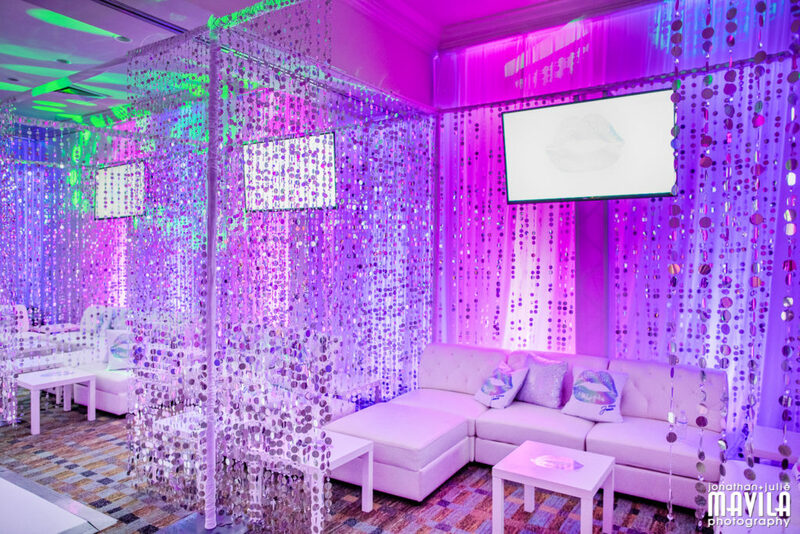 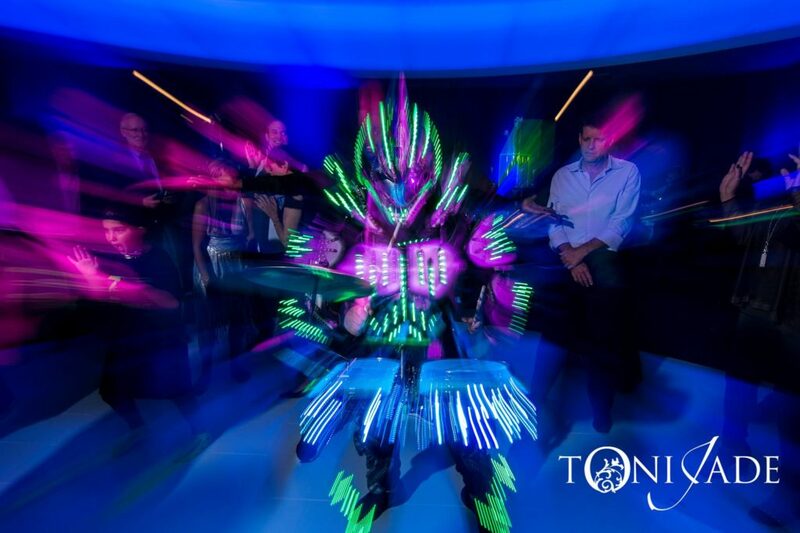 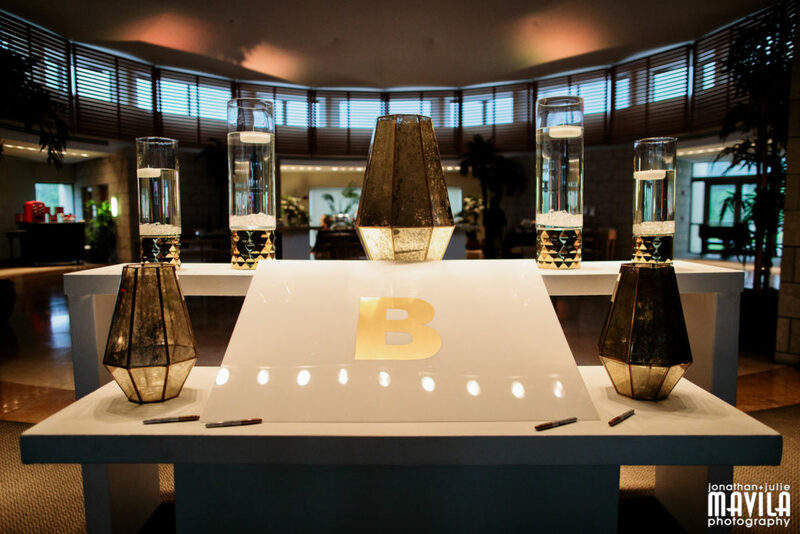 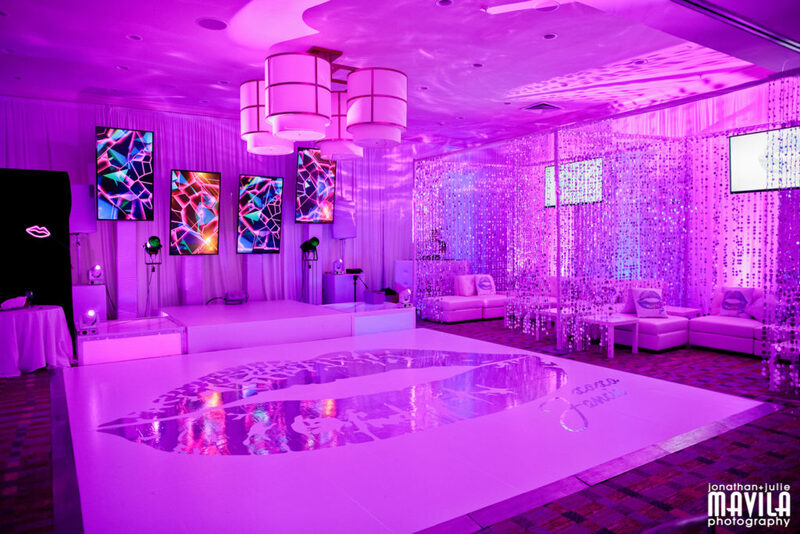 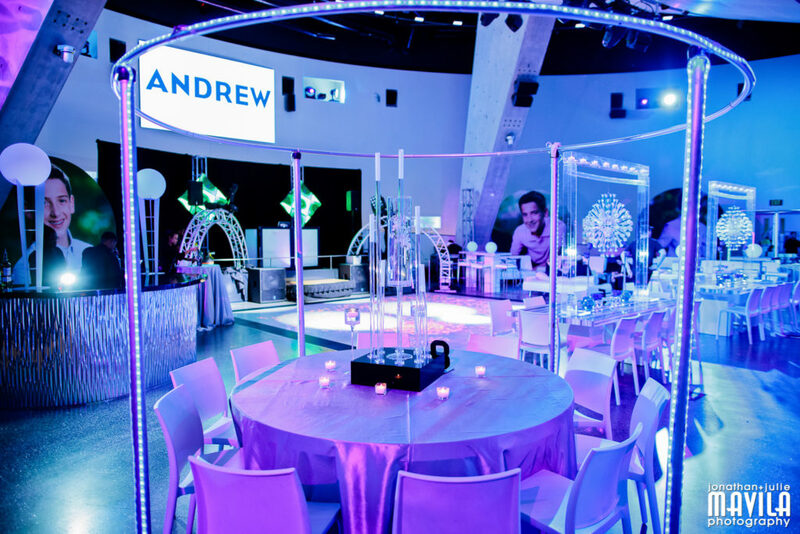 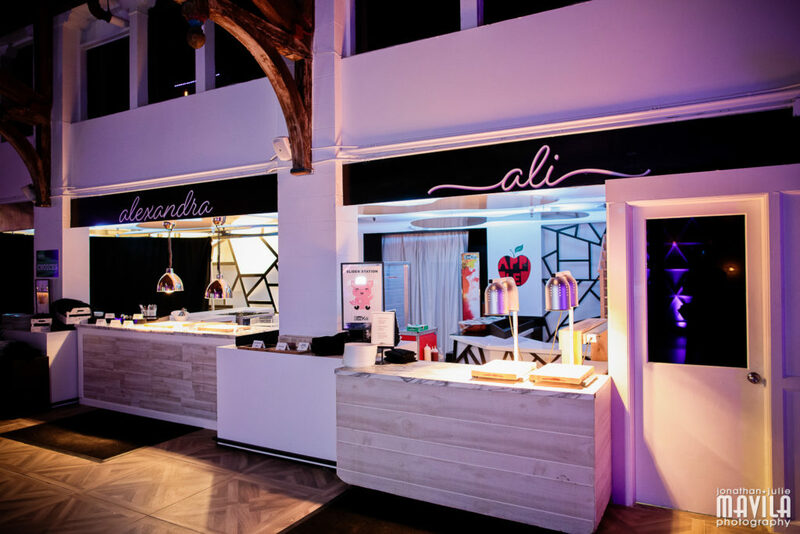 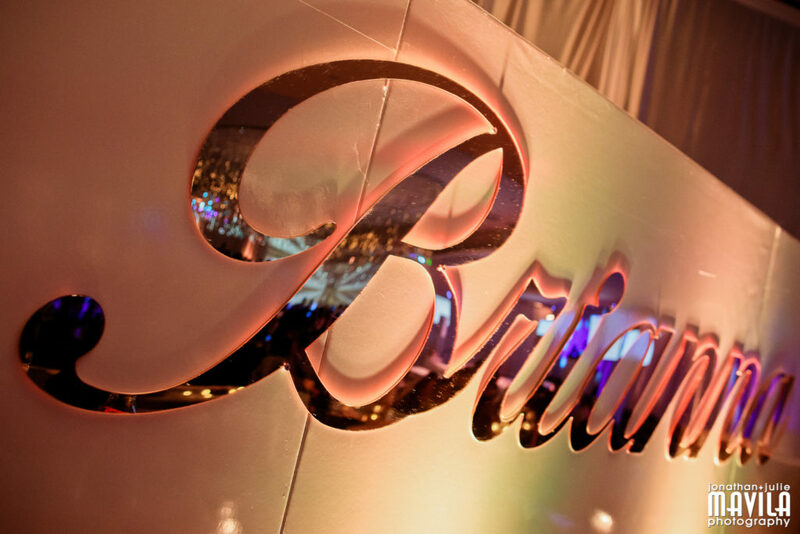 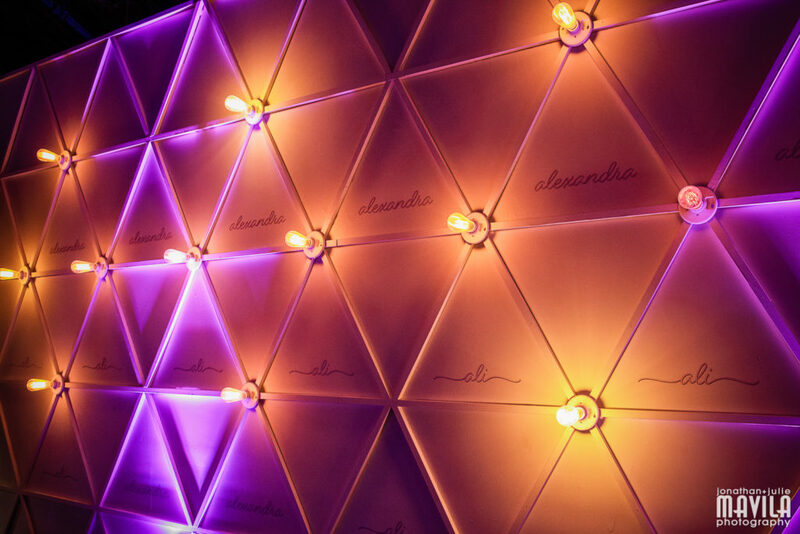 We were fortunate to have the opportunity to create a Bat Mitzvah in a most unique venue. 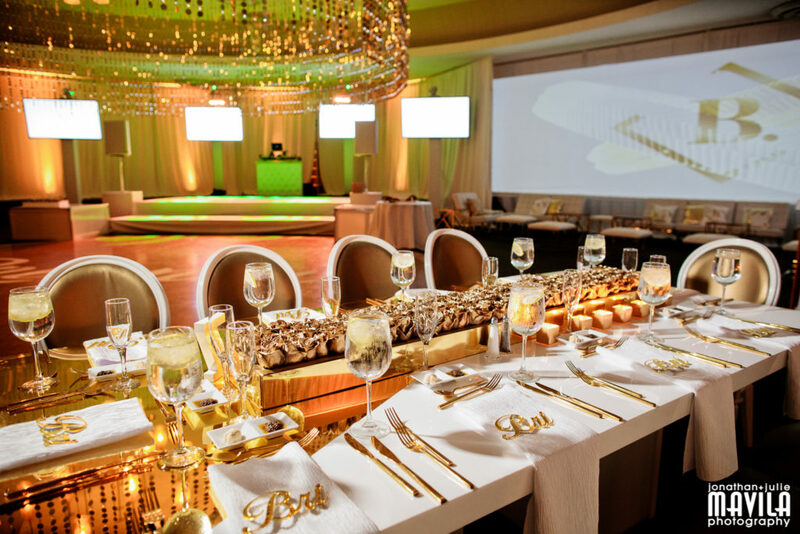 Our Guest of Honor (GOH) didn’t want the typical party in a typical venue, so we ventured over to The Village at Gulfstream Park in Hallandale Beach. 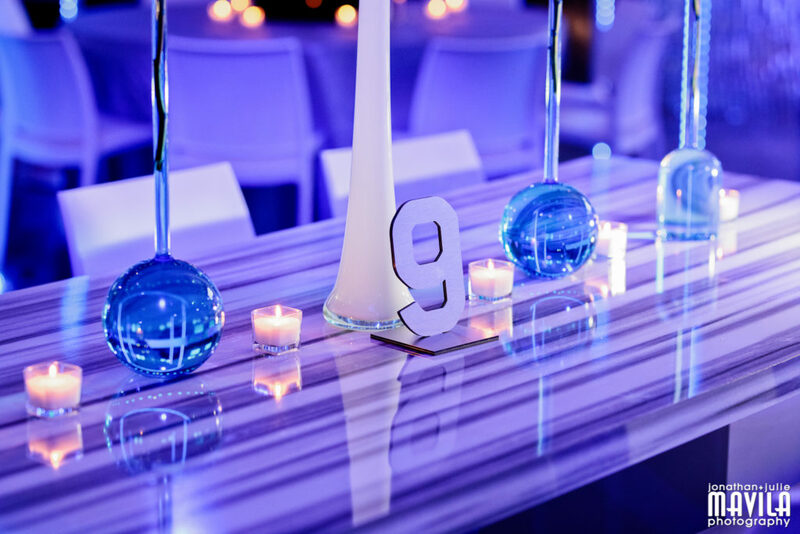 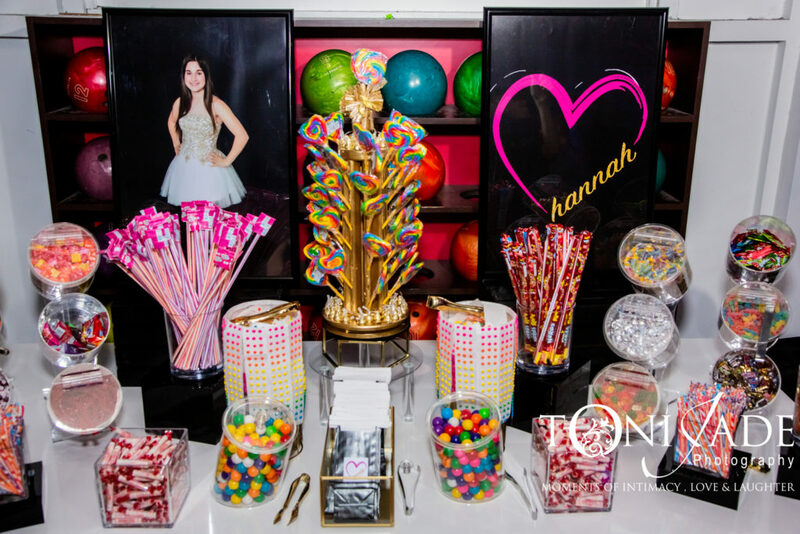 Strike 10 Bowling & Sports Lounge was a perfect space to plan a memorable night for our Mitzvah family and their guests. 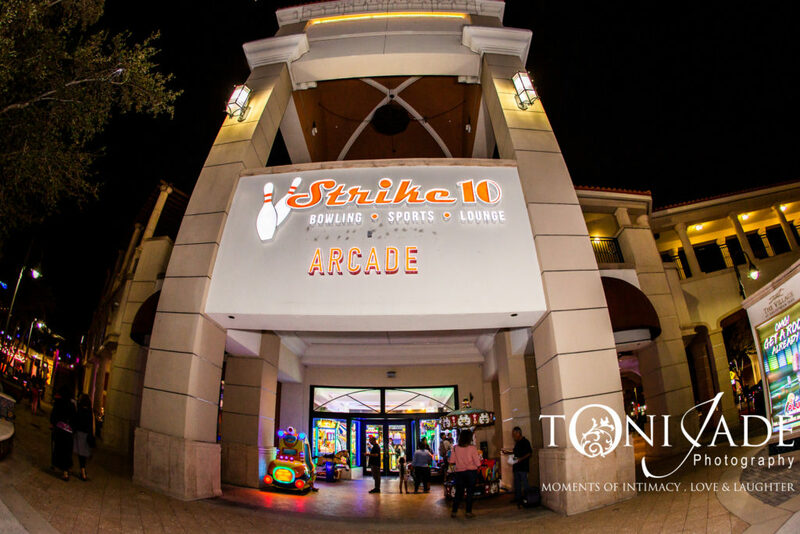 Upon entry, the young guests entered the arcade area where they had plenty of tokens to play the abundance of games. 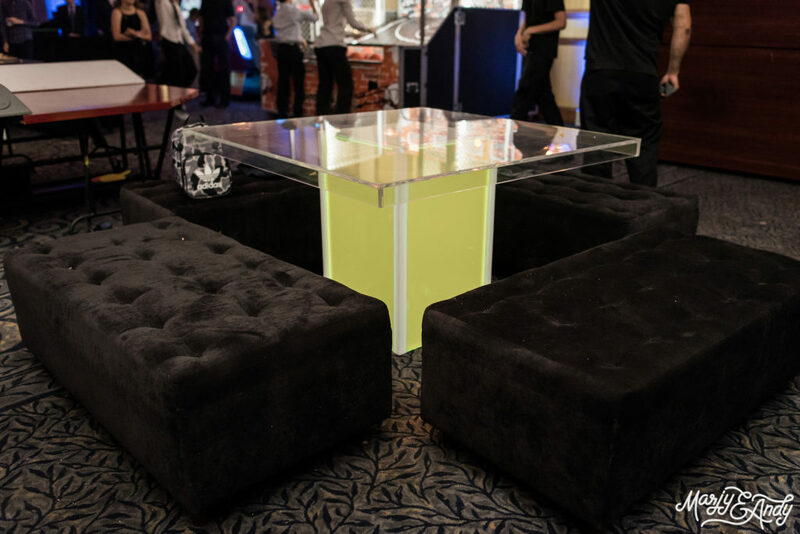 While the cocktail hour offered plenty of food and drinks for everyone, it also offered additional amenities such as billiards and over 30 large HD TVs for the adults to enjoy in a plush lounge area. 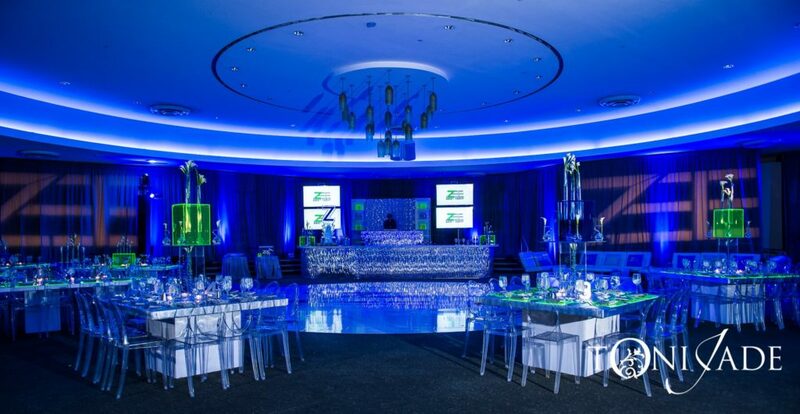 Once cocktail hour was over, Dale the Host opened the dance floor. 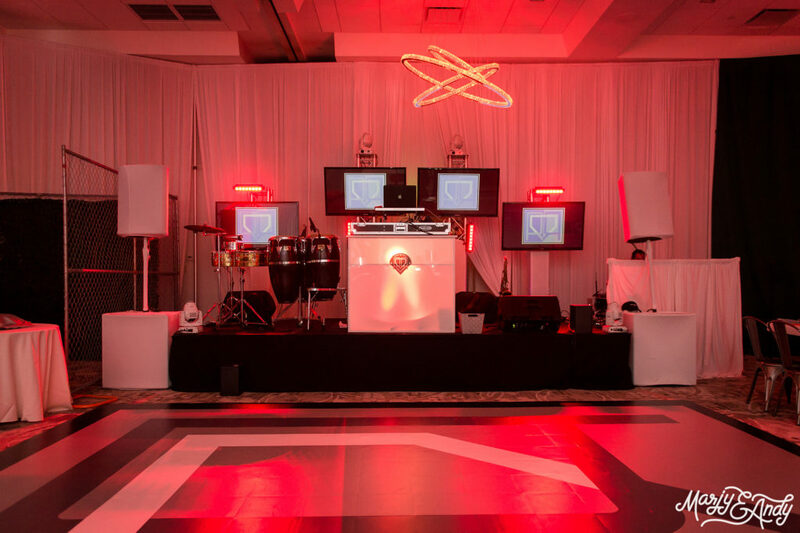 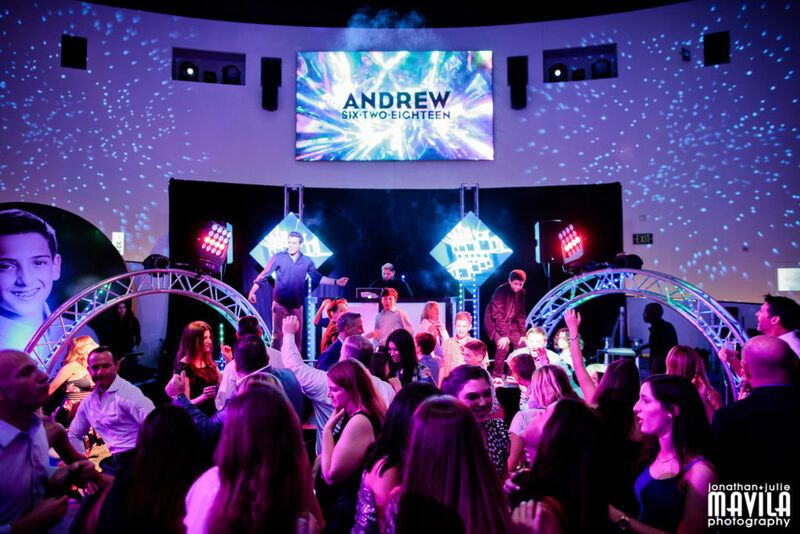 The facility’s state-of-the-art sound system and lighting complemented our “MC Kingpin” who had everyone on their feet. 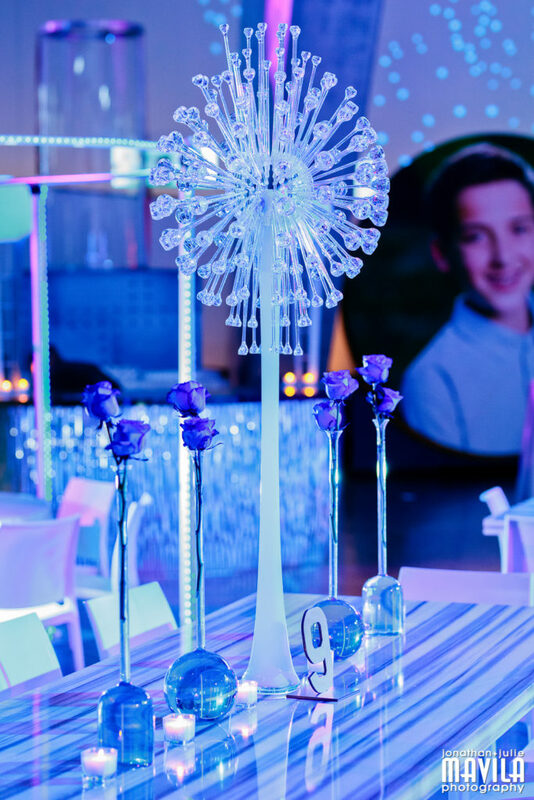 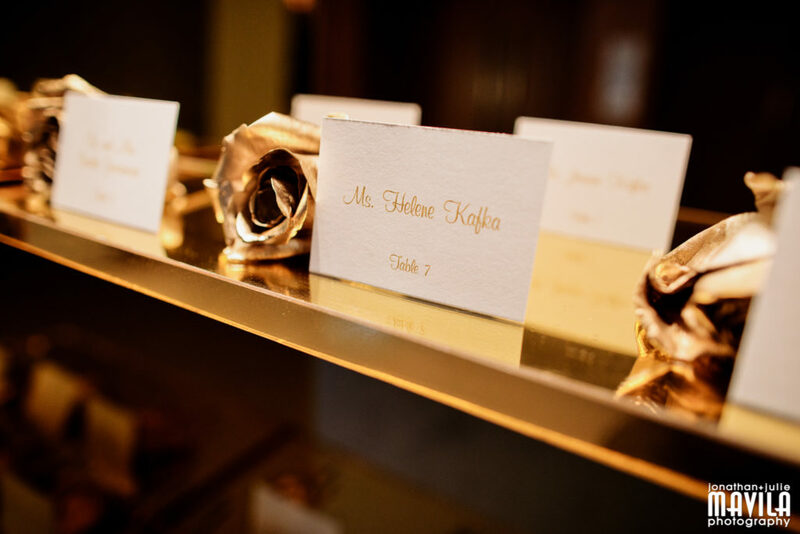 From the grand entrance to the hora, no ordinary formalities were missed during this not so ordinary mitzvah. 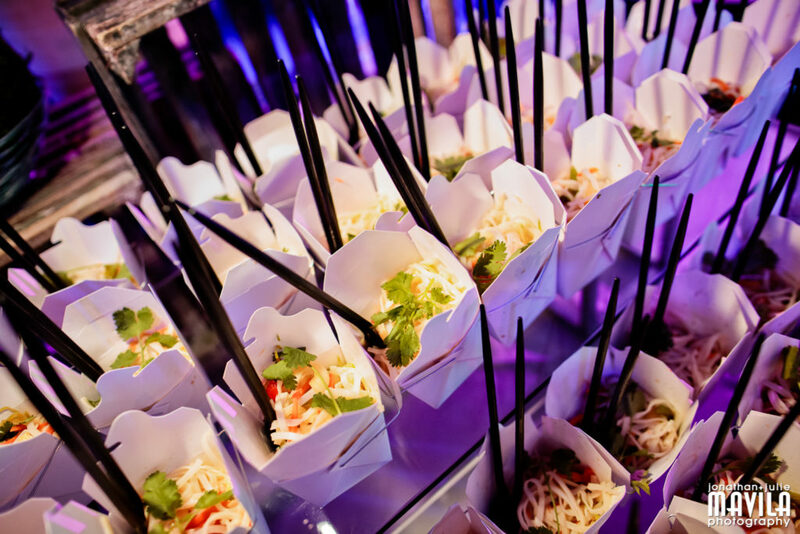 Everyone loves traditional bowling alley treats, but Strike 10 really knew how to put a spin on the classic cuisine. 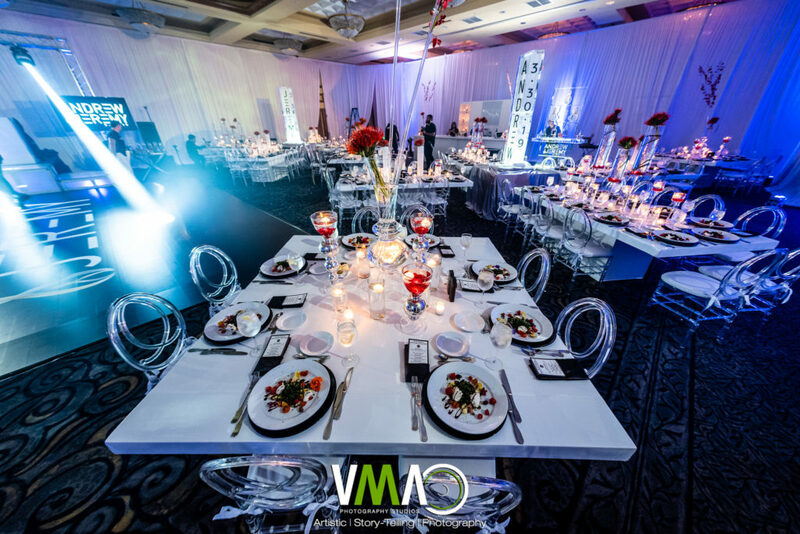 They certainly upped their game with signature staples such as pizza to international buffet stations and more; The only turkeys here were made by the guests! 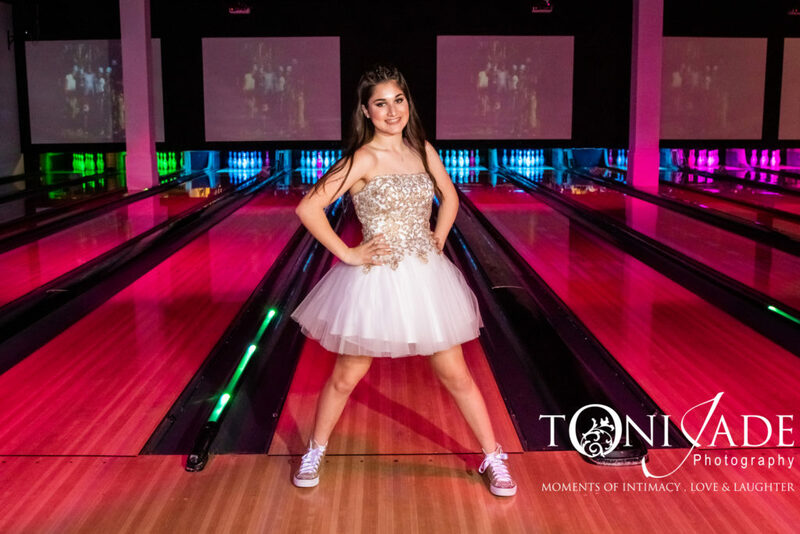 Later in the evening, the ropes were lifted, and the lanes were open and ready for bowling. 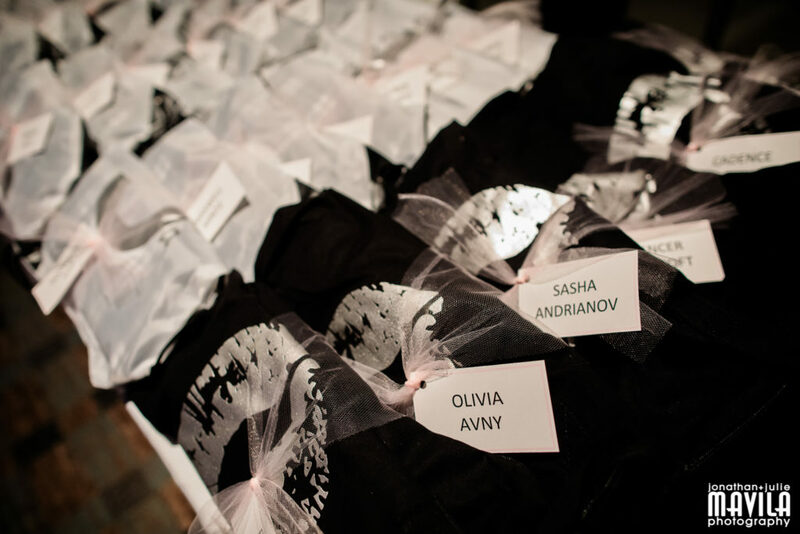 Plenty of SWAG was given out while the teens showed off their fancy skills. 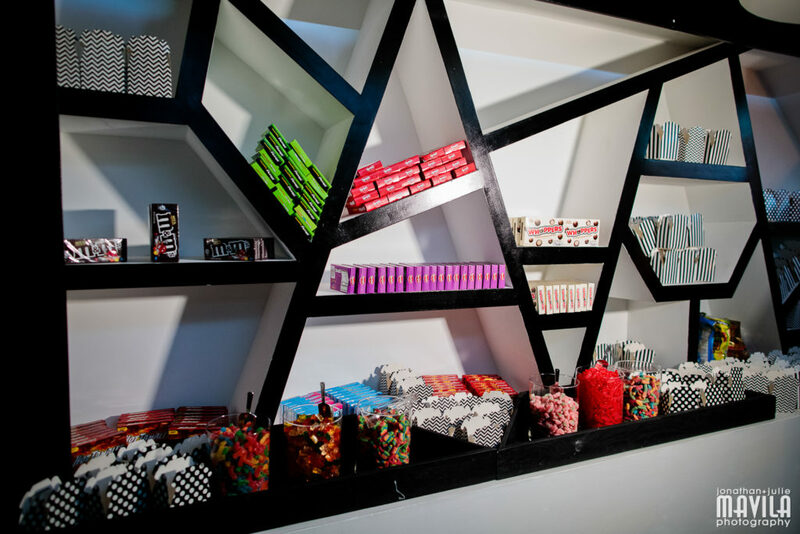 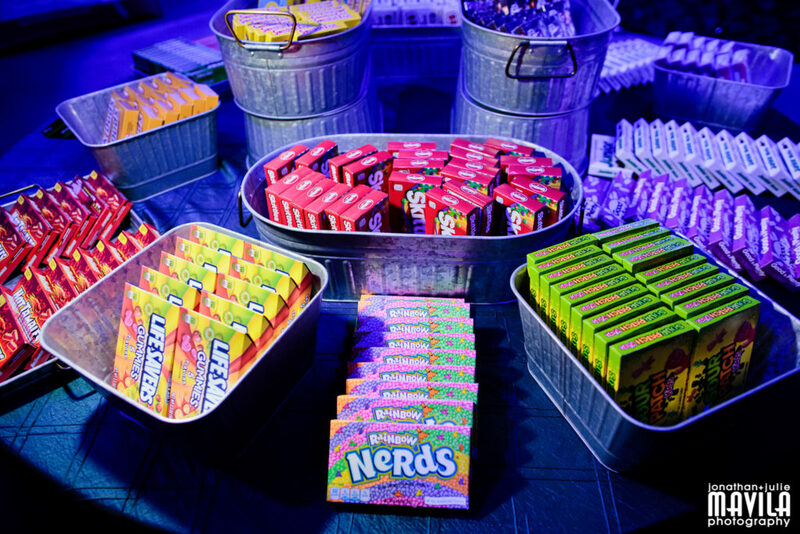 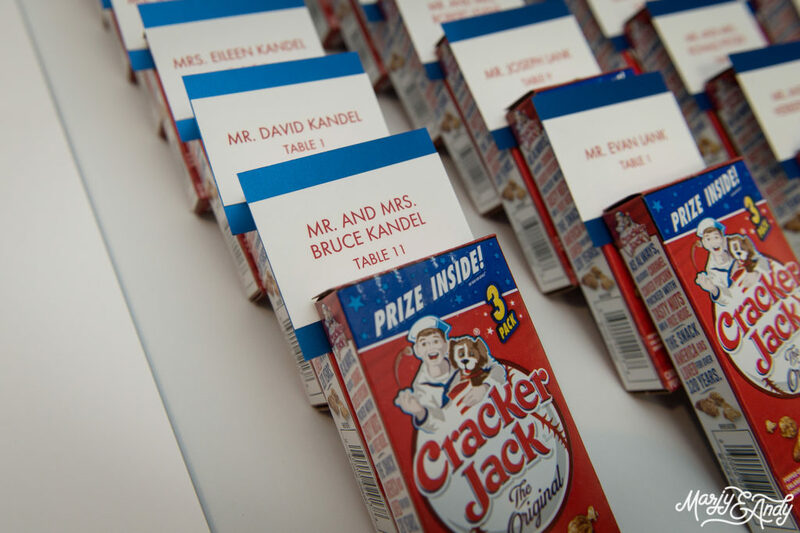 Guests big and small also scored big with a candy bar, s’mores station, and a special cookie display. 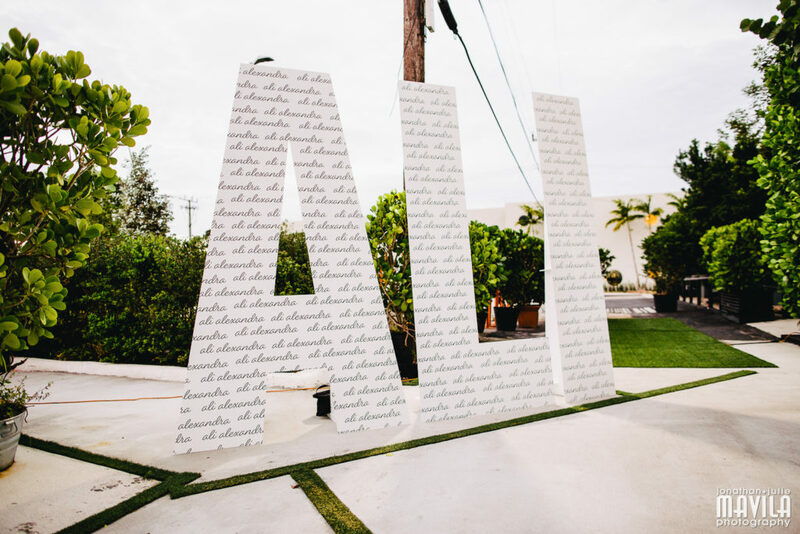 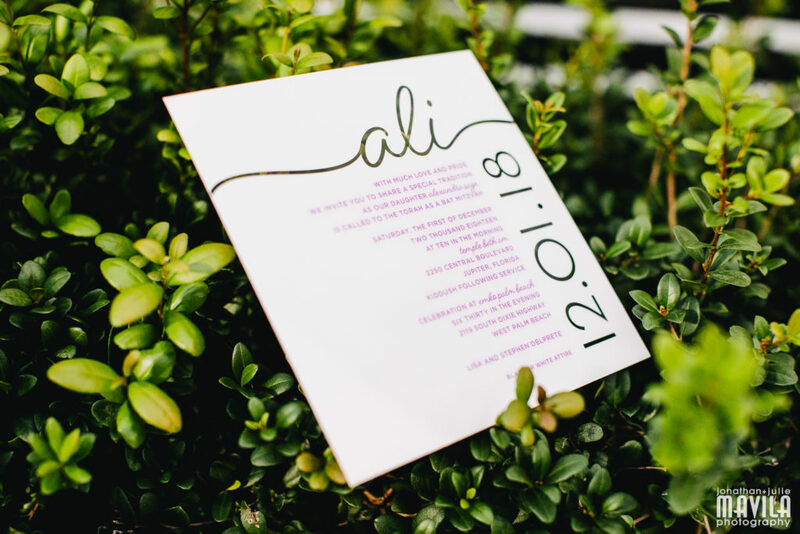 With no time to spare, Toni Jade Photography was on-site to capture every frame. 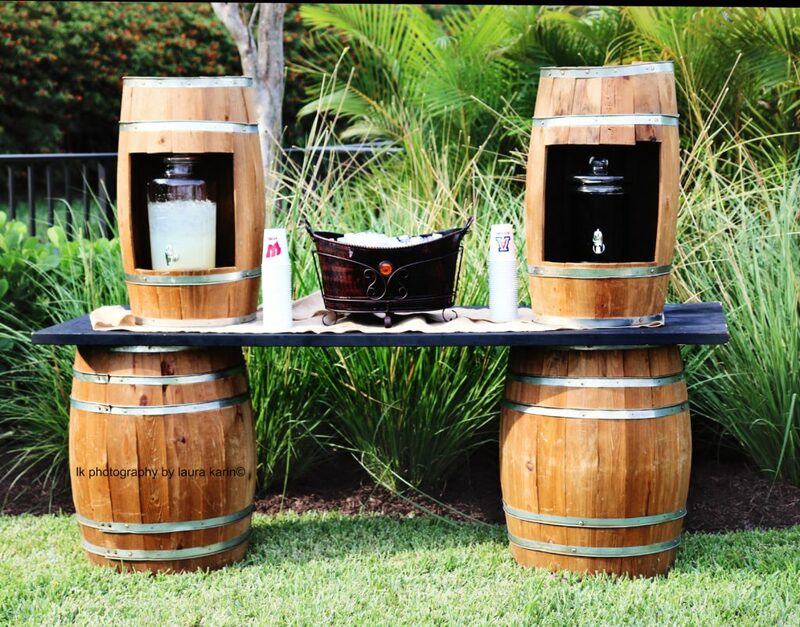 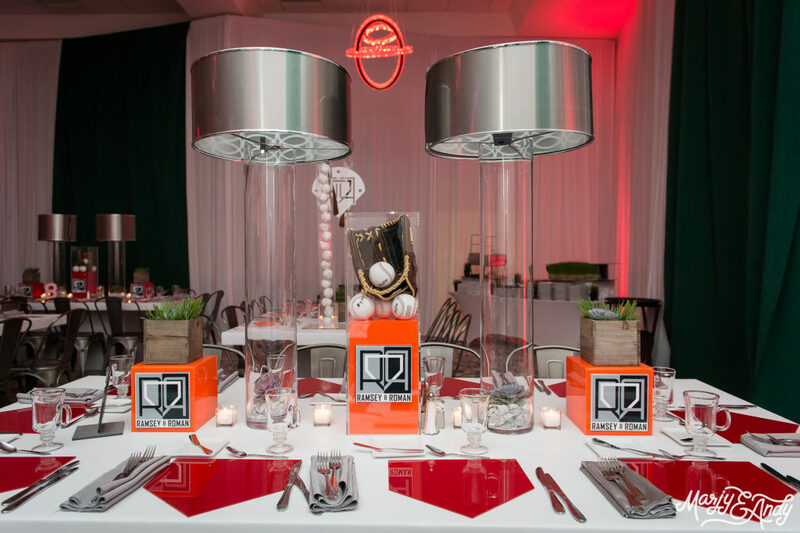 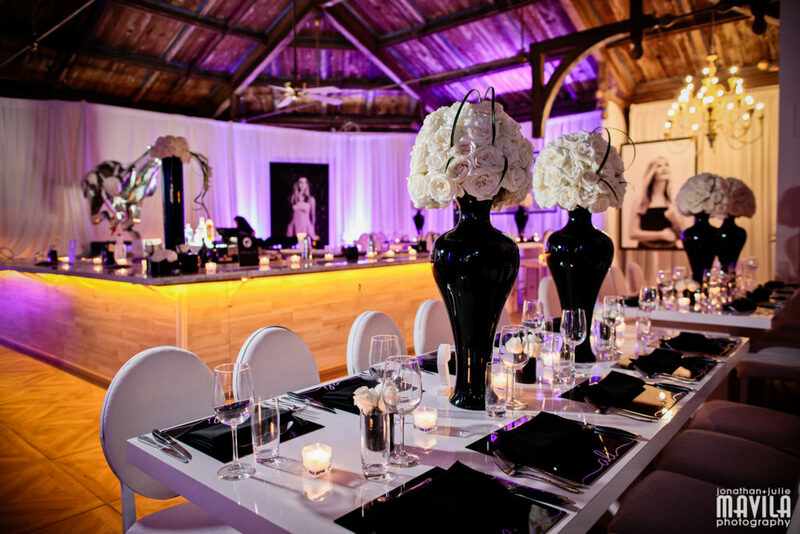 A perfect game always makes a STYLED EVENT. 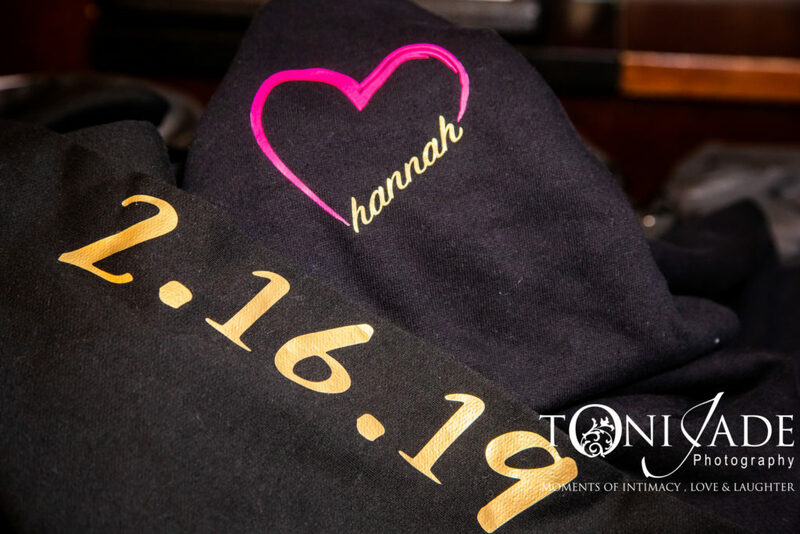 Mazel Tov again to Hannah and her family! 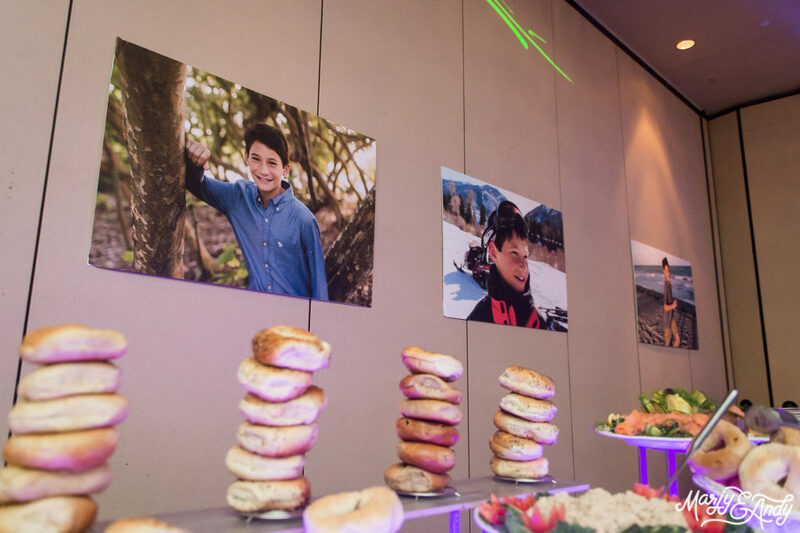 We knew right away that our Guest of Honor (GOH) didn’t want a traditional evening Bar Mitzvah party with lots of dancing, over-the-top décor, performers, etc. 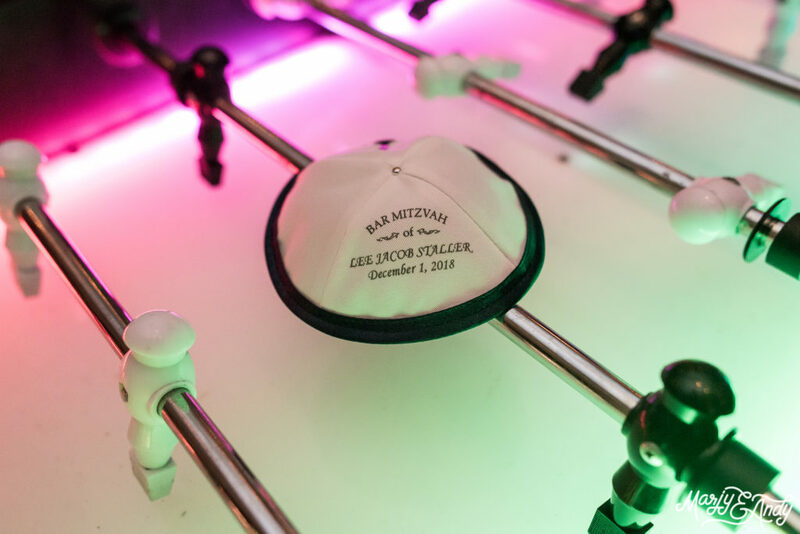 His favorite part of attending mitzvahs is the cocktail hour when a variety of games are usually available. 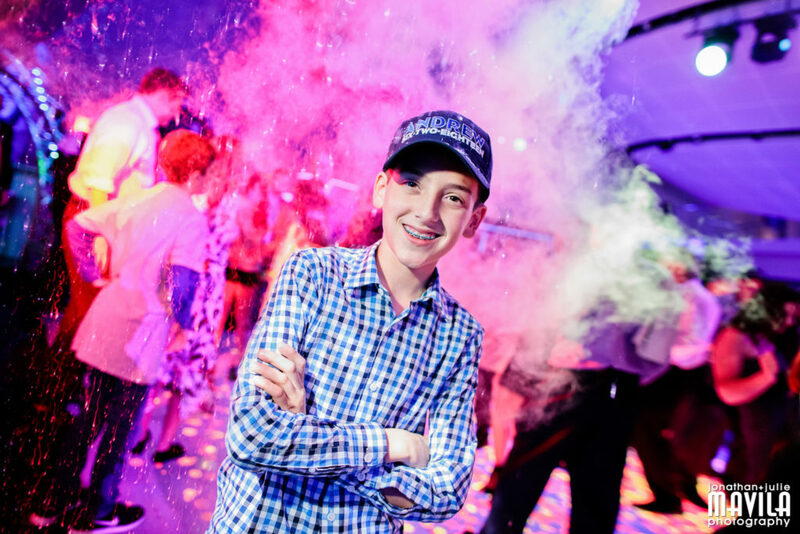 When we told him that we could create his entire party around his love of video games, he no doubt was GAME! 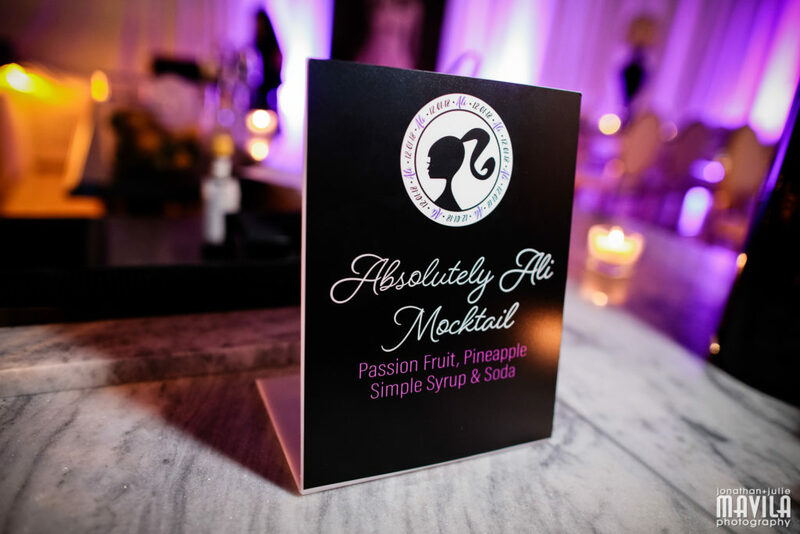 So, it was time to let the games begin… We started with our GOH’s list of must-haves and were sure to reserve all of them way in advance from Cocktail Hour Entertainment before doing anything else. 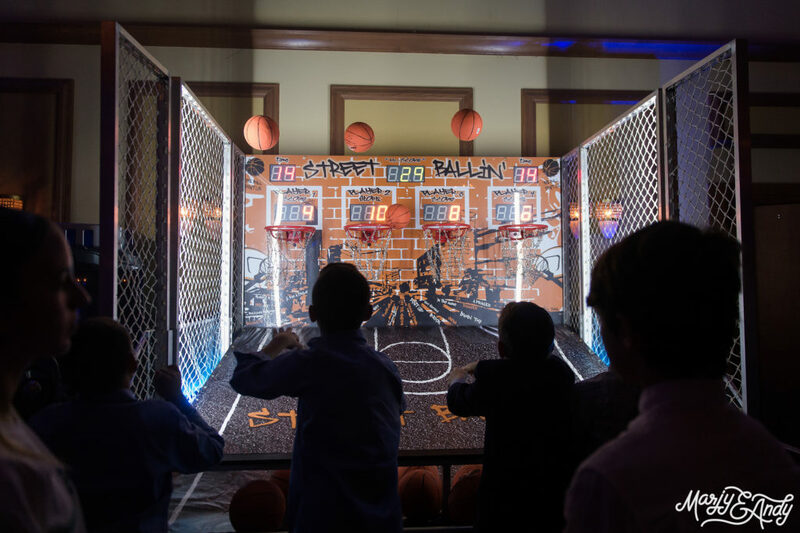 We then made a game plan to design a space that would coordinate nicely with our arcade-filled ballroom at Congregation Kol Tikvah. 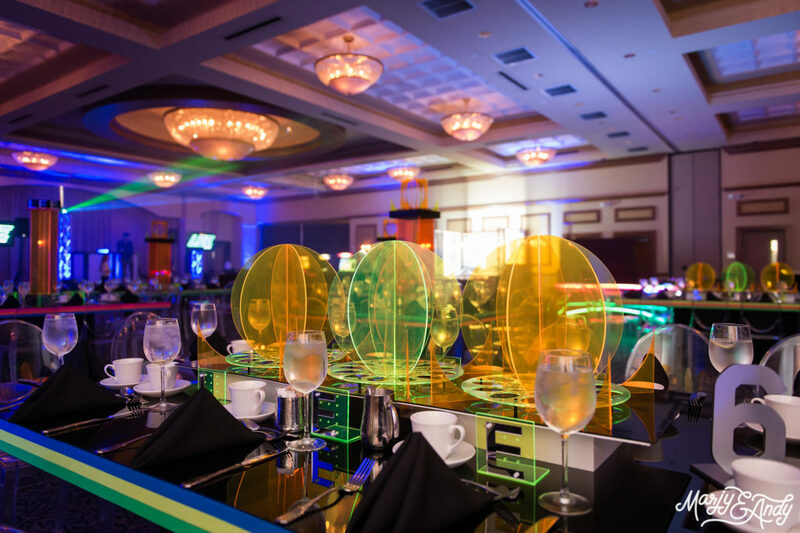 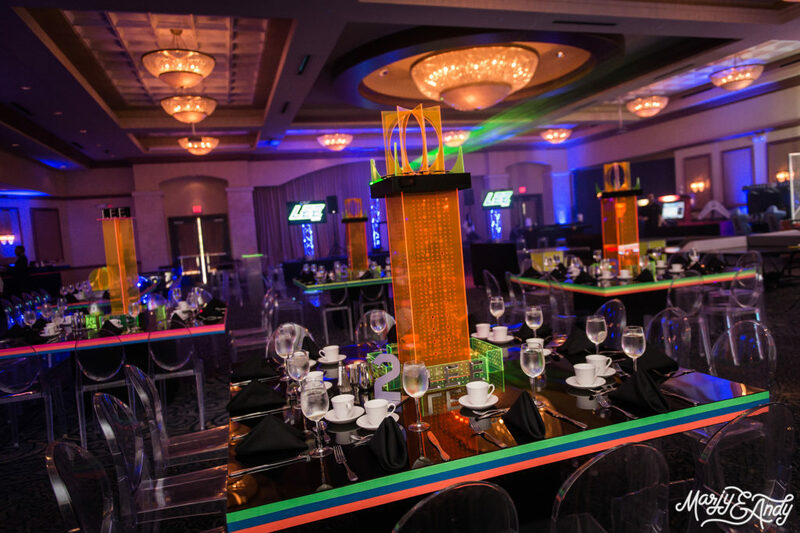 Tali Table Designs created sophisticated custom tables and centerpieces with neon touches which scored plenty of points during this luncheon celebration. 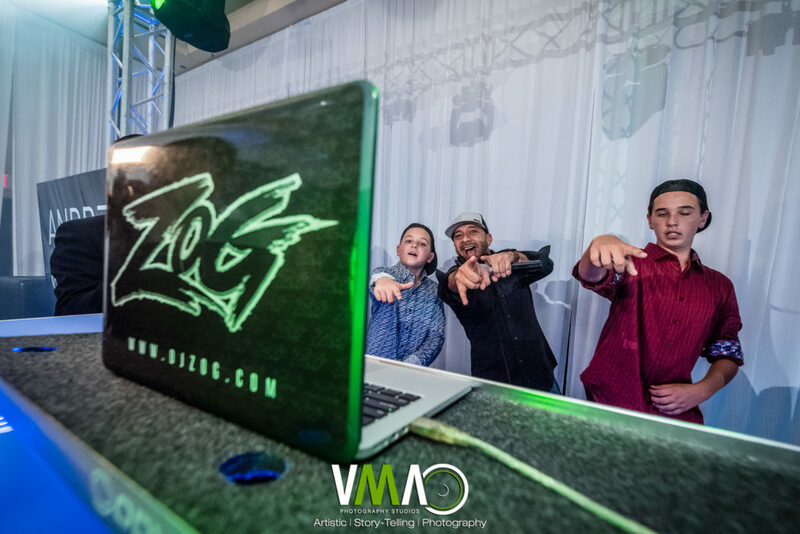 Pure Energy Entertainment never disappoints; Emcee Matt and his crew always come to every event with their game faces on and ready to play! 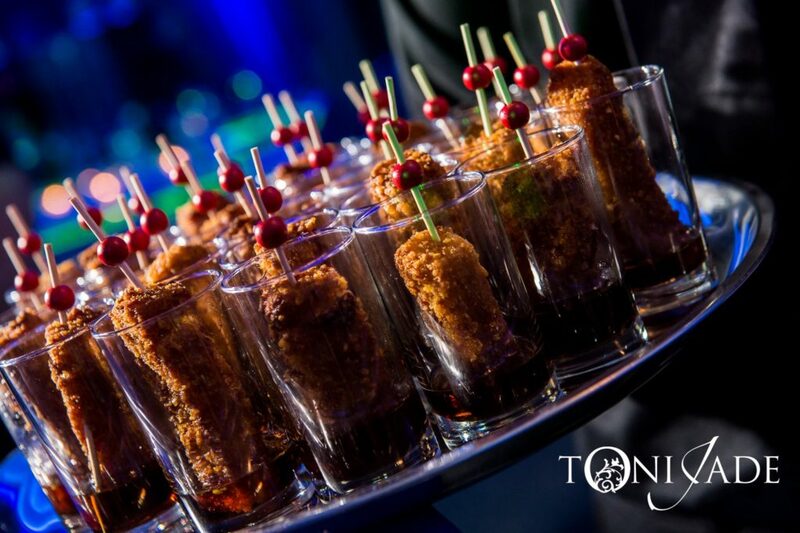 Another star player was VIP Caterers. 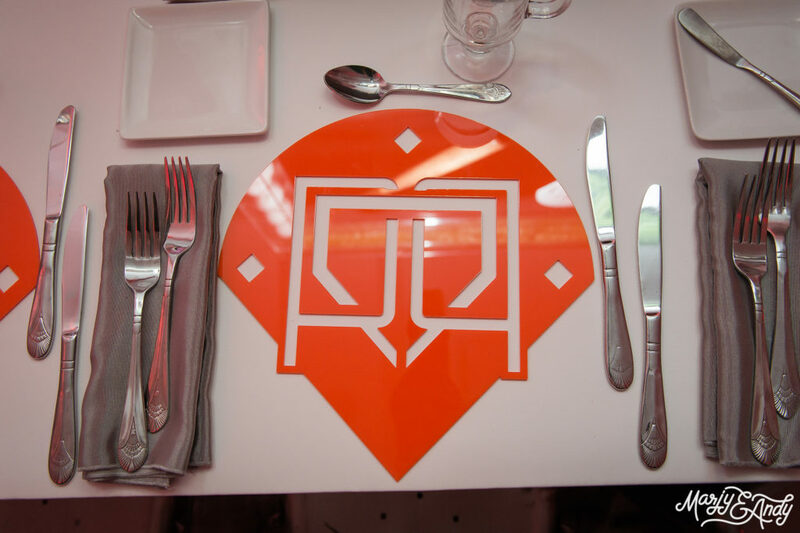 They served up the perfect brunch menu for gamers big and small. 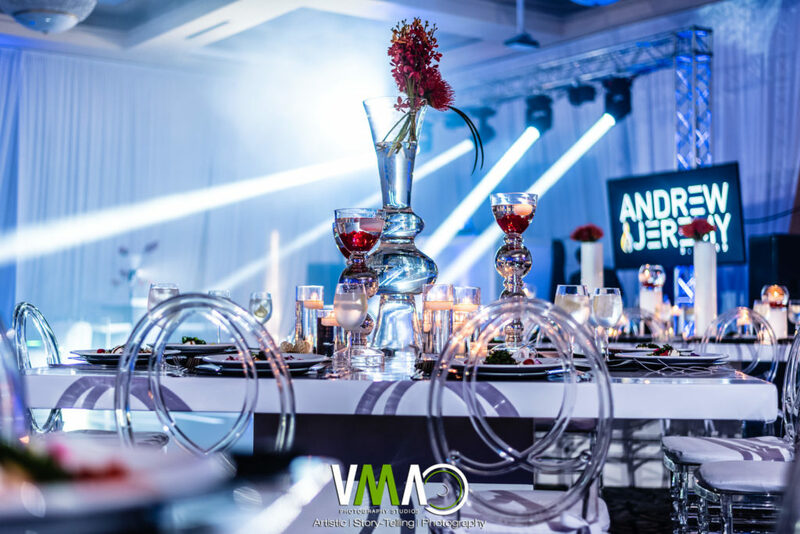 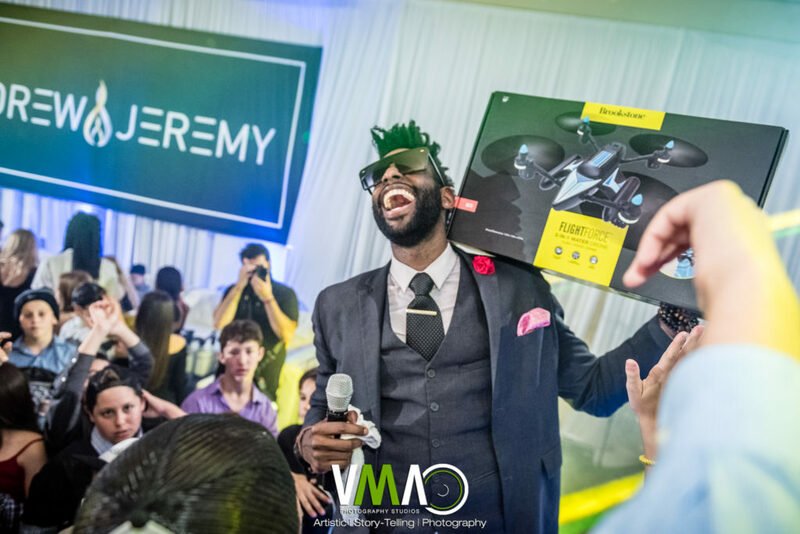 Marjy & Andy Photography and JC Video Productions know it’s all fun and games but didn’t miss a shot to capture all the winning moments. 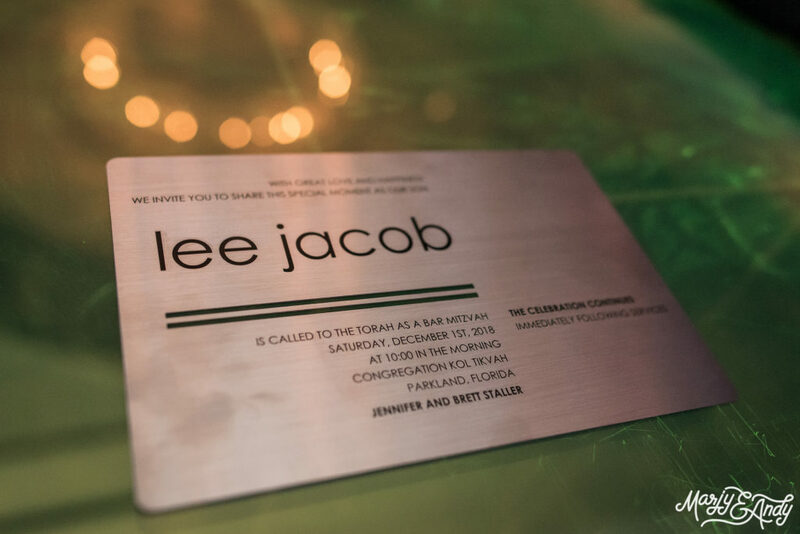 Mazel Tov again to Lee and his family! 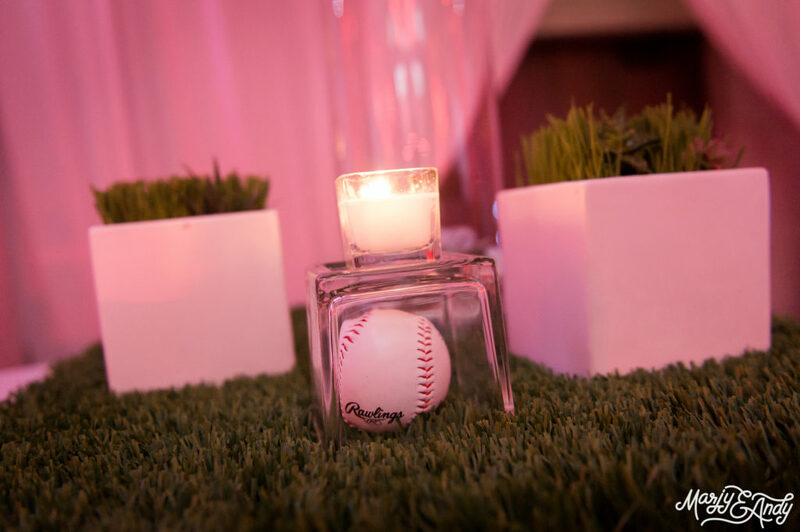 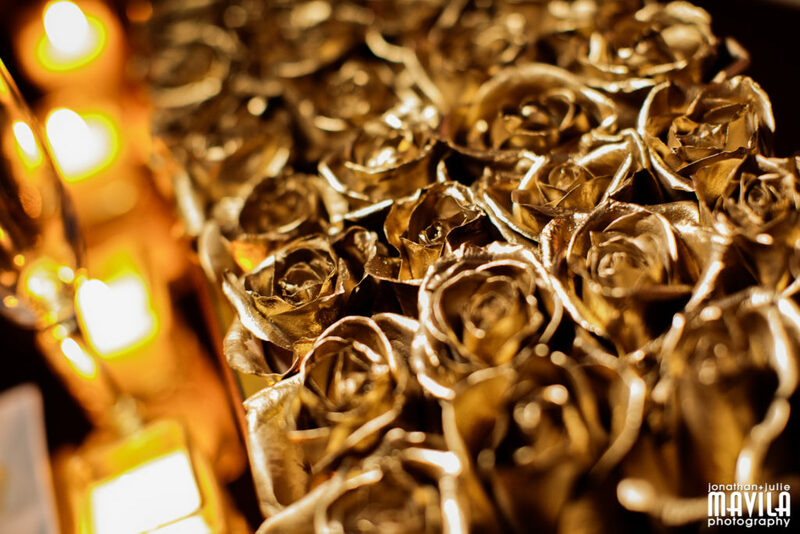 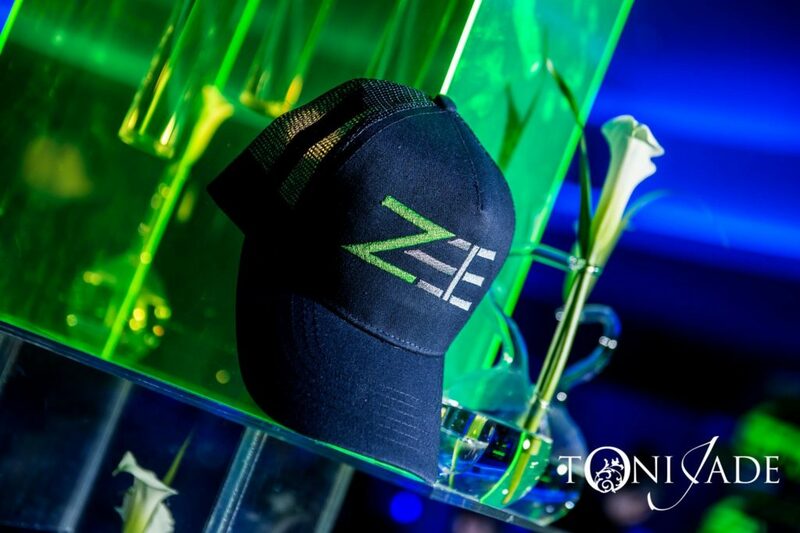 Keeping your head in the game always make a STYLED EVENT. 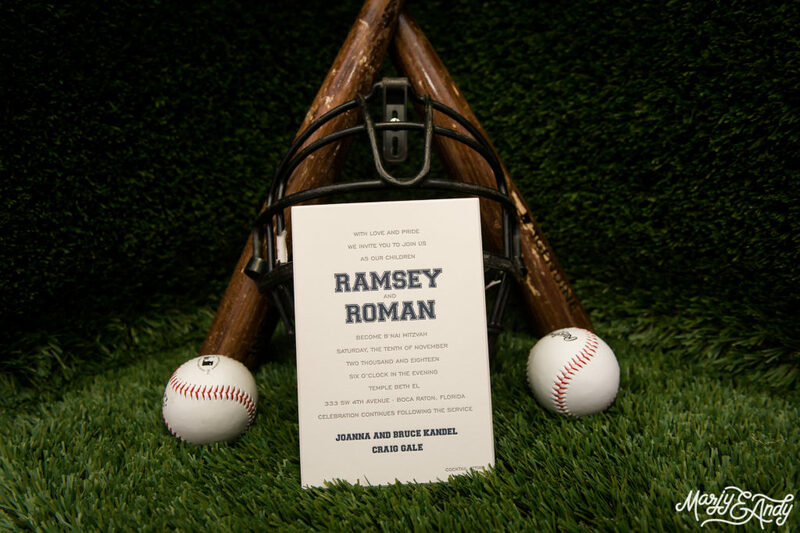 Two brothers with one love for baseball made planning this event a great start at home plate. 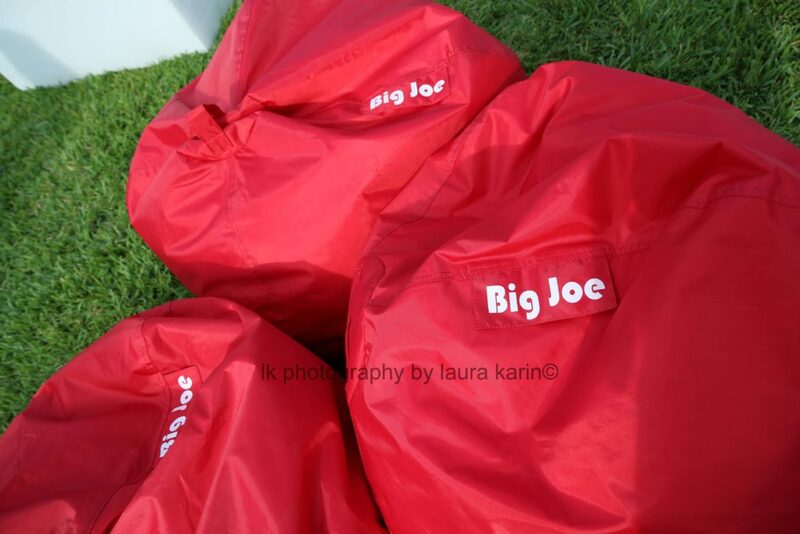 However, the athletic duo along with their number one fan (Mom), didn’t want a traditional rendition of the game. 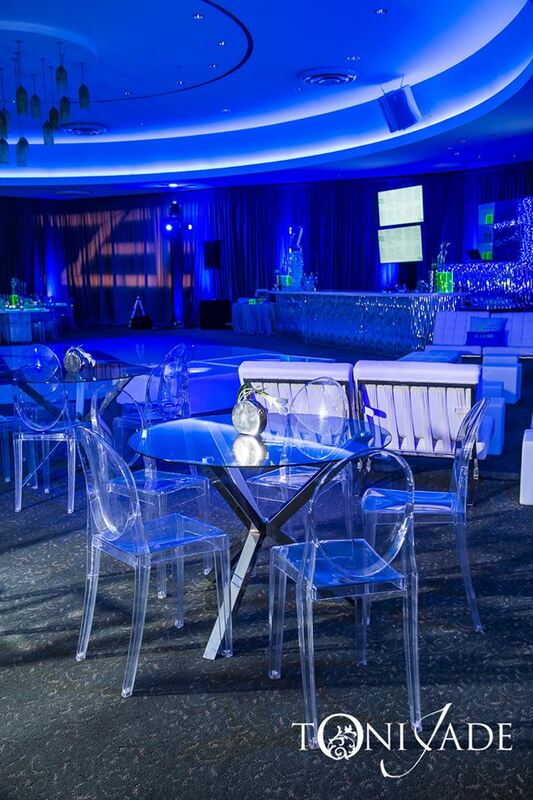 It needed to be sleek and modern with slight touches of the classic sport. 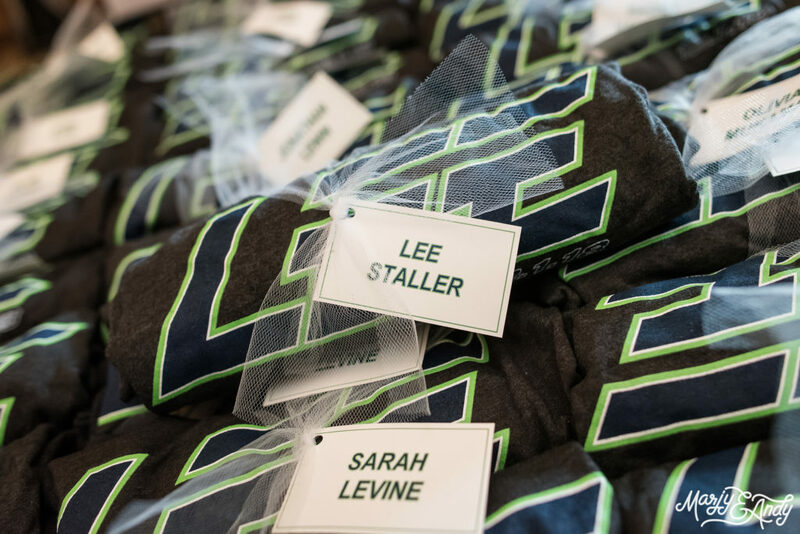 We immediately knew who we would recruit to be on our all-star team. 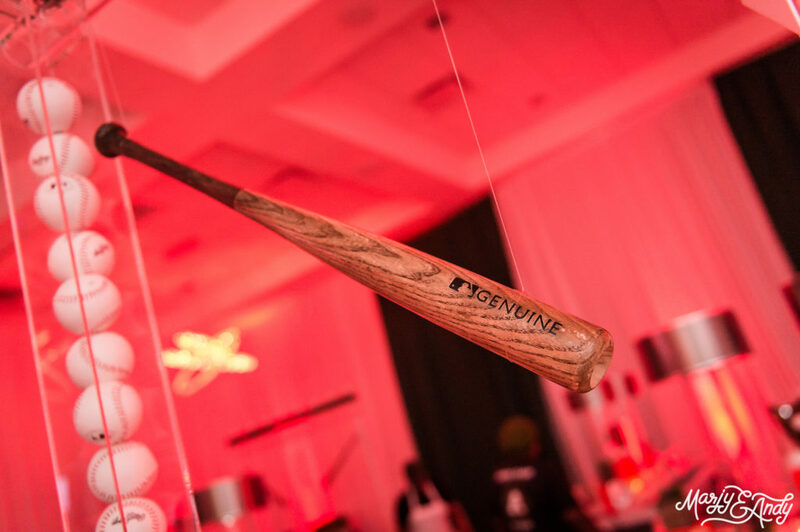 First up to bat would be Galaxy Productions, we know they never allow any curve balls. 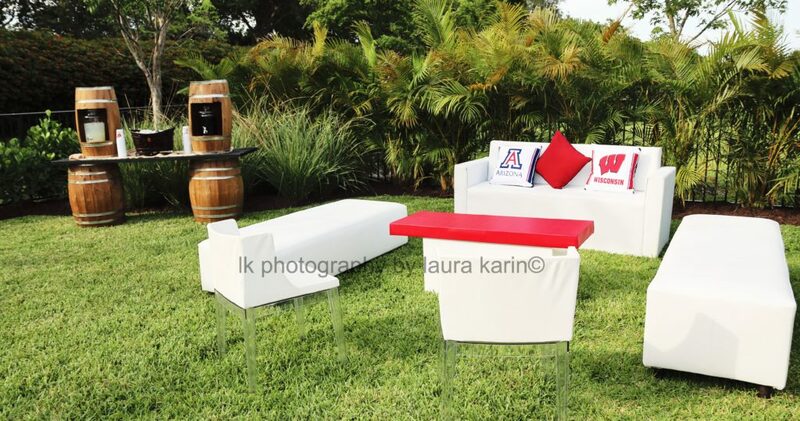 So, we began the design plan and decided on not just one pop of color but two. 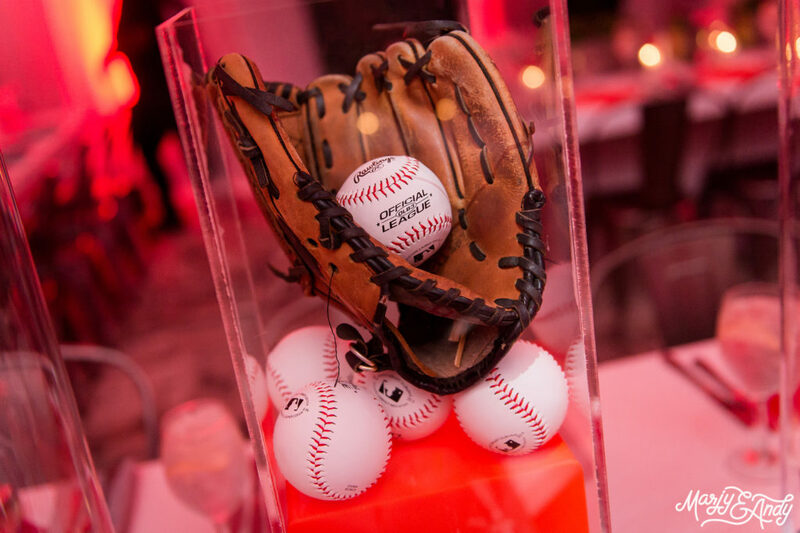 Orange and red would be our choices for this grand slam event. 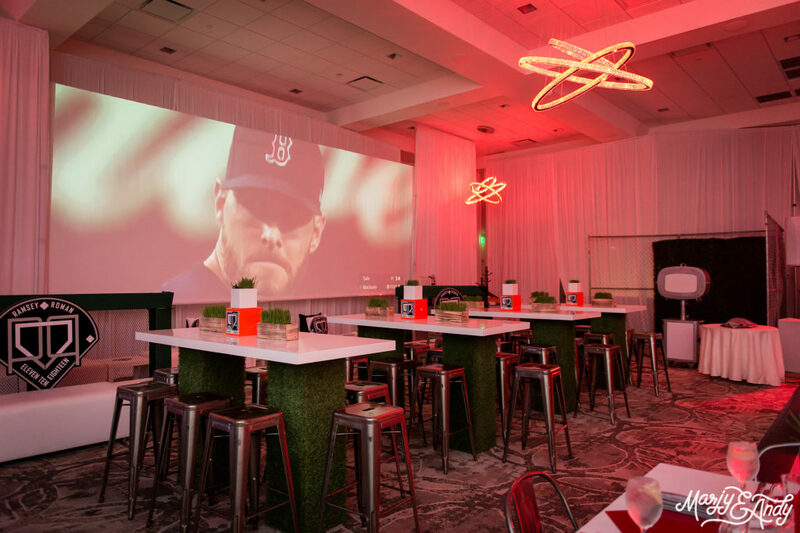 We wanted the teen area to replicate a dugout and feature giant video mapping of famous baseball moments such as the Red Sox winning the World Series. 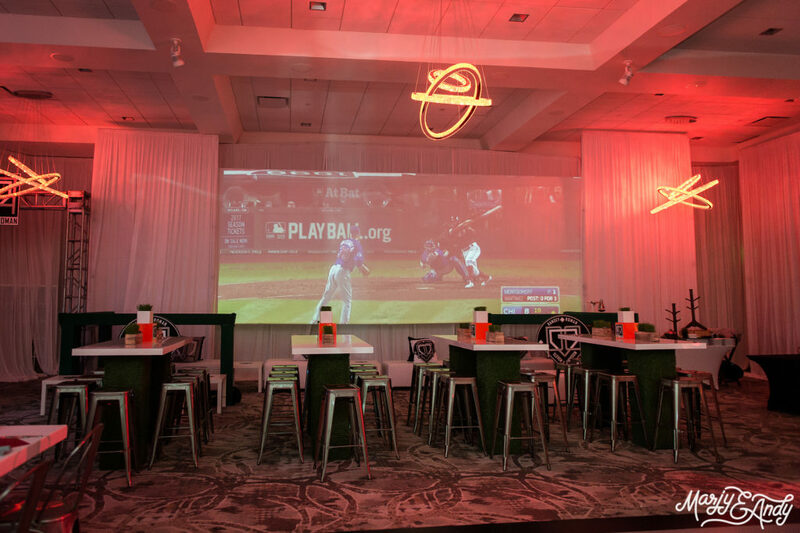 The rest of the playing field would need a wrapped dance floor, custom tables, great seating, an oversized bar, and amazing centerpieces. 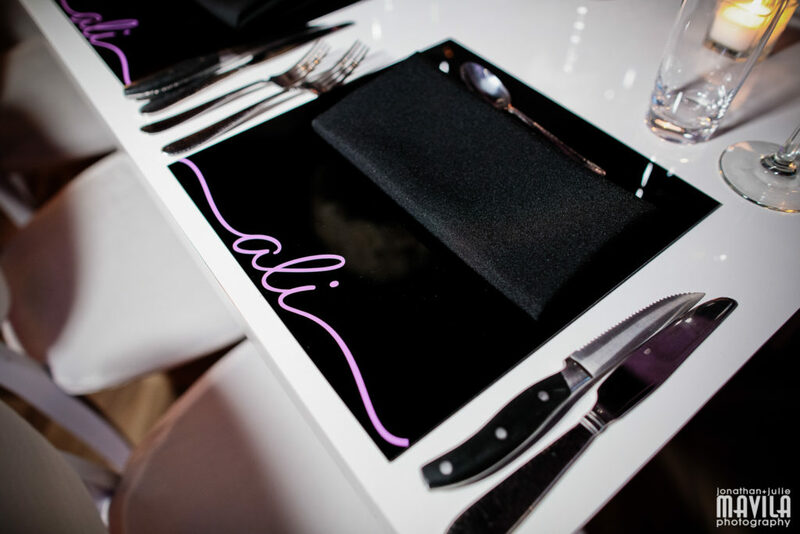 Our other key players would be Tali Table Designs followed by Just Bars. 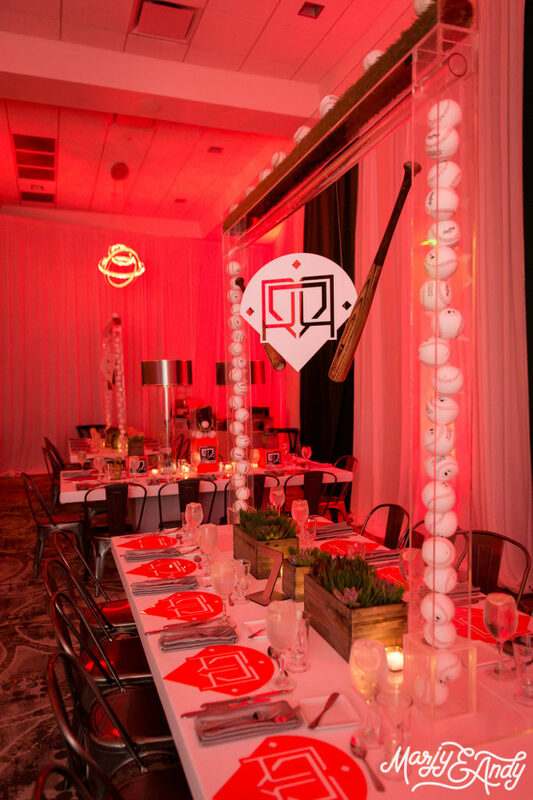 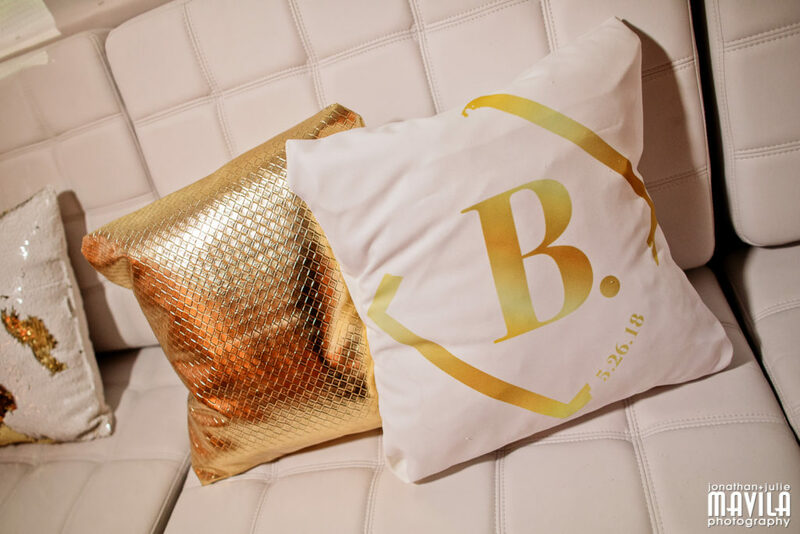 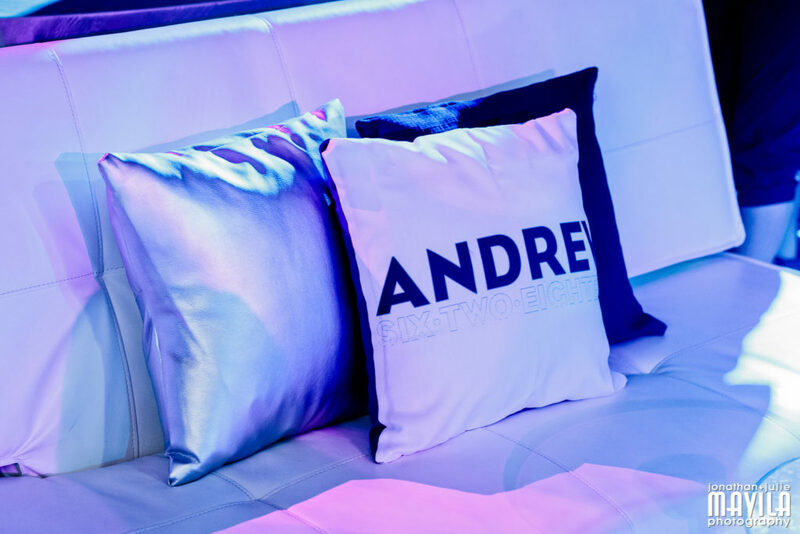 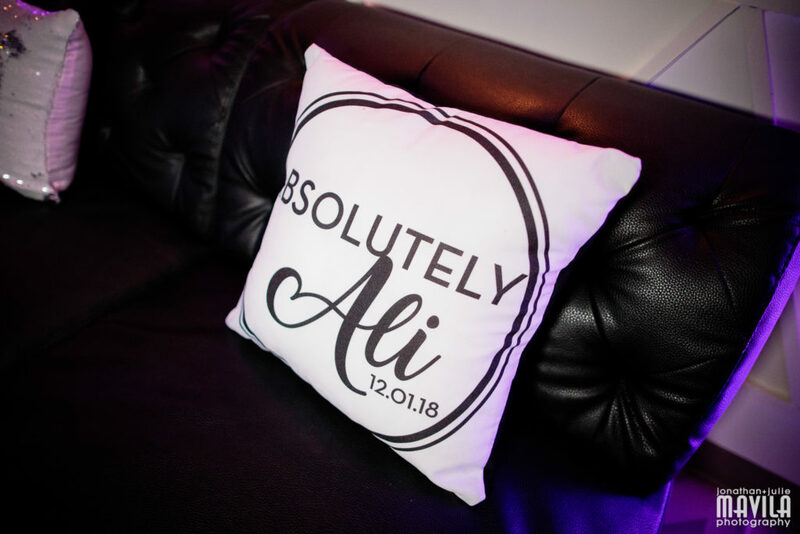 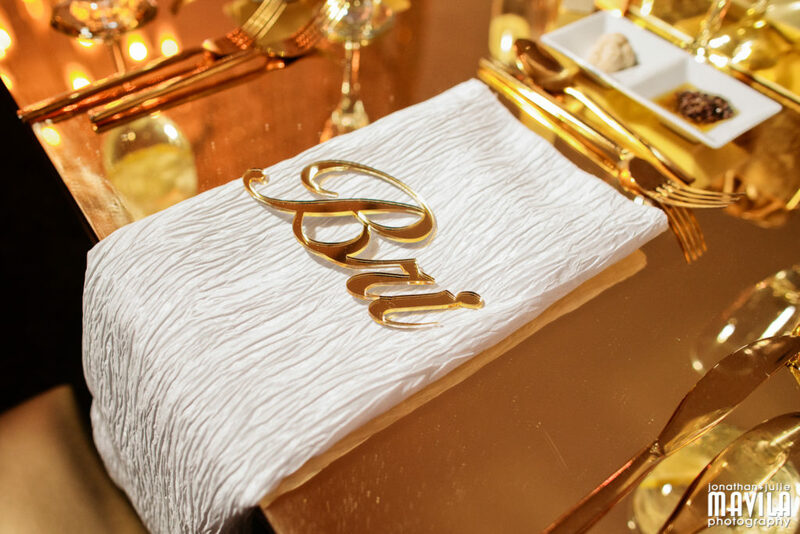 The hand-made tables to look like a leather ball complete with red stitching were supreme as were the laser cut acrylic logo base-shaped placemats in coordinating colors. 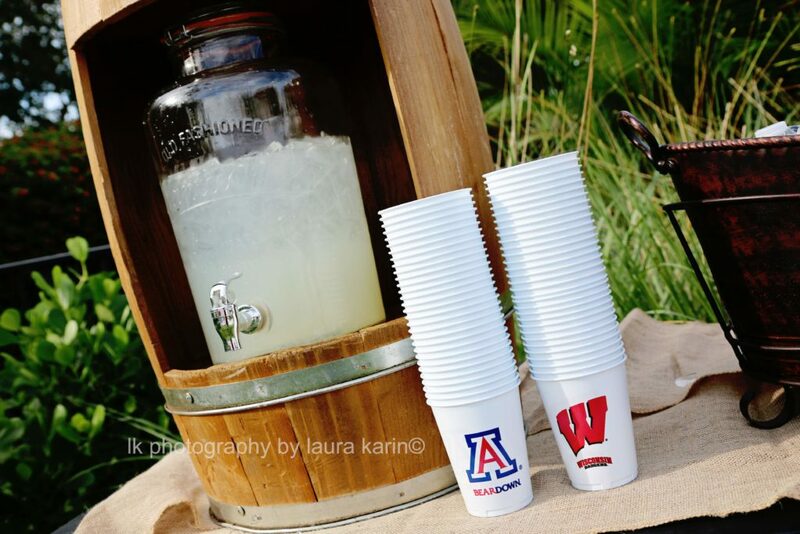 Our massive grass bar was also quite the hit with this crowd. 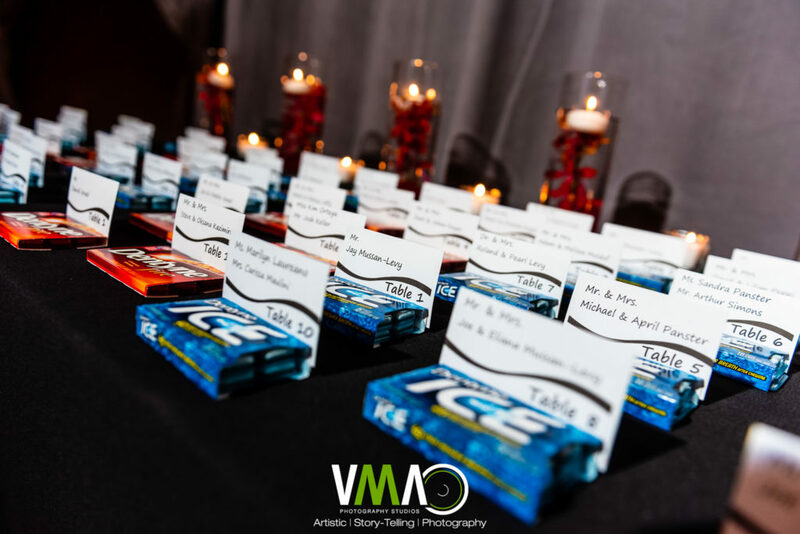 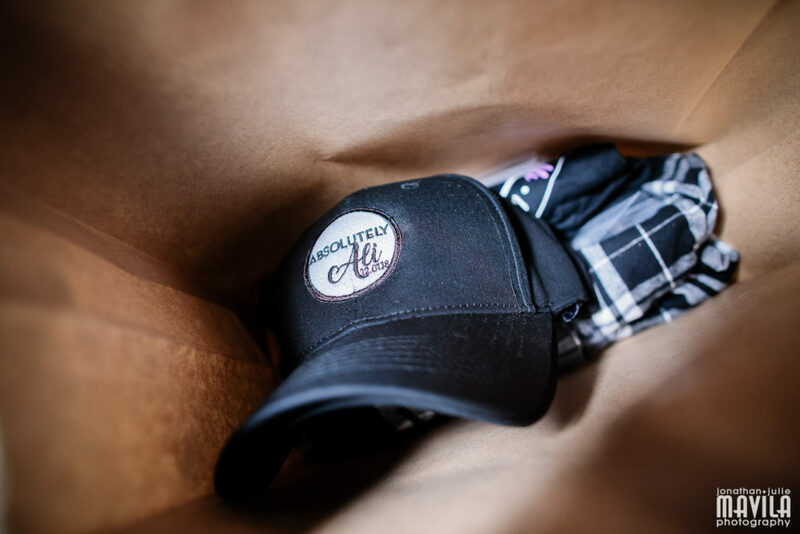 More VIP players on our infield team consisted of Artisan Foods Catering, Rock With U Entertainment, Lux Images, and Jason Chandler Video Productions. 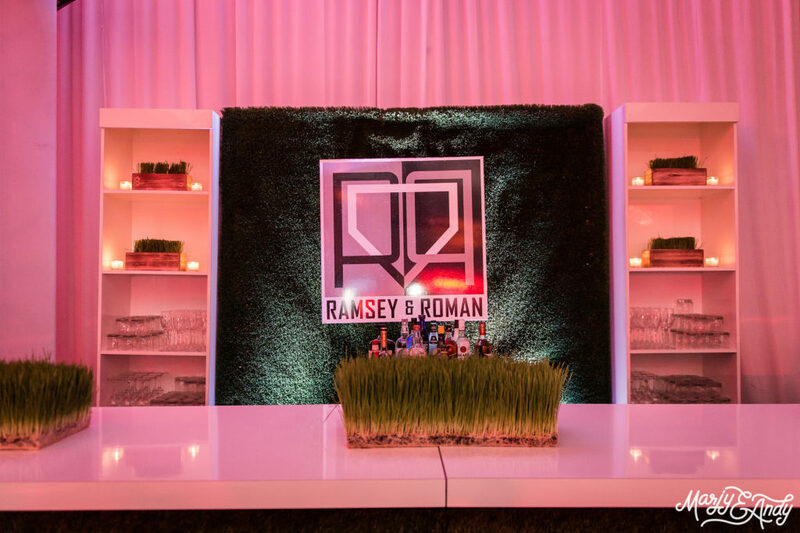 Emcee Chris kept the dance floor packed all night while the Artisan team scored a home run with their incredible menu. 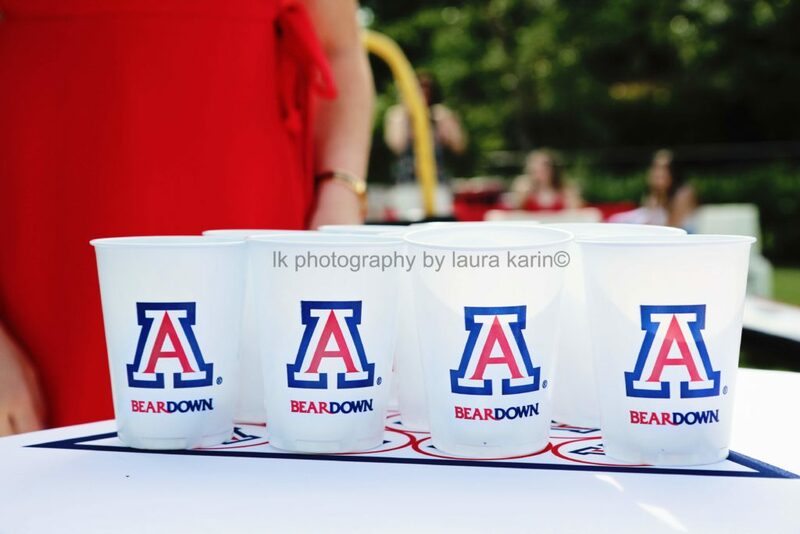 Nothing kept our photographers and videographer from capturing each play-by-play moment either. 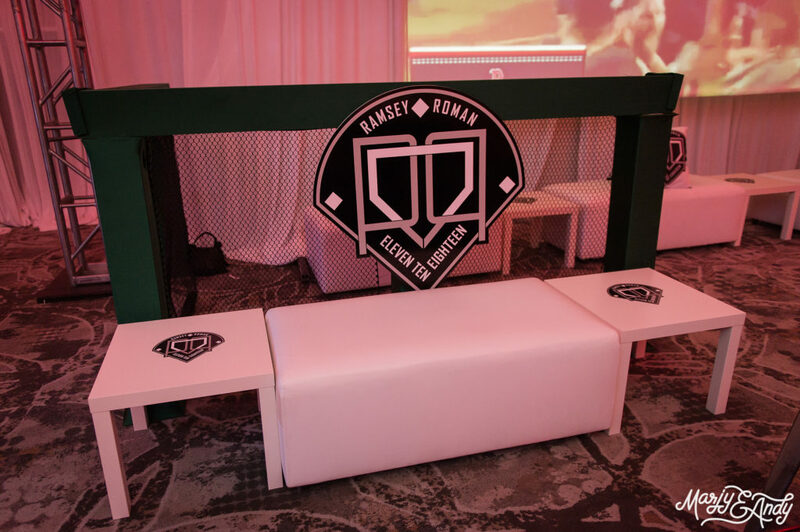 We know that the players in the outfield are just as important, so we had Capture Pod Photo Booth and Freddy the Artist entertain our big and small fans alike. 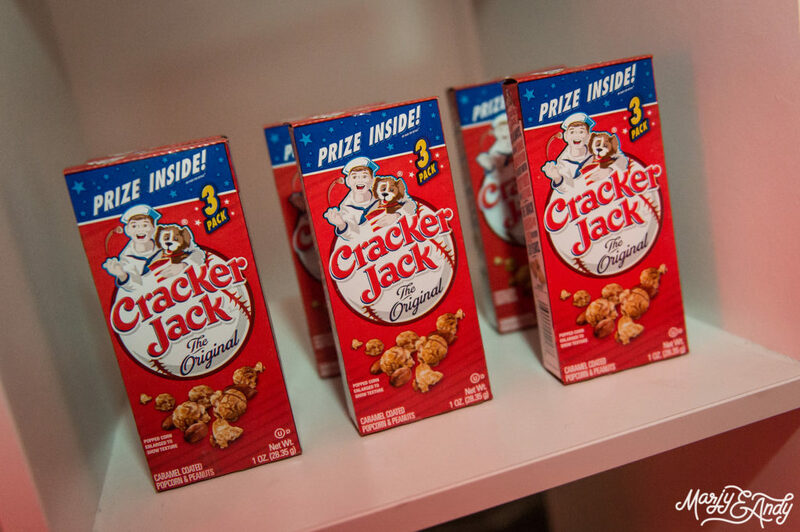 The baseball concession stand at the end of the evening was stocked with iconic ballpark treats including the original Cracker Jack. 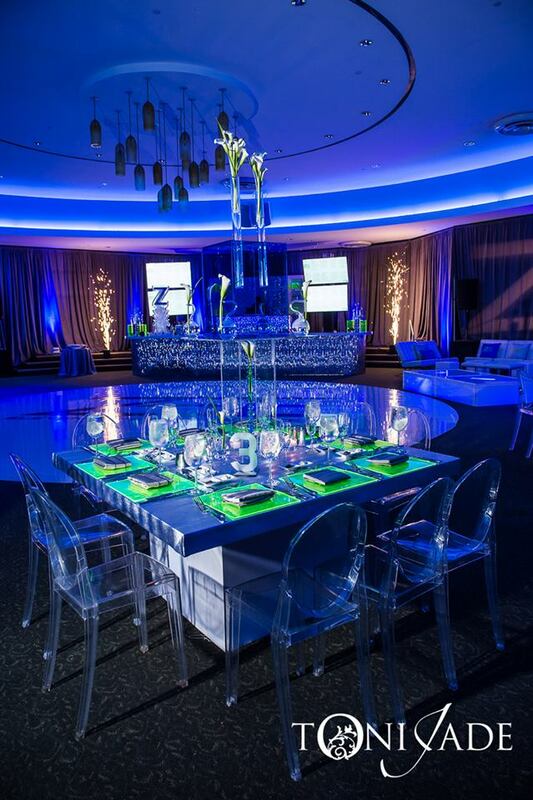 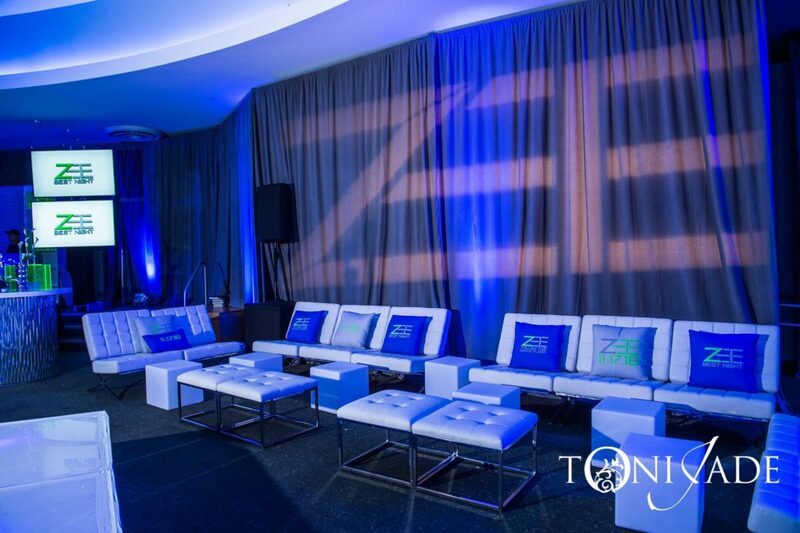 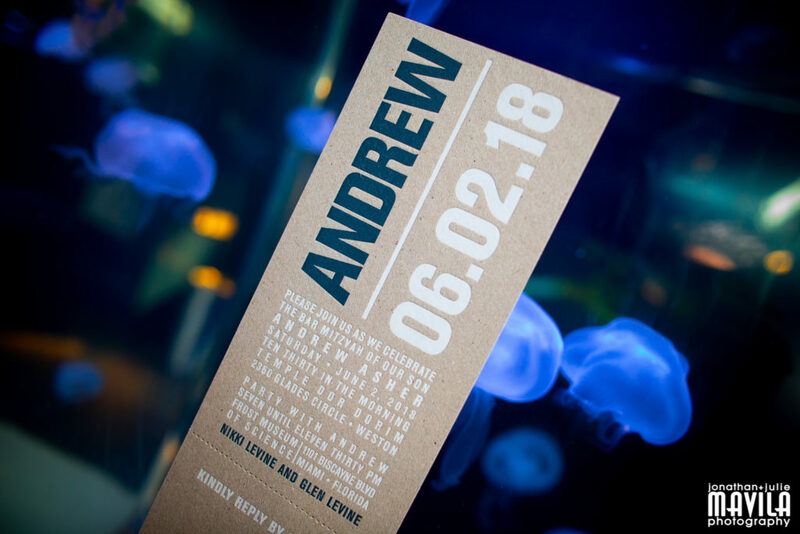 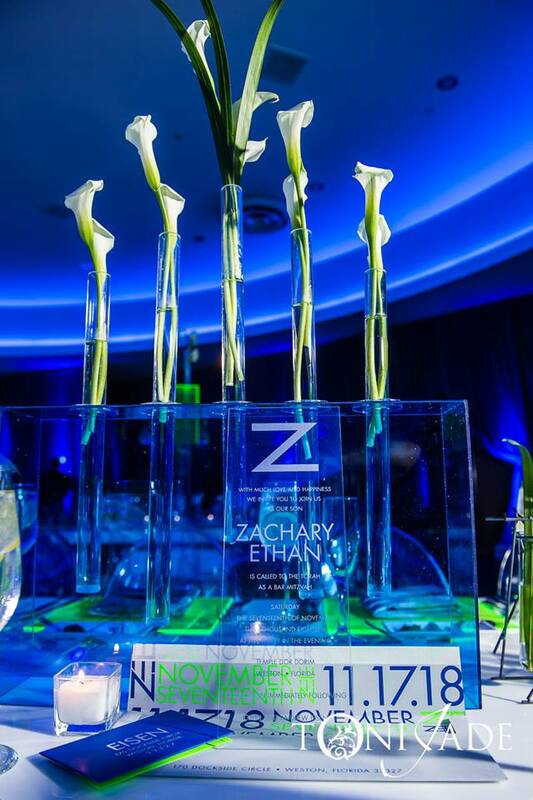 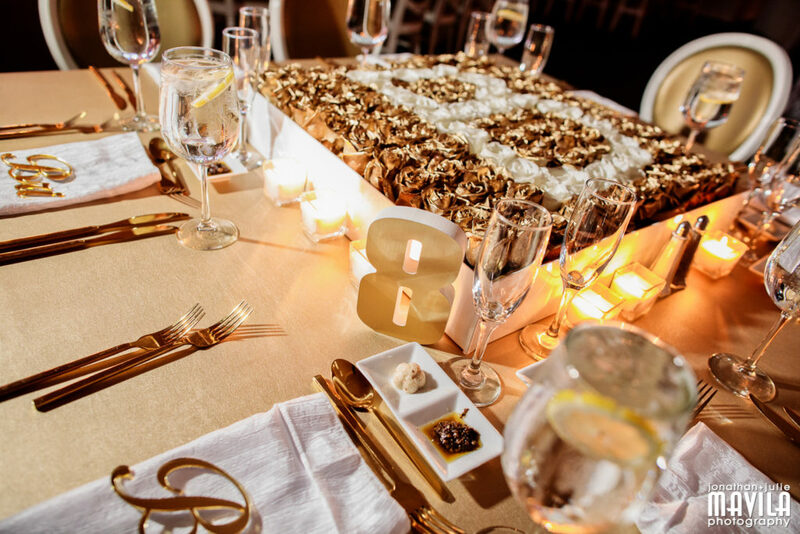 We knocked this one out of the park because having an all-star team and mitzvah family always make a STYLED EVENT. 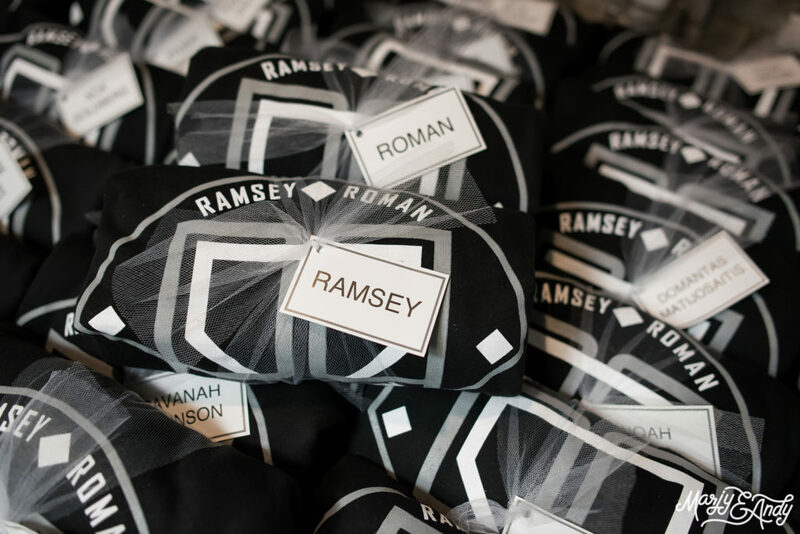 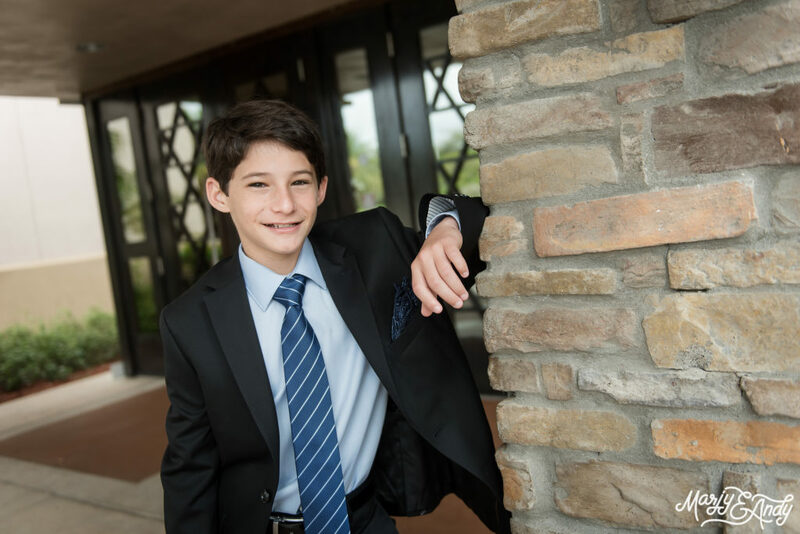 Mazel Tov again to Ramsey & Roman and their family! 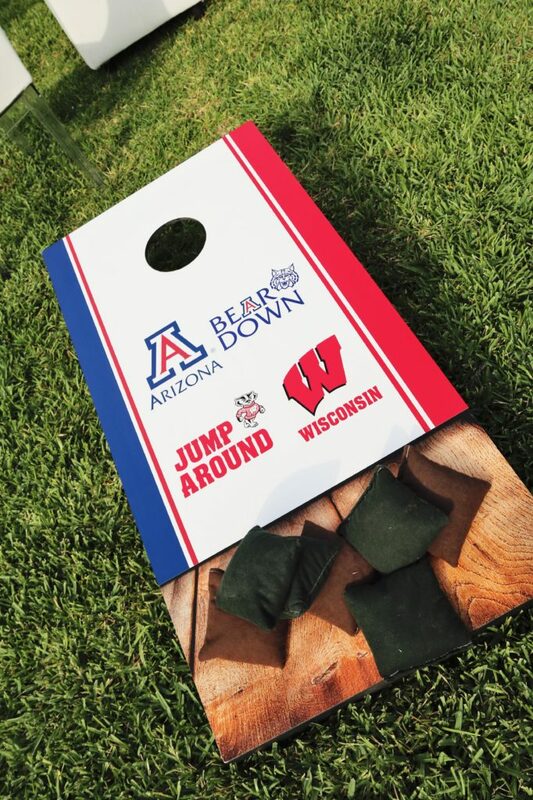 Bear Down and Jump Around! 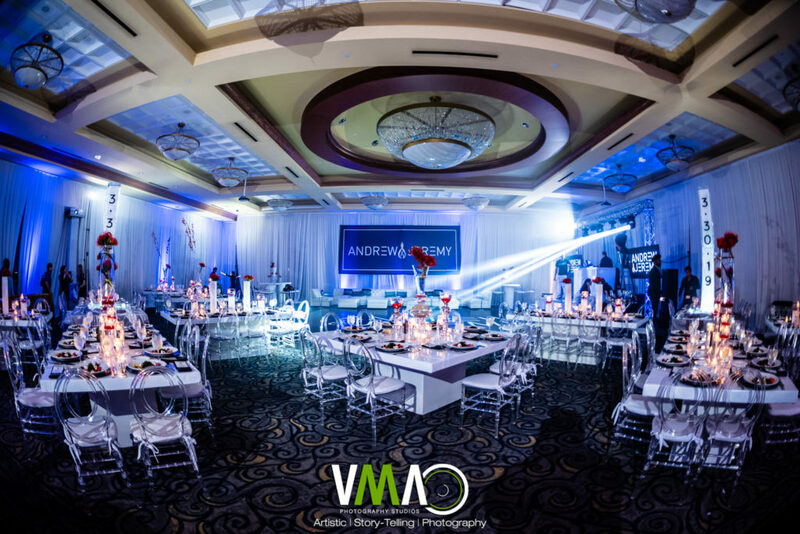 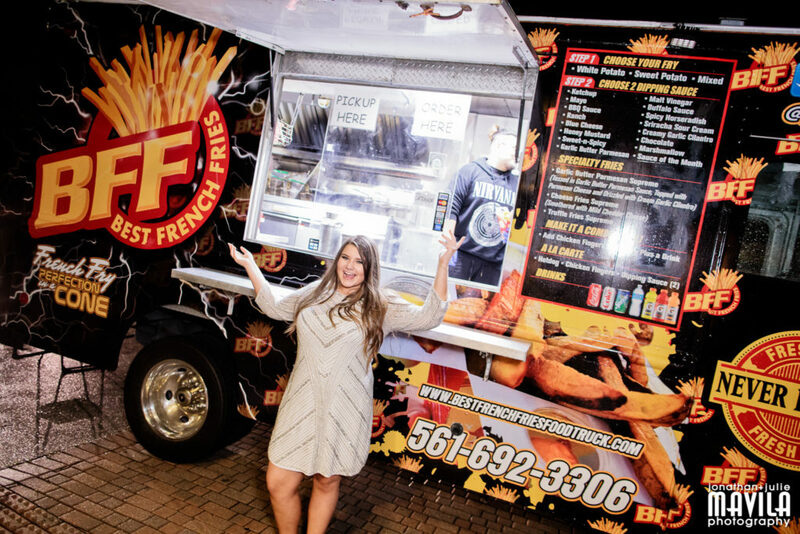 It’s not too often we get to create a graduation party, so we were extremely enthusiastic to have the honor of creating a special one for twin graduates of Marjory Stoneman Douglas High School. 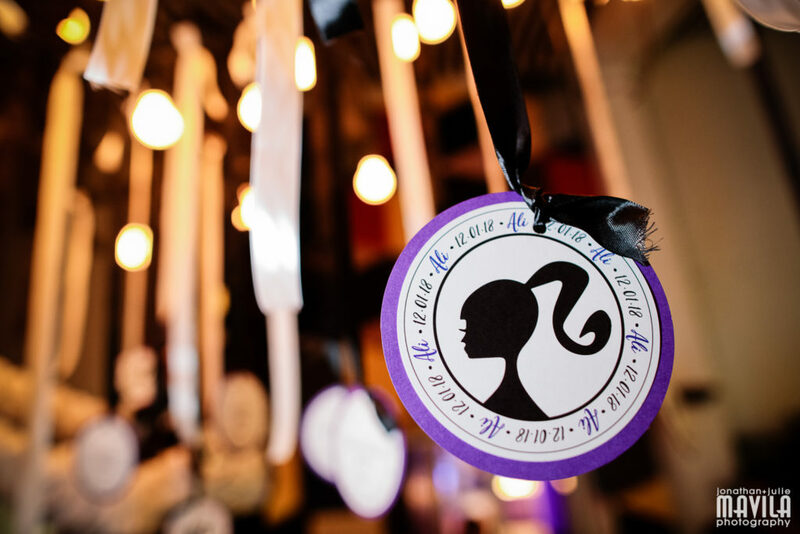 Just as any other event, we wanted to hear the girls’ thoughts and visit the space. 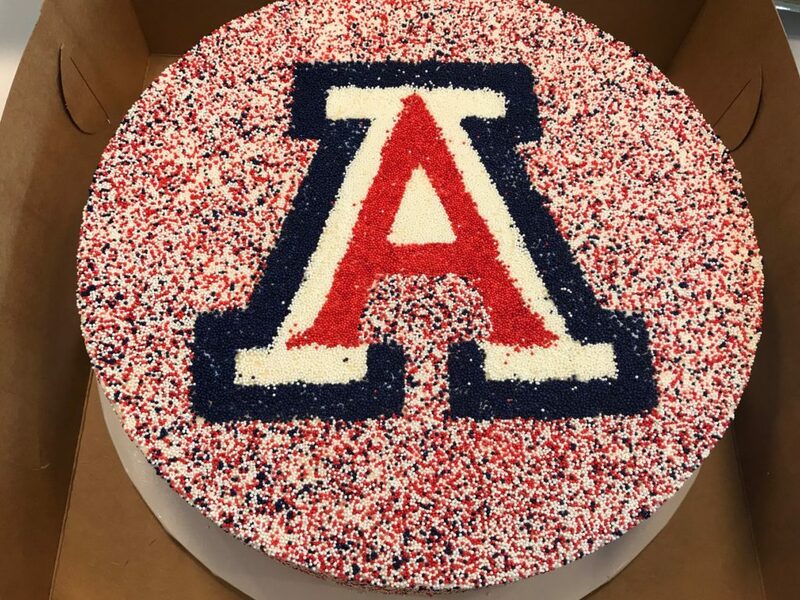 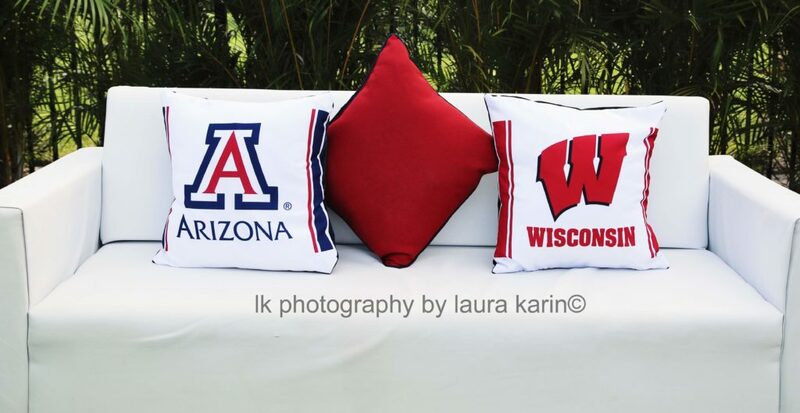 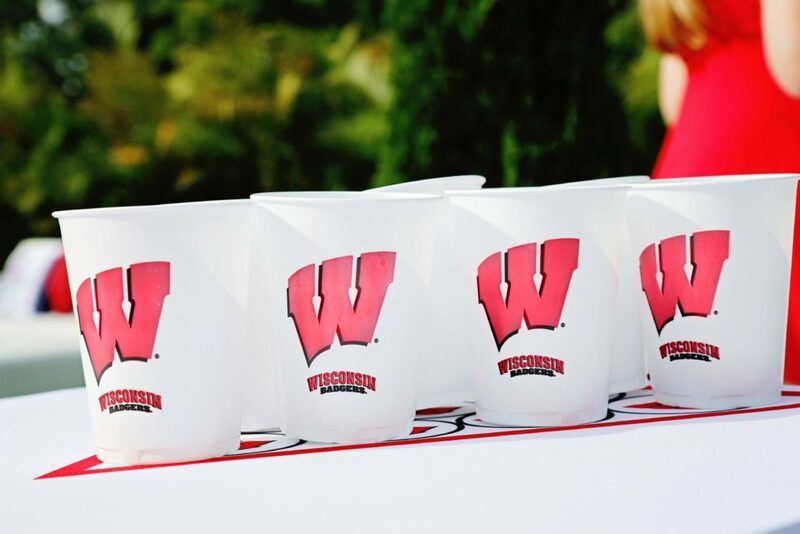 The theme was going to be their college selections which were the University of Arizona and the University of Wisconsin. 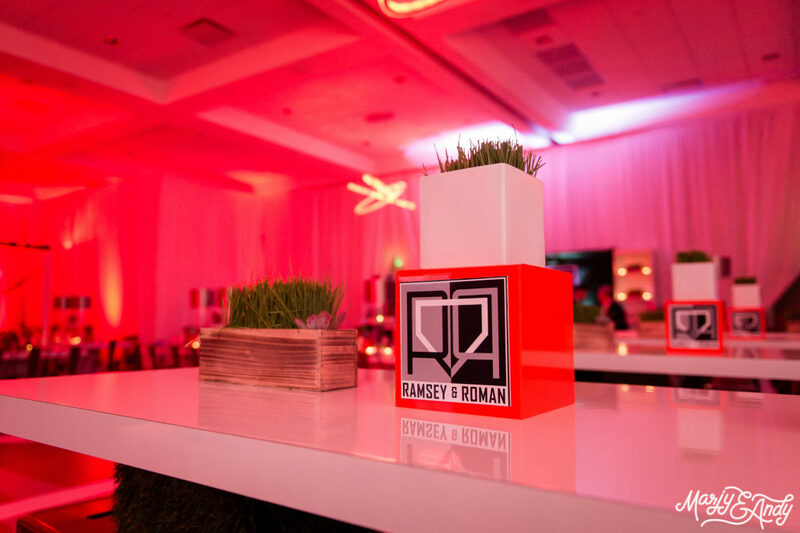 Fortunately for us, the color palette worked together with red being our dominant hue. 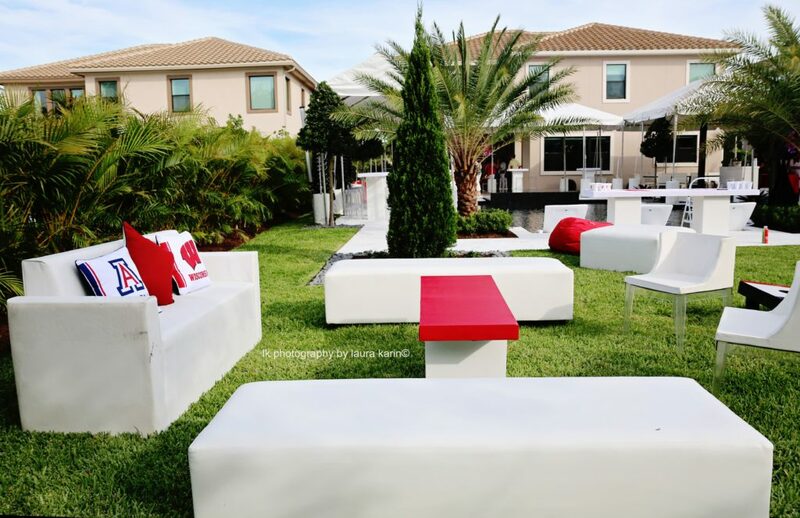 We instantly knew that custom tables were a necessity, so we went to Tali Table Designs with our grand plan and collaborated to make this a backyard party like no other. 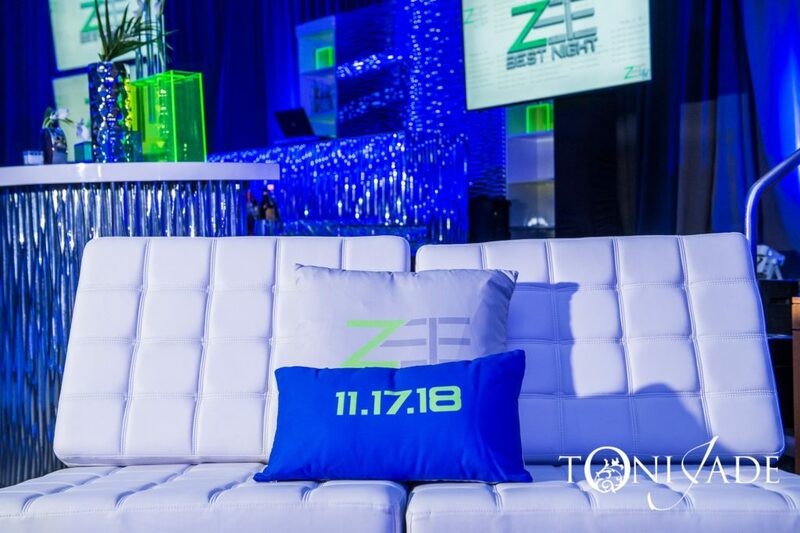 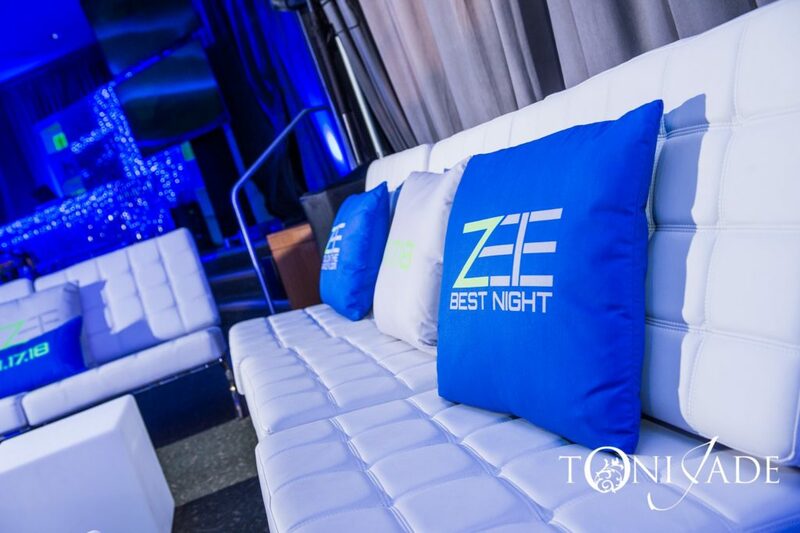 The teen space included lounge seating groups with custom pillows, giant bean bag chairs, a game of corn hole, and a custom designed imitation pong game (used with lemonade and iced tea) to replicate dorm life. 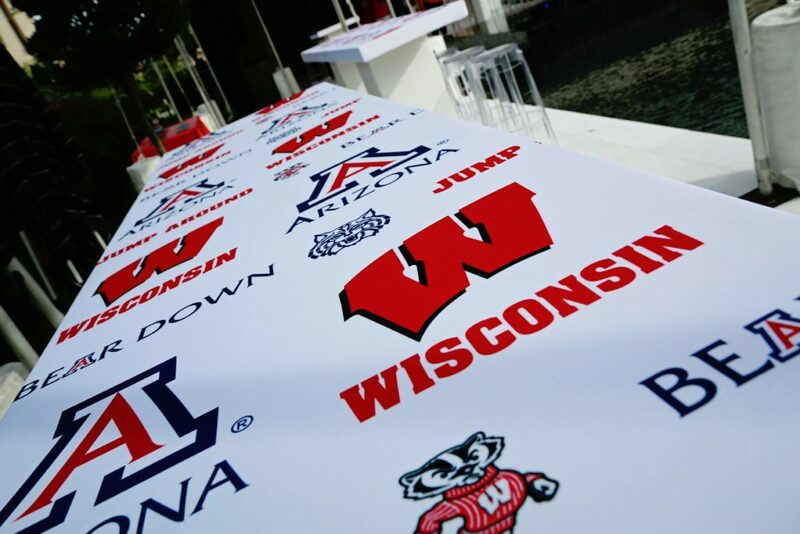 The custom adult bar had the Guests of Honor’s (GOH) logo design as the back bar, while the high tops had alternating school logos. 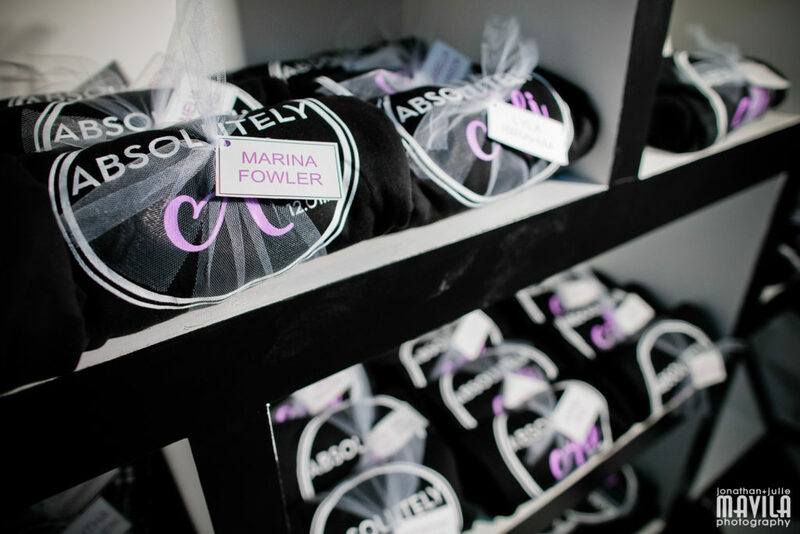 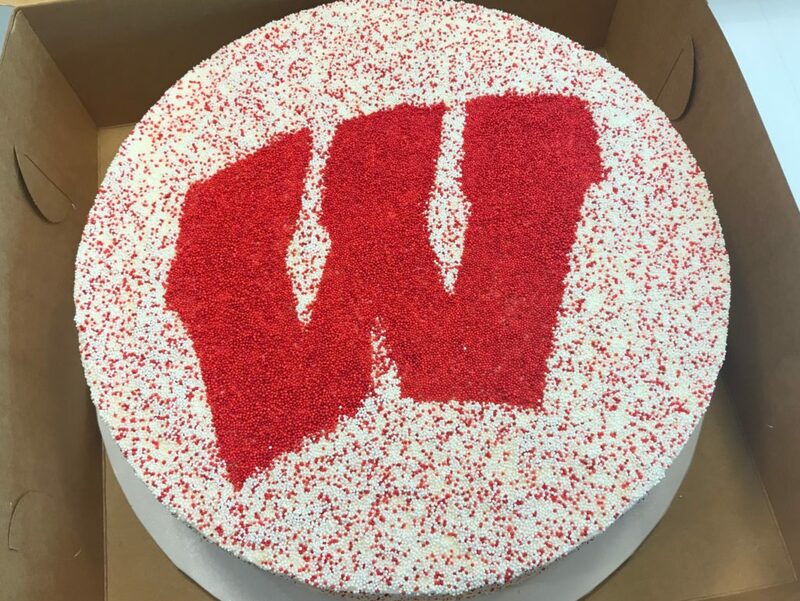 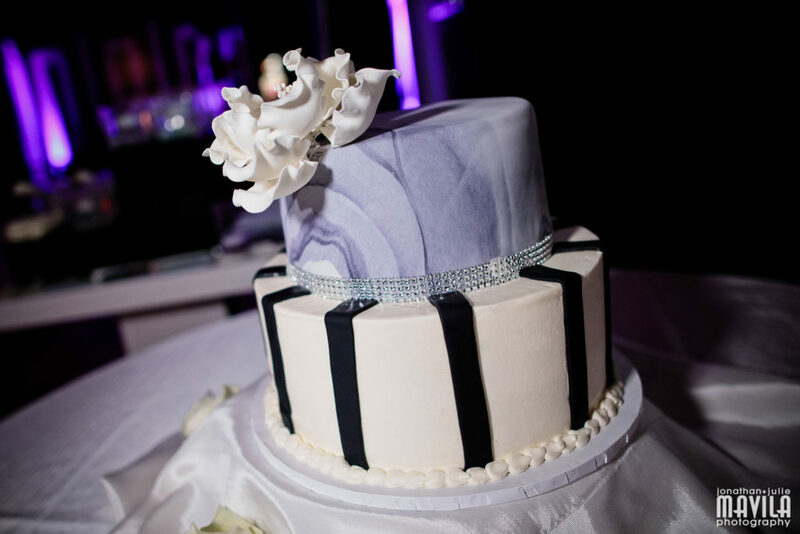 Chez Gourmet Catering received an A+ for presenting a delicious menu and CAKED by Cynthia White also made the grade with her two incredible custom designed and delectable cakes. 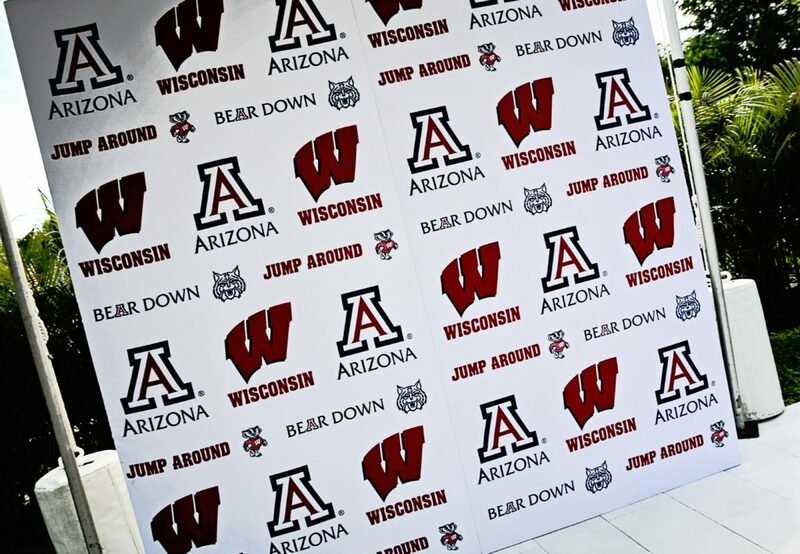 DJ Juan was a big man on campus as he played the duo’s favorite tunes. 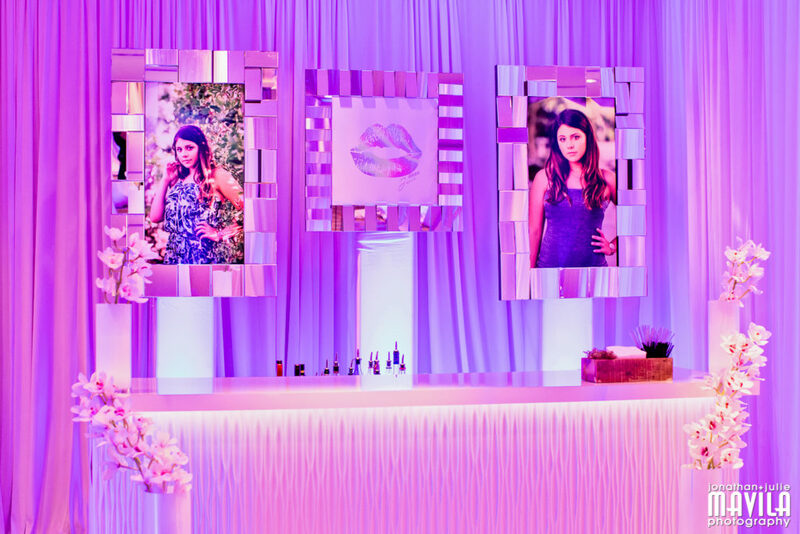 Another popular extracurricular activity was the photo booth. 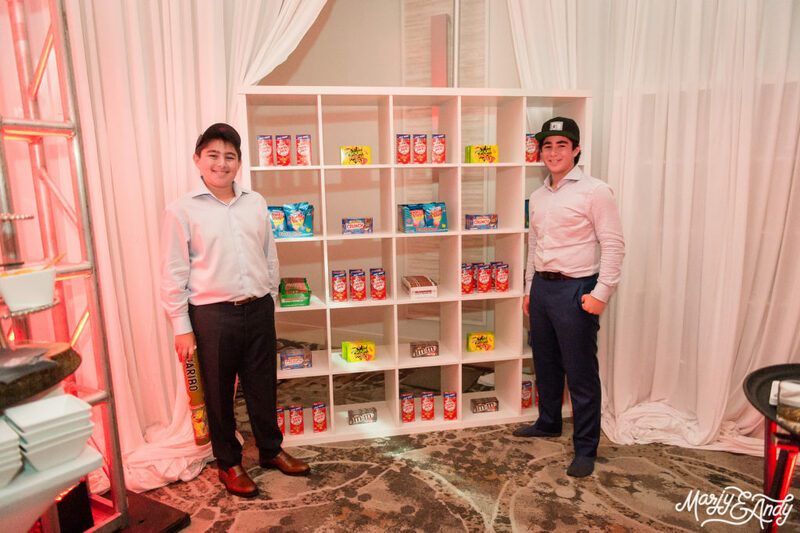 Guests of all ages loved sharing smiles and memories. 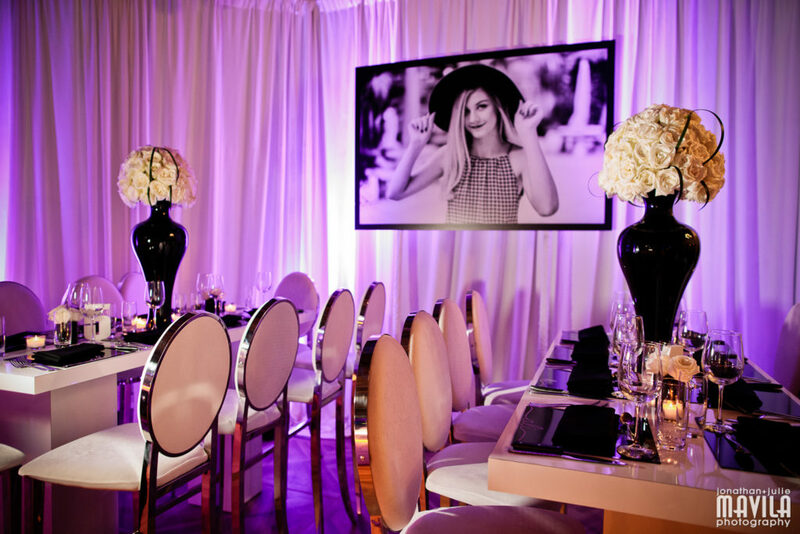 Staying on course always makes a STYLED EVENT. 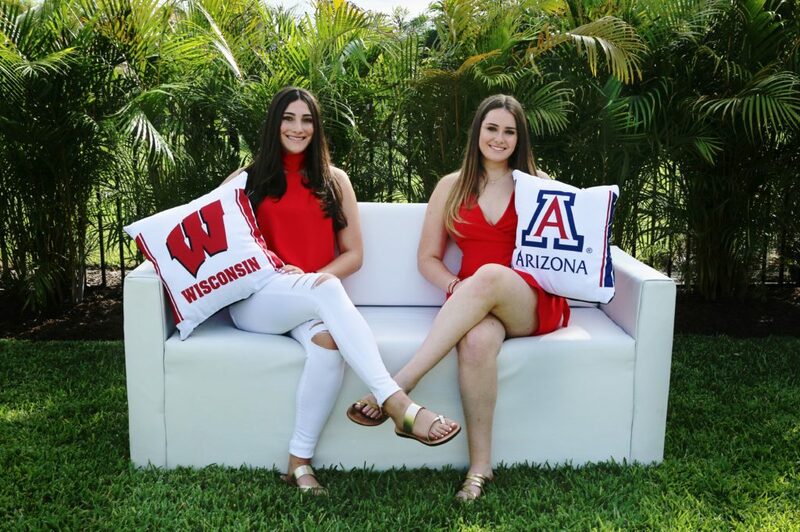 Congratulations to Sydney, Hailey, and their family! 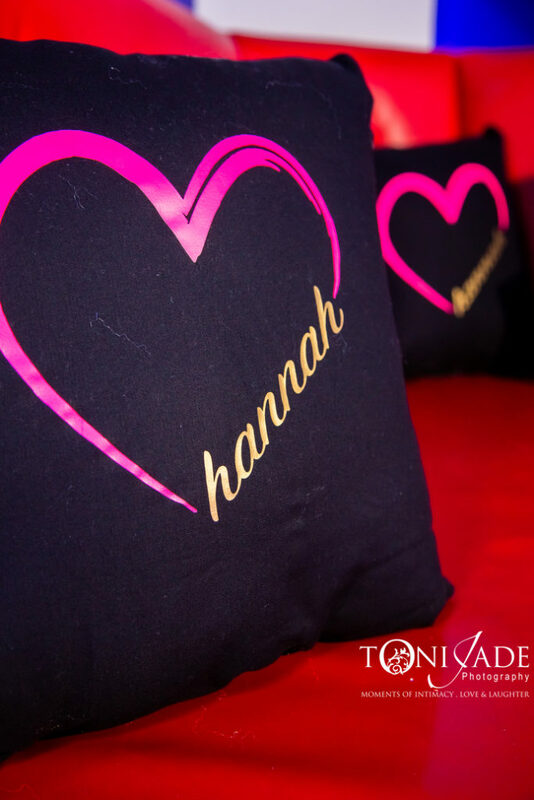 The celebration continued for this Guest of Honor (GOH). 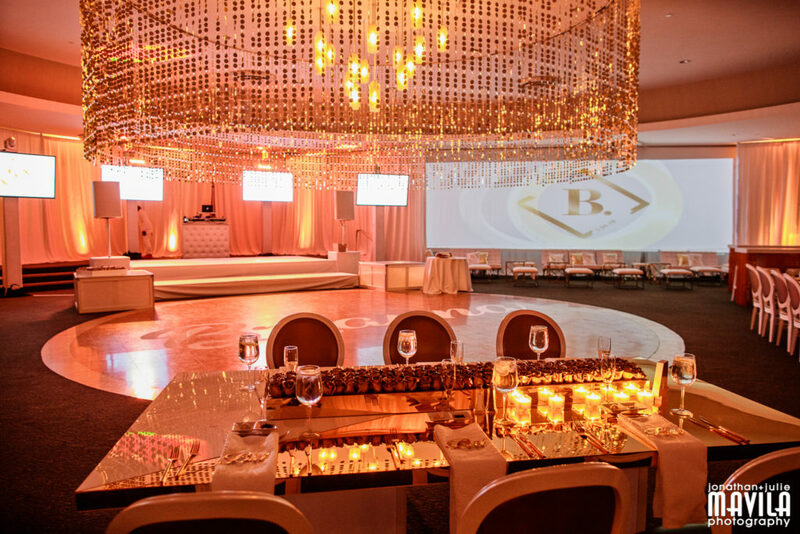 After an amazing Shabbat dinner at The Farmer’s Table two weeks before (see previous blog for all the details), we brought the party to the grand ballroom at the Wyndham Boca Raton. 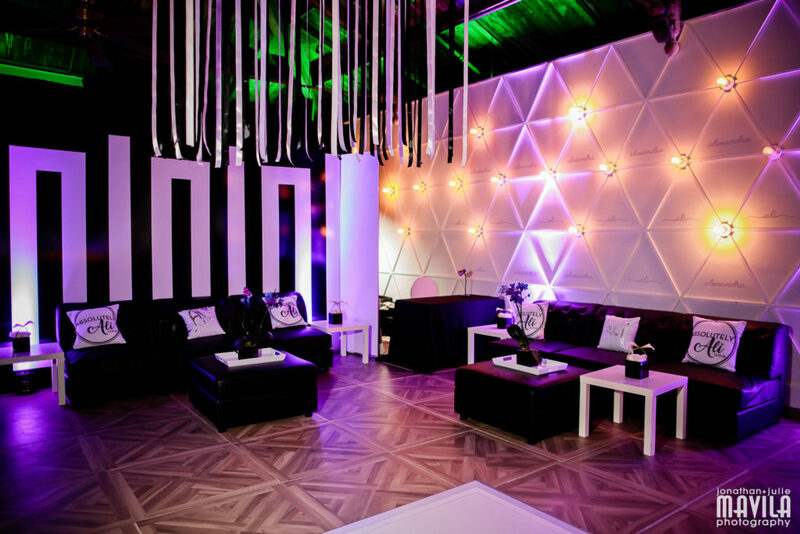 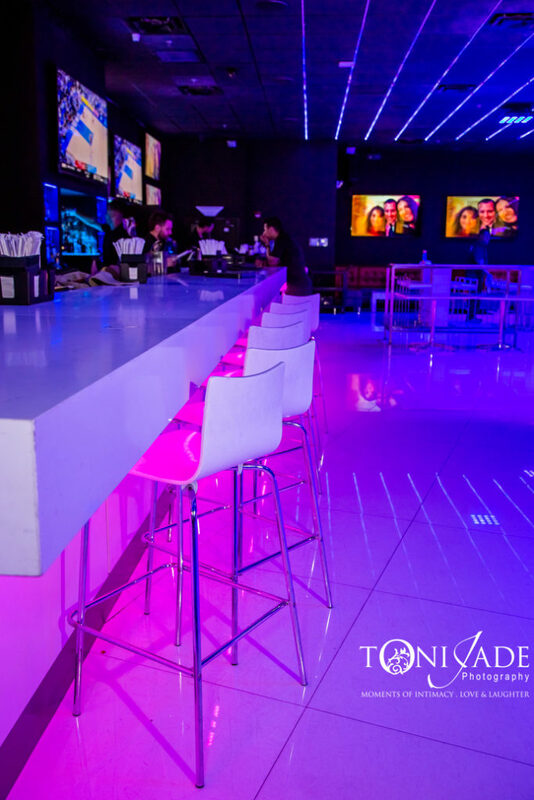 However, the space needed a total transformation to pull off the look we envisioned for our GOH. 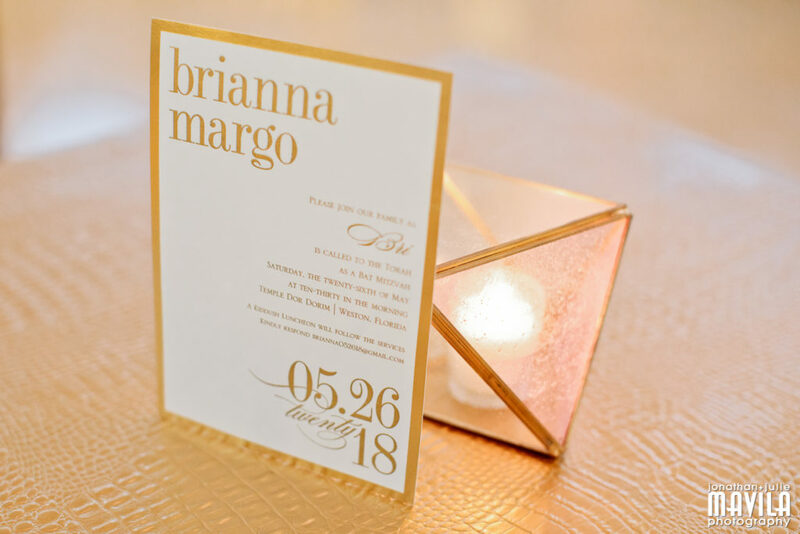 Upon our first meeting, we knew exactly the direction to proceed in after our stylish teen chose her invitation. 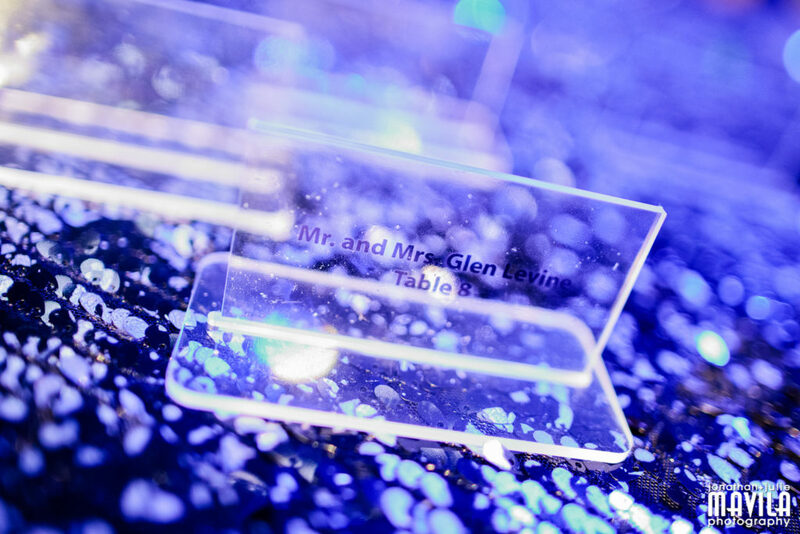 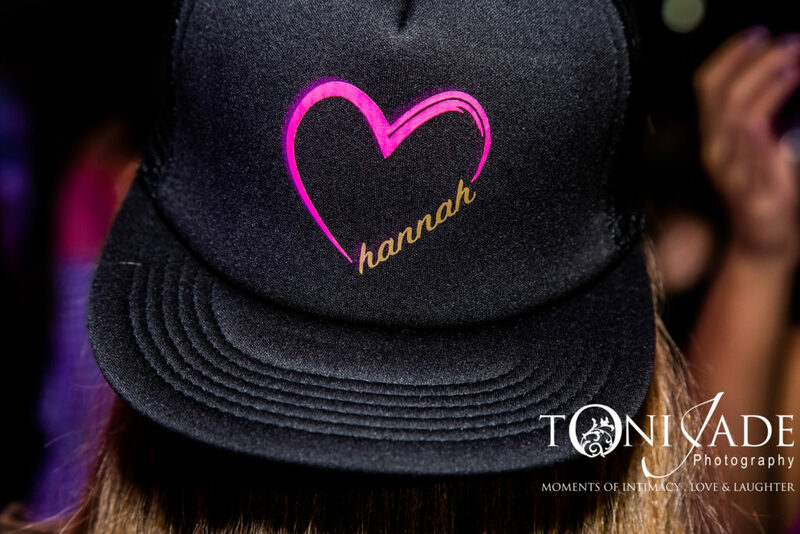 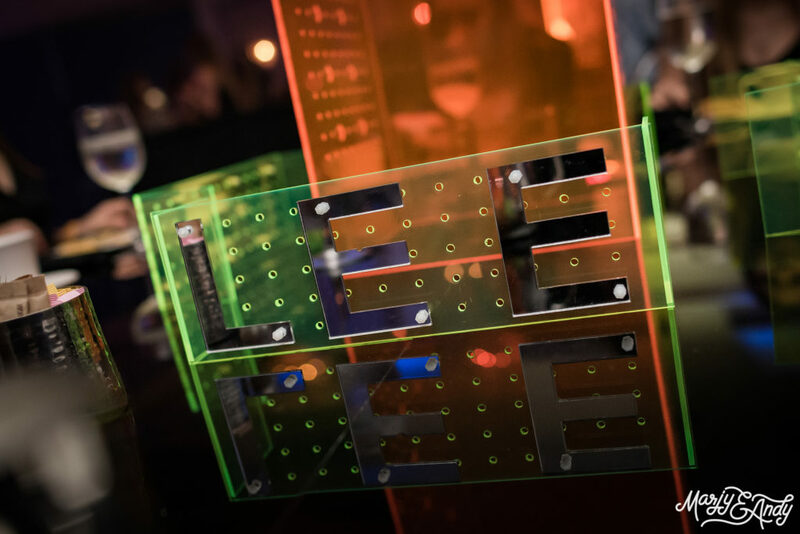 The invite was on a thick board with holographic elements including a lips graphic which became our signature logo. 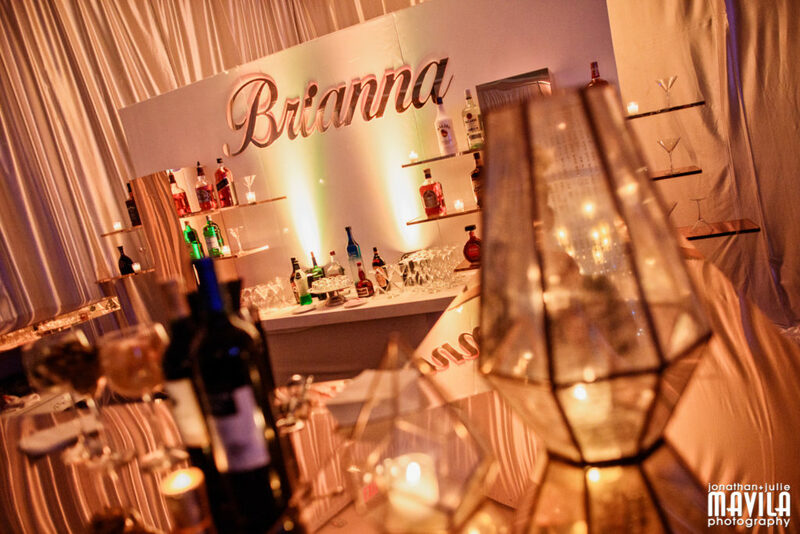 We thought a party with a similar look would be perfect. 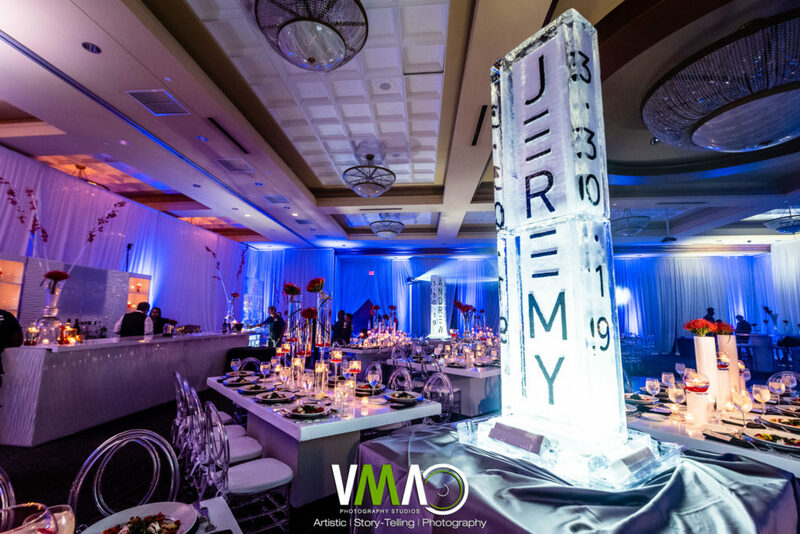 We then went straight to Galaxy Productions with our ideas, and as always, they were excited to help us bring the vision to life. 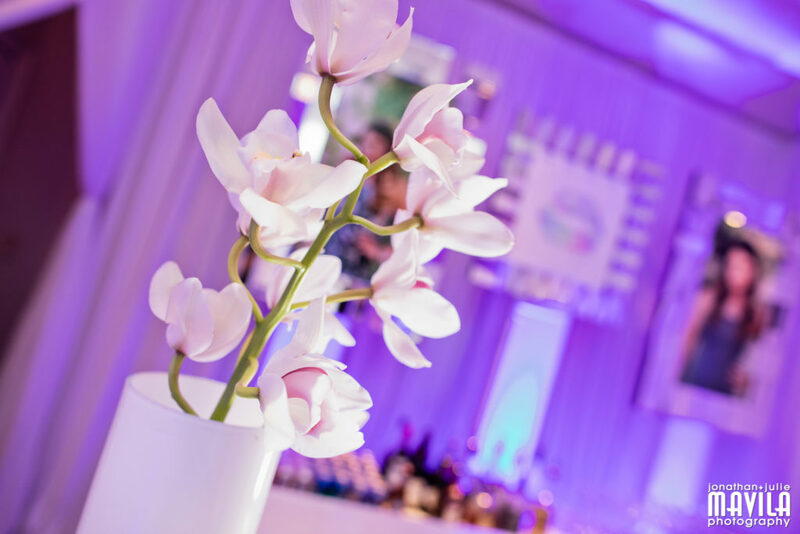 Lounge areas with white furnishings, custom logo pillows, and silver beaded curtains would add a fun and playful element, while communal tables and high tops with plenty of candles and orchids added an elegant touch. 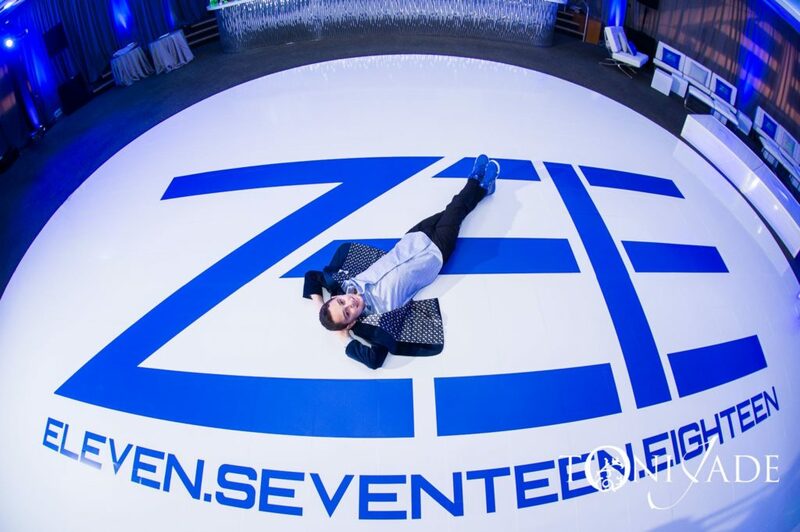 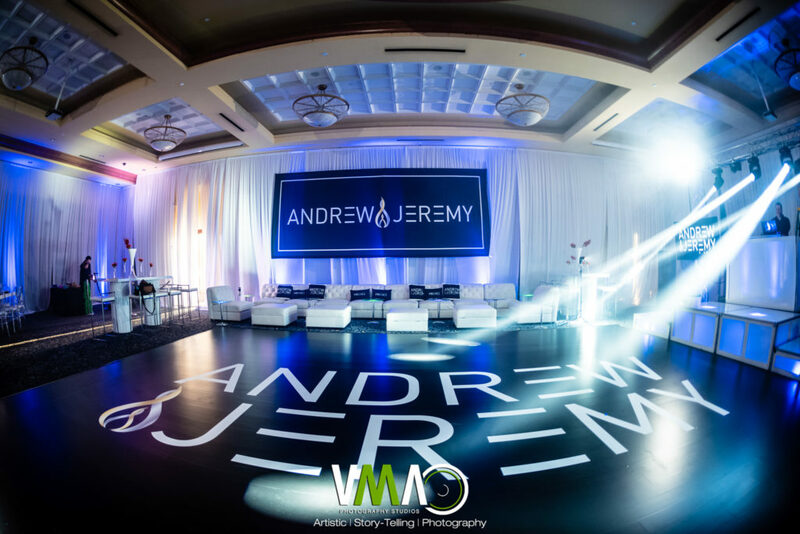 The wrapped dance floor with enormous holographic lips was the focal point and WOW! 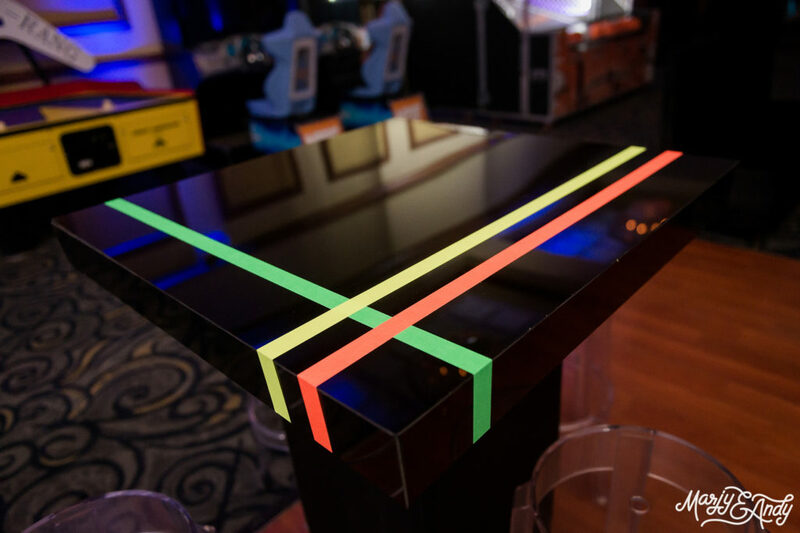 factor to complete the design. 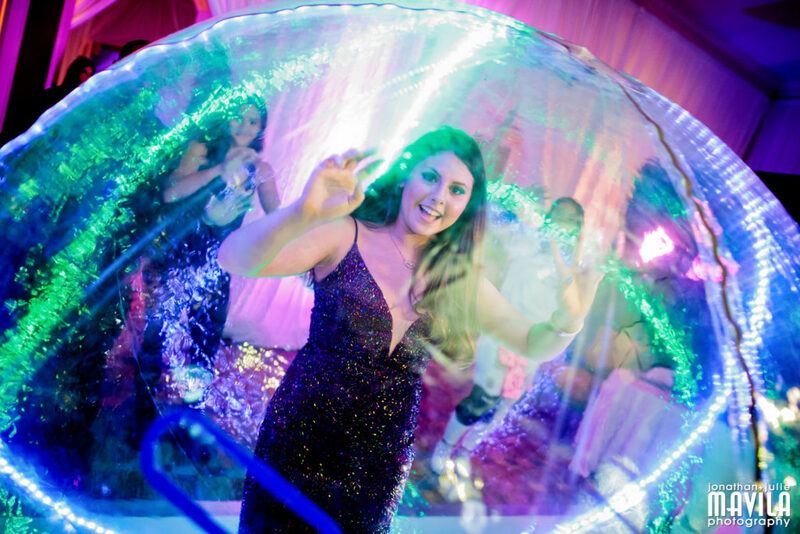 Our GOH wanted a unique entrance, so she entered her party in a giant light up inflatable ball. 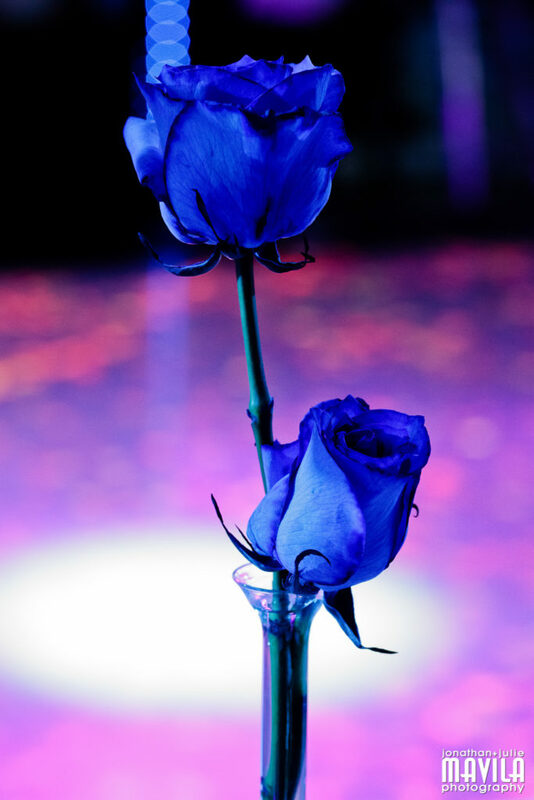 Throughout the evening Rock with U Entertainment (RWU) tossed some fabulous prizes on the dance floor. 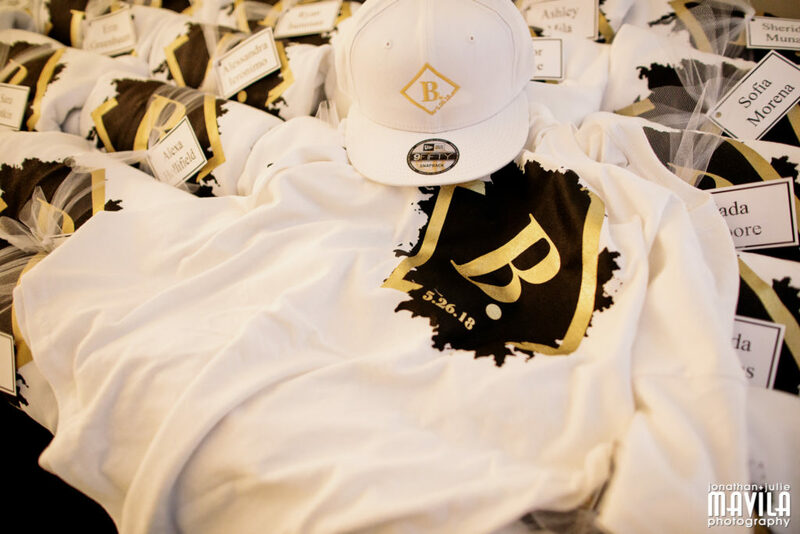 From Kylie Jenner Lip Kits and Swell bottles to t-shirts and Yeezies, the crowd went wild perfecting their best dance moves. 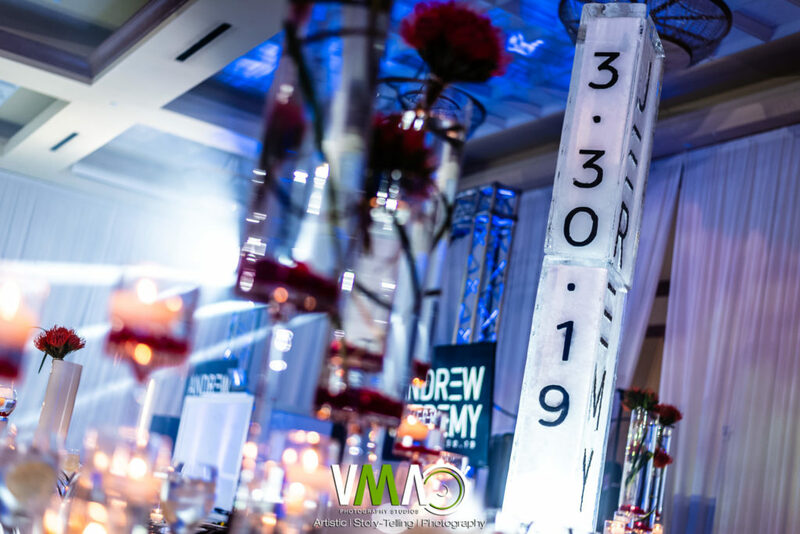 However, the best moves of the night were during the Daddy/Daughter dance where the duo showed off their choreographed moves taught by RWU MC Chris. 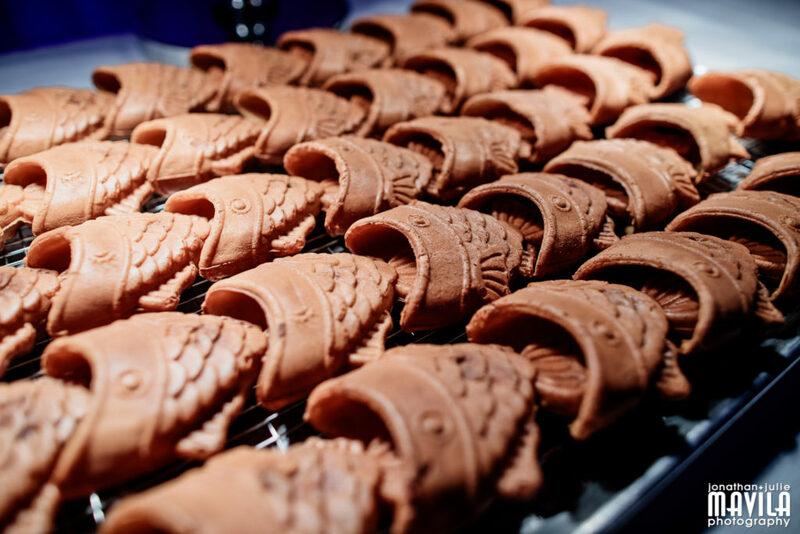 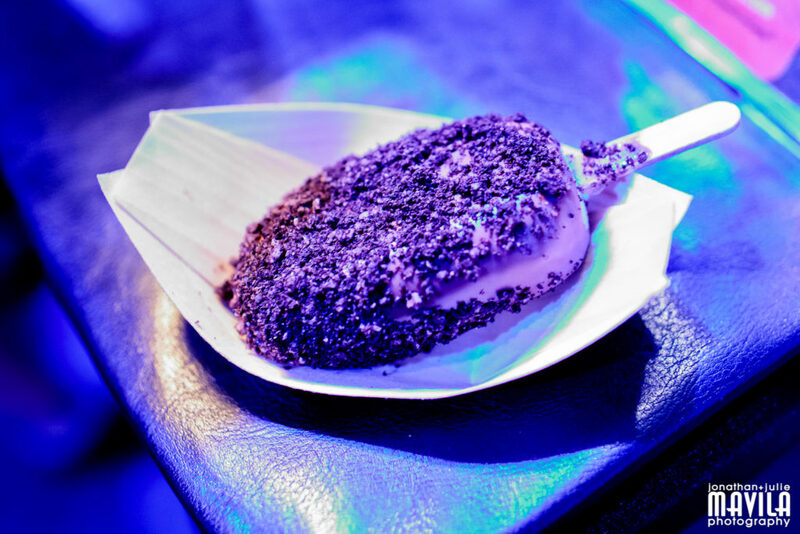 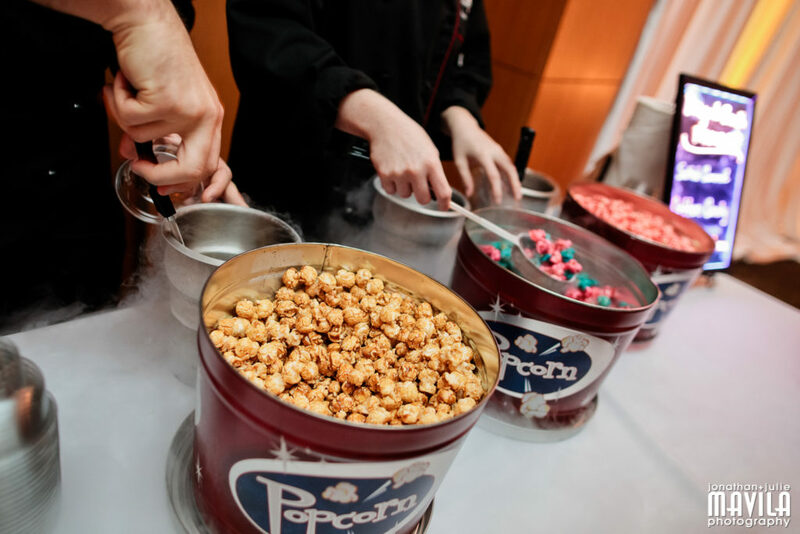 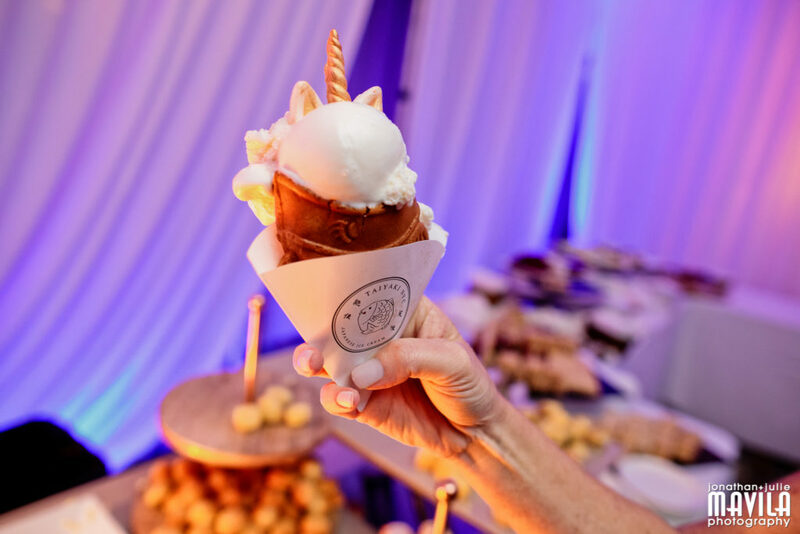 The Farmer’s Table served up a most delicious feast of favorites and desserts before LiquidXCreme and Taiyaki NYC came in with some tasty nitrogen popcorn and fancy Japanese ice cream. 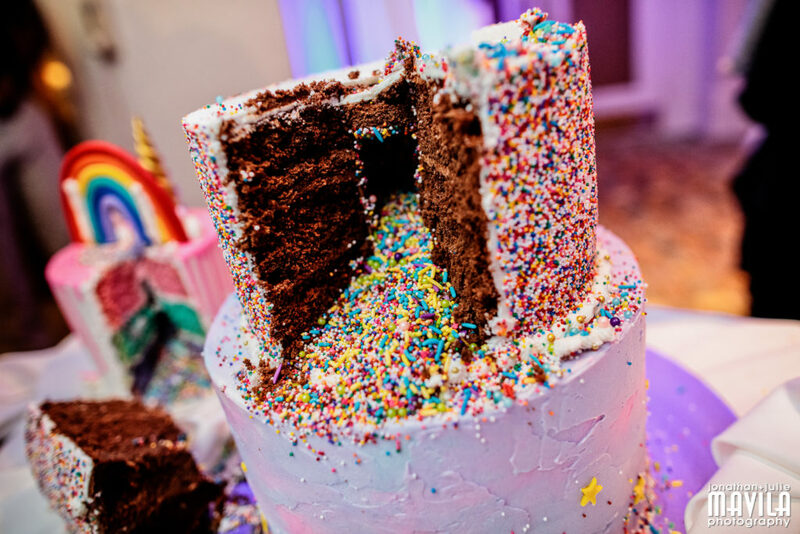 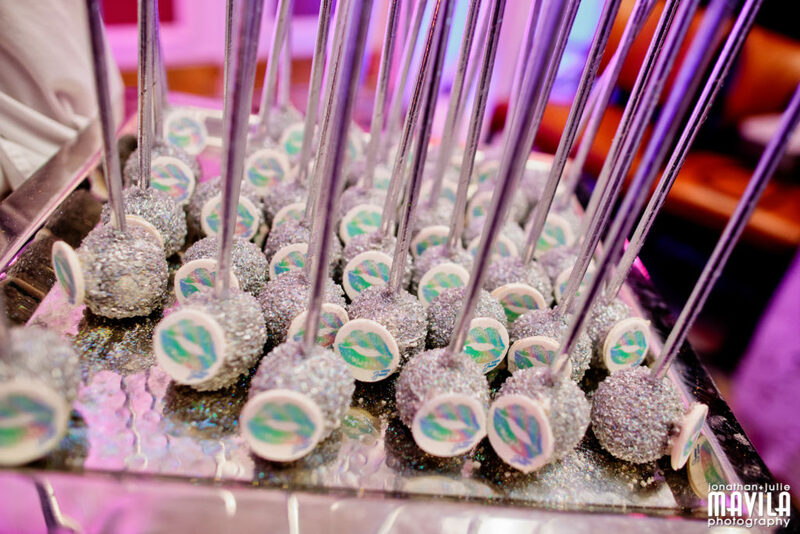 But, just when guests thought they couldn’t eat anymore, they had to indulge in a special unicorn piñata cake by Bettersweet Bites and amazing cake pops by The Bakery Babes. 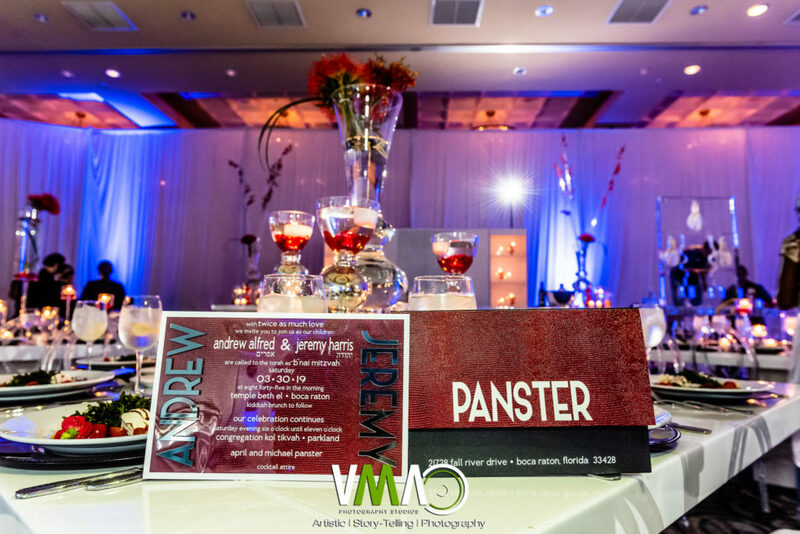 Both Jonathan of Mavila Photography and Jason Chandler of JC Video Productions captured all the love during the night. 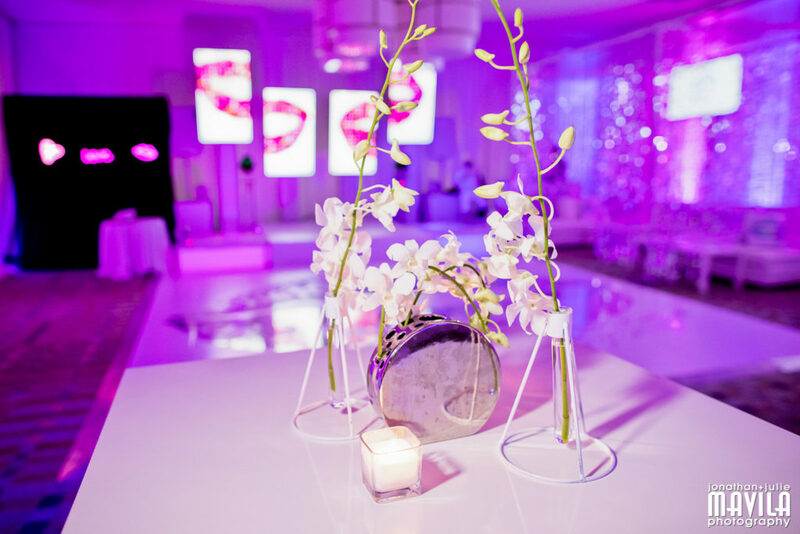 Sealing everything with a kiss always makes a STYLED EVENT. 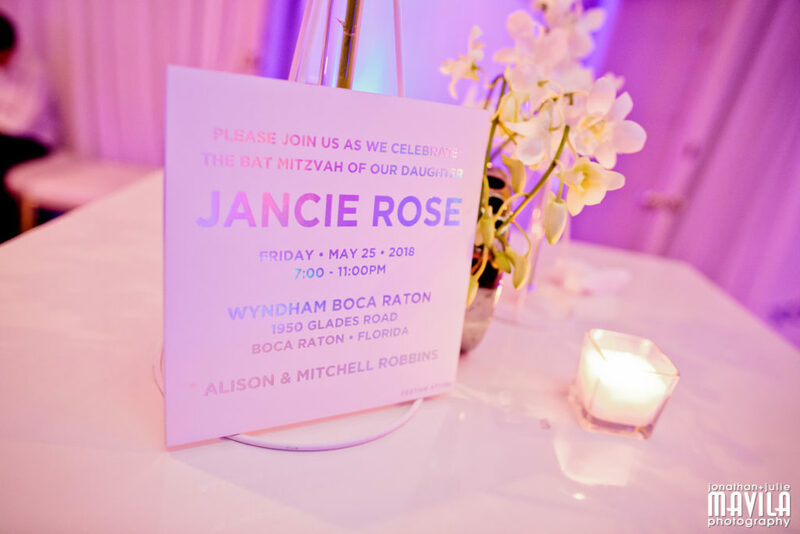 Mazel Tov again to Jancie and her family!